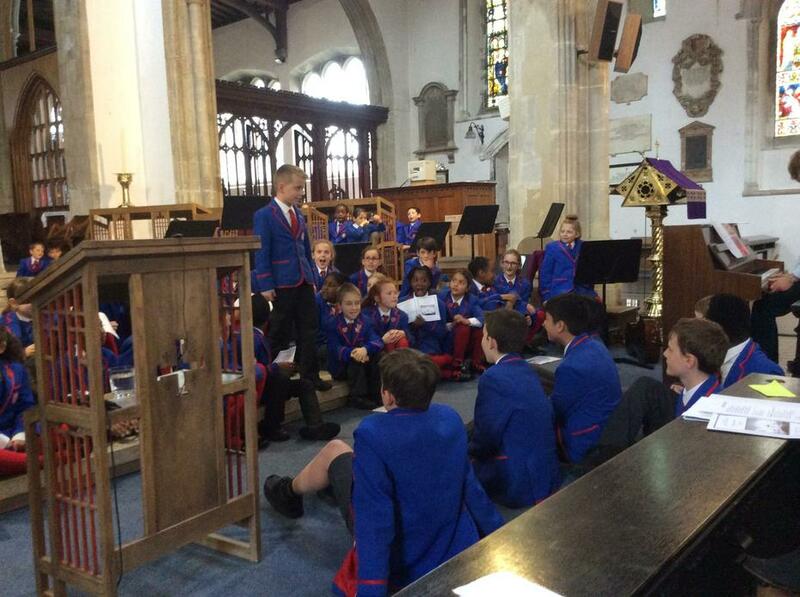 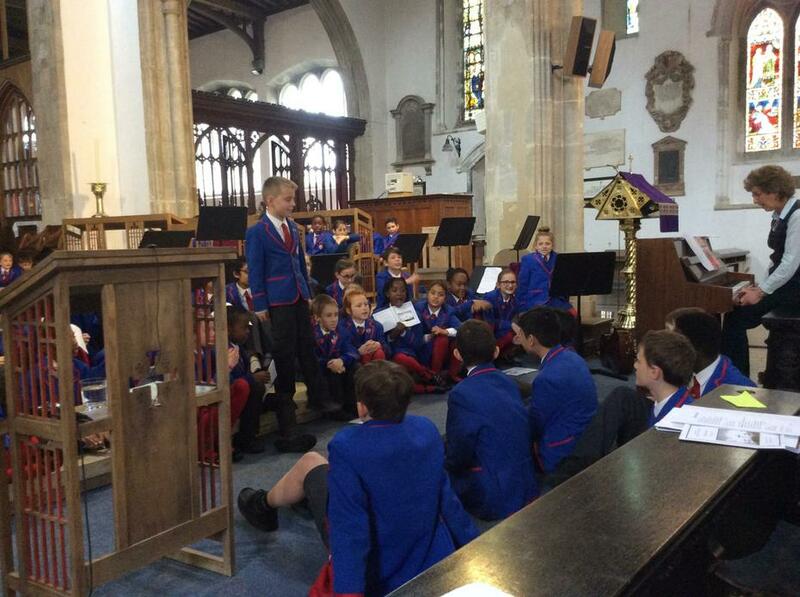 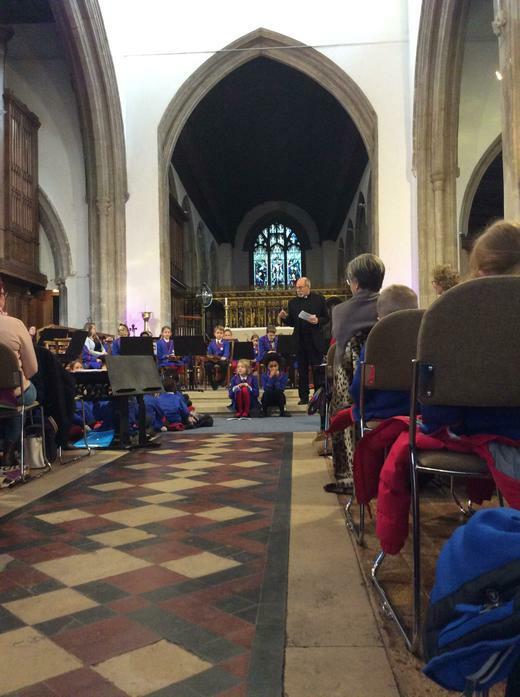 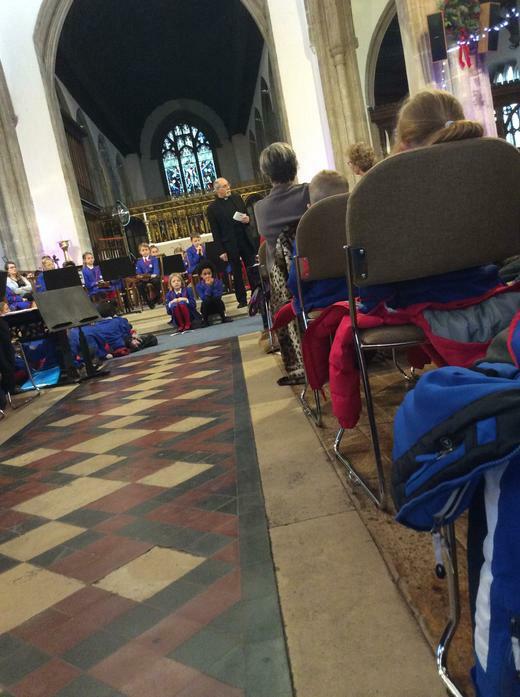 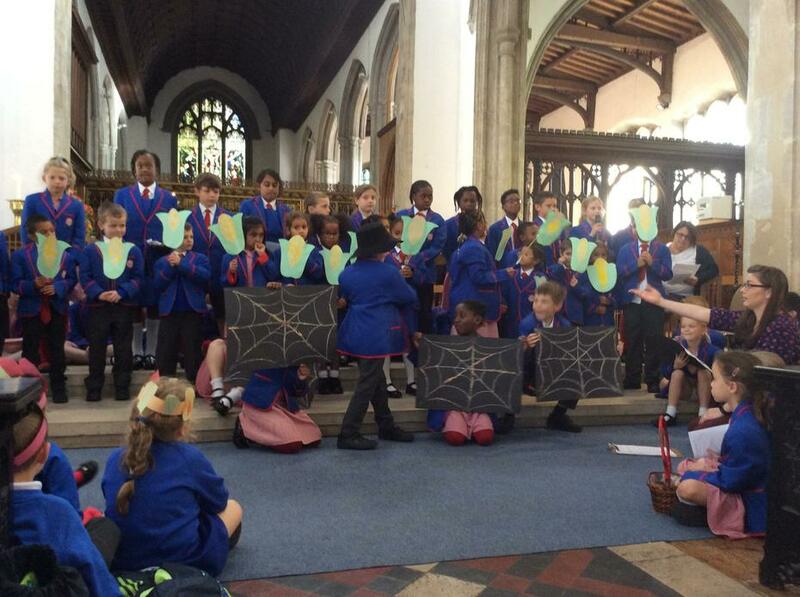 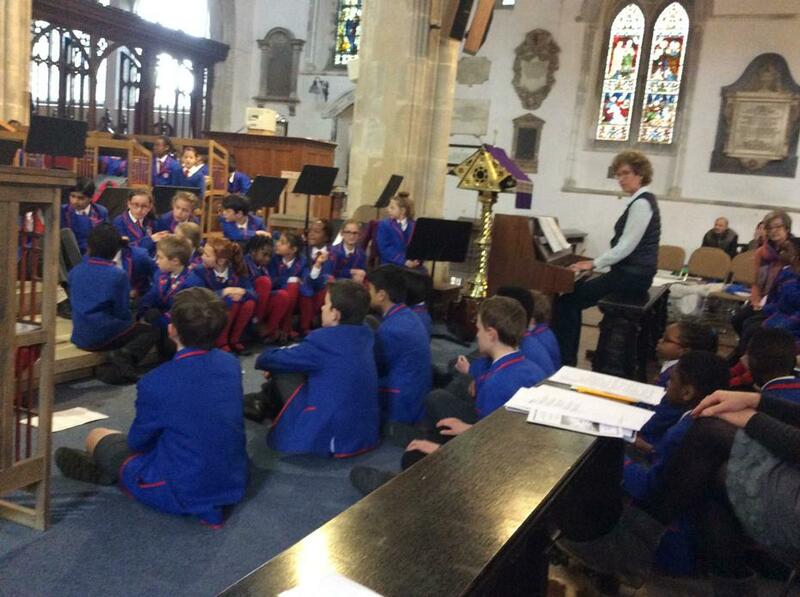 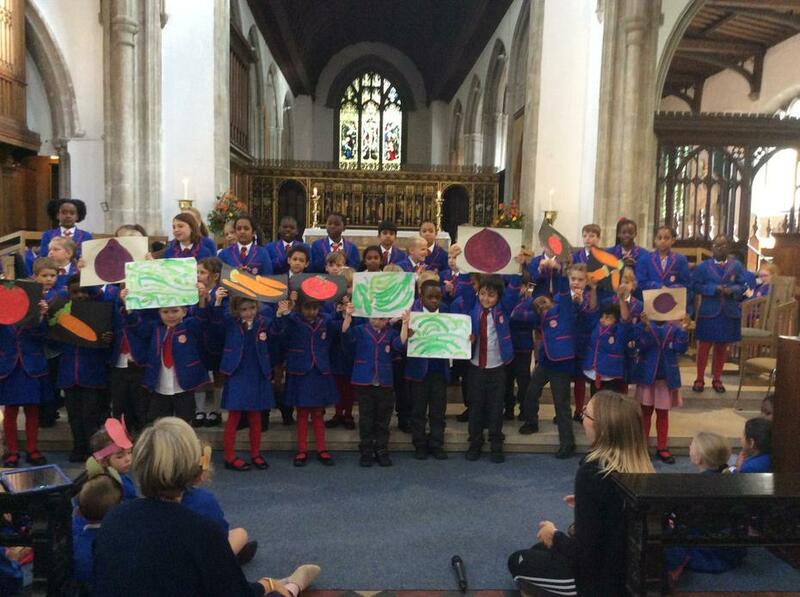 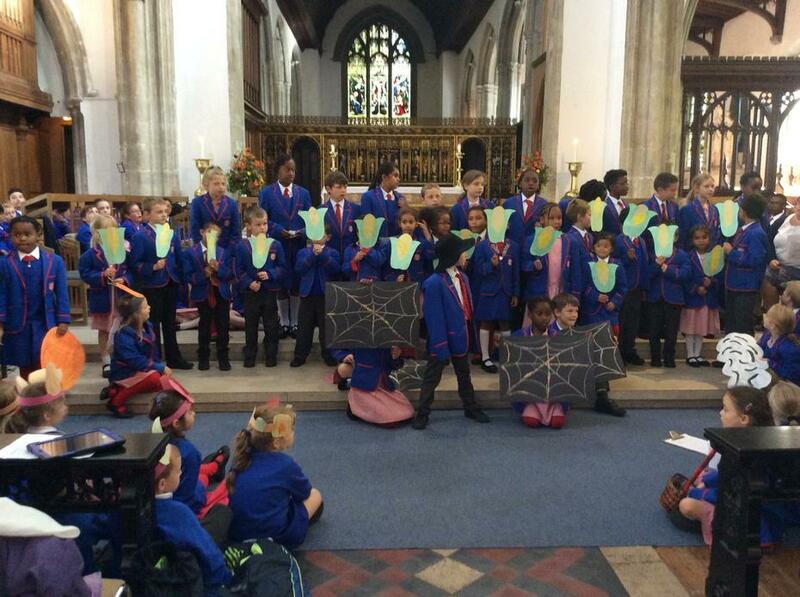 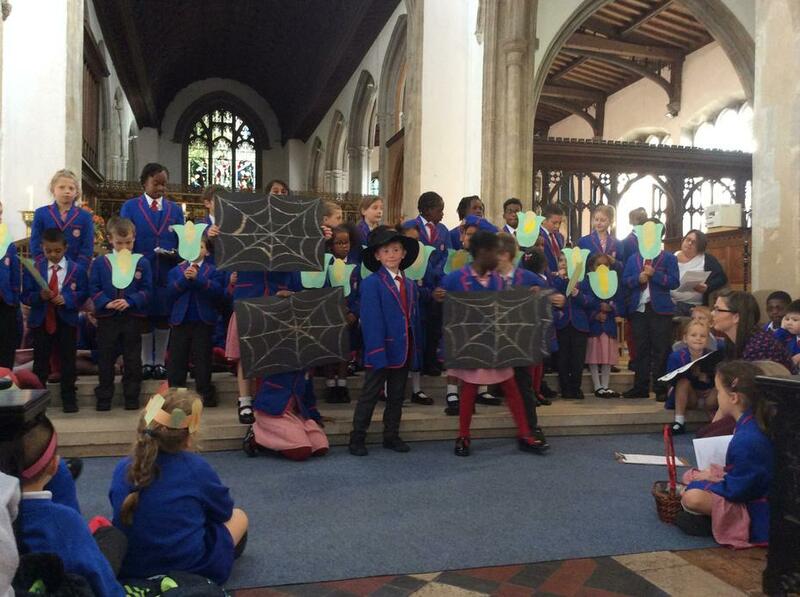 Our School is linked with 6 churches in High Wycombe and once a week we have clergy collective worship which is led by a member of the clergy from one of the six churches. 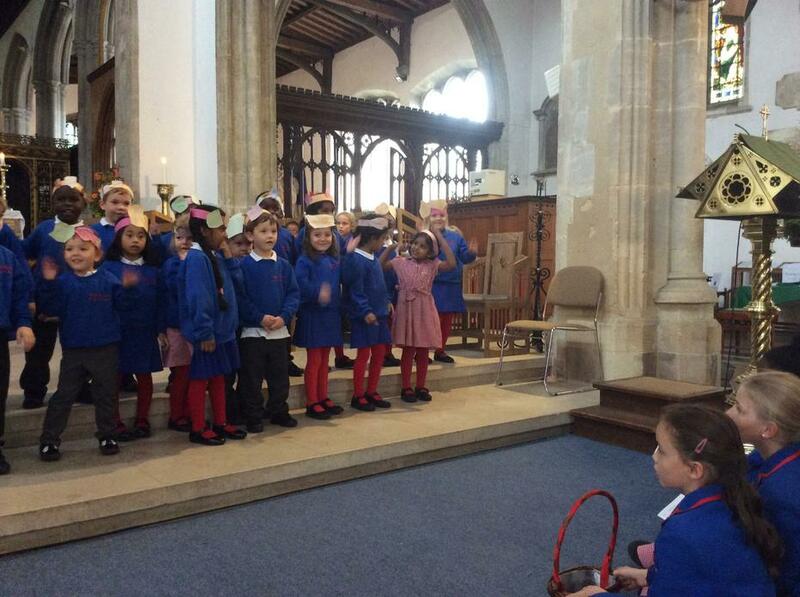 One of the churches is All Saints Church and the children worship there as a school community at Christmas, Harvest and Easter. 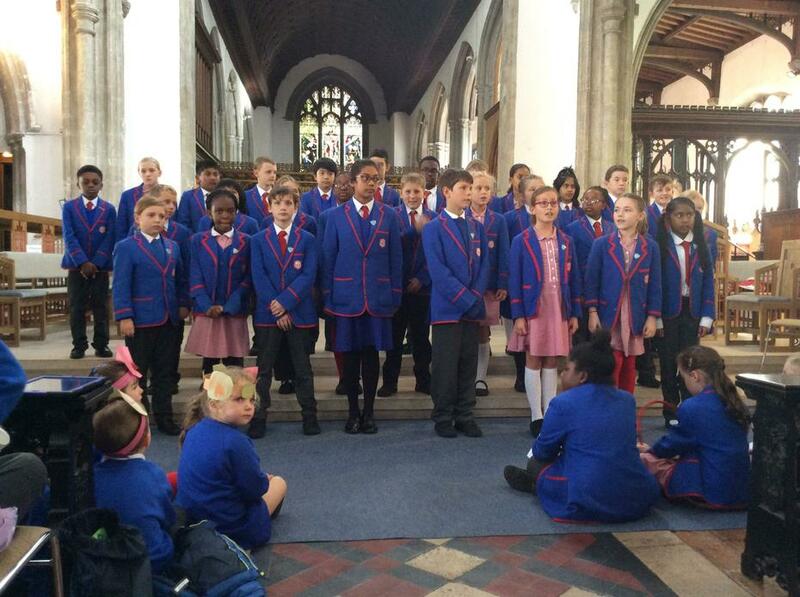 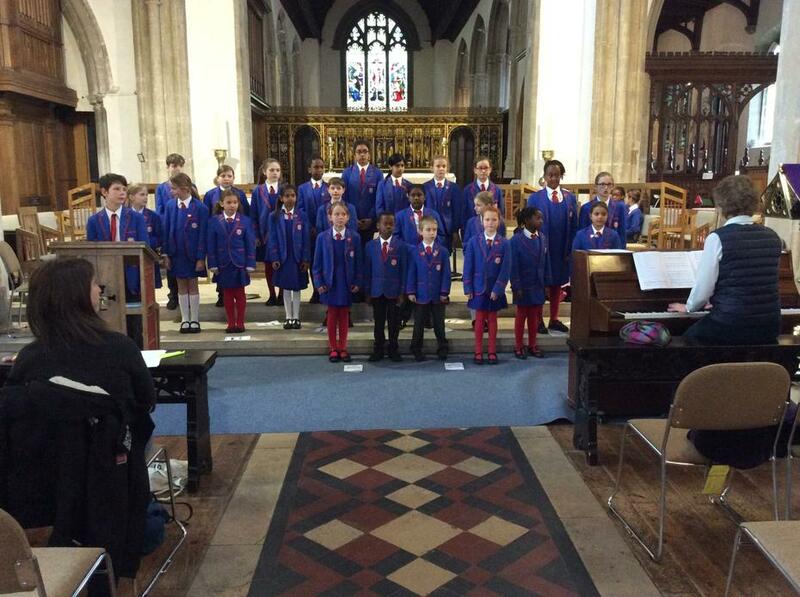 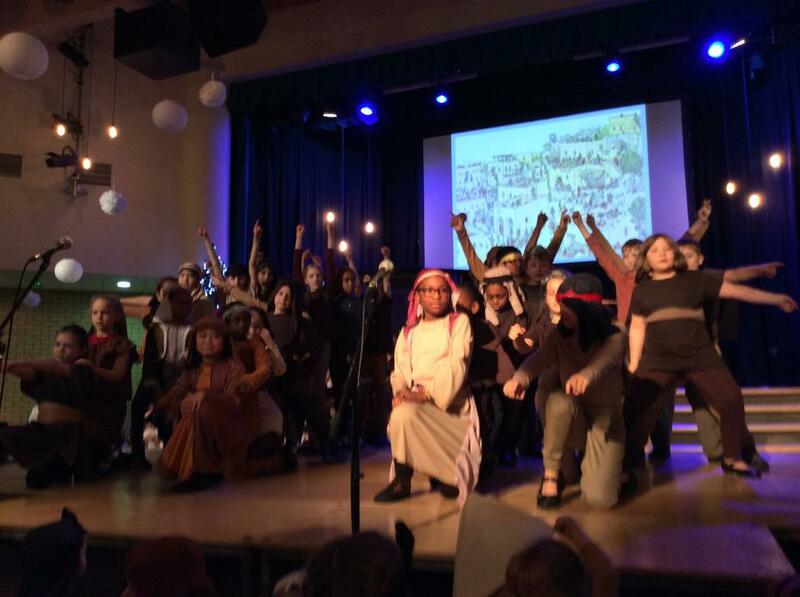 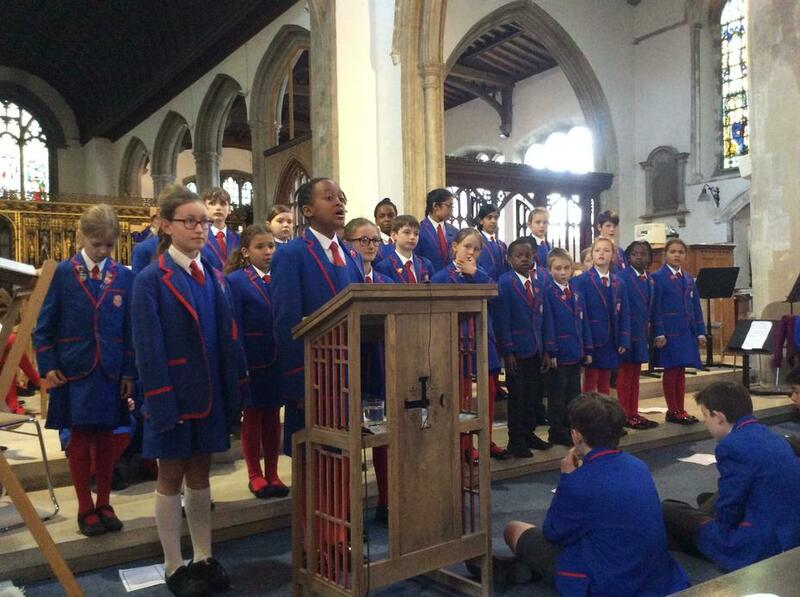 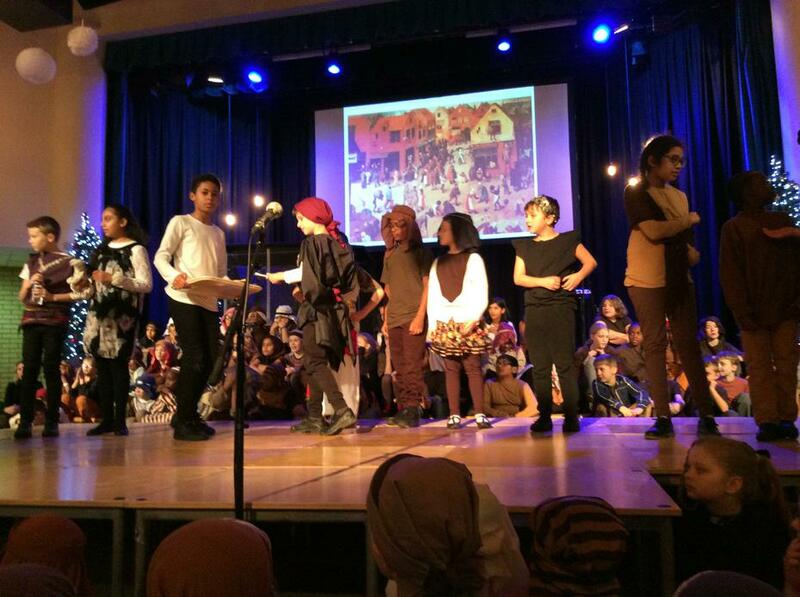 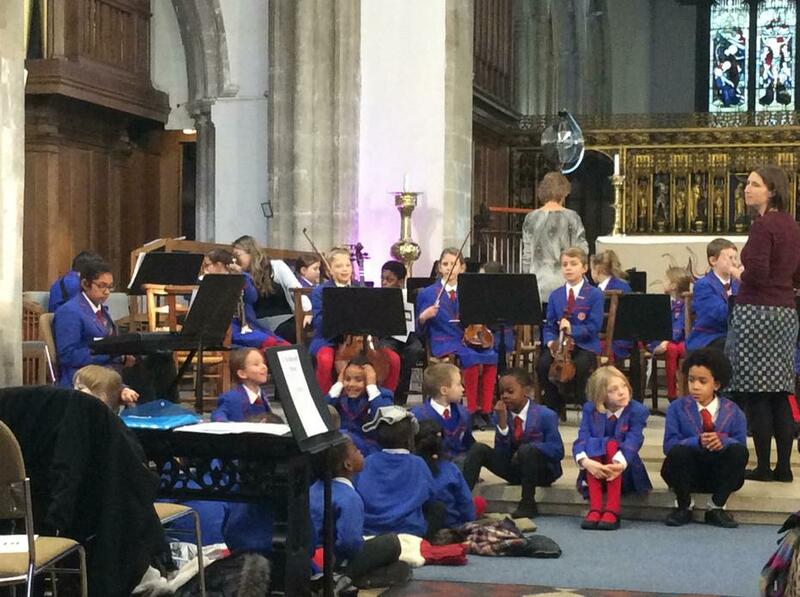 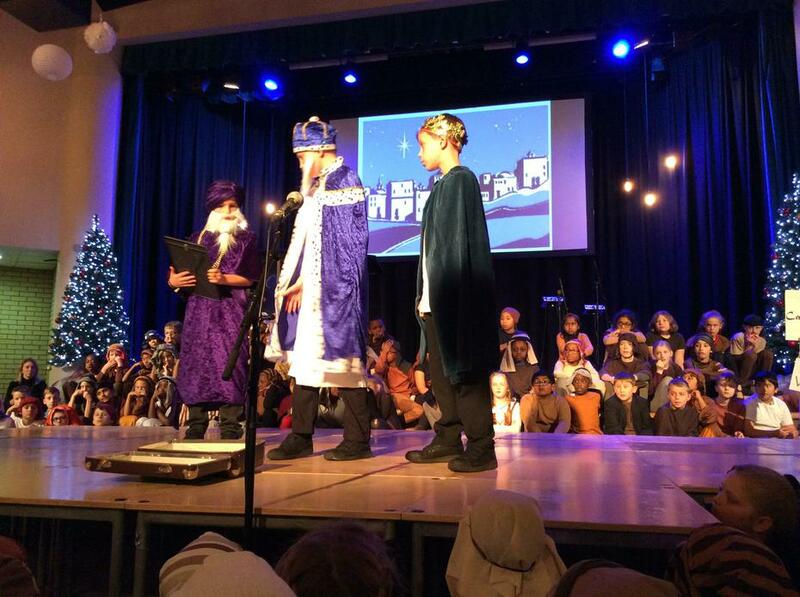 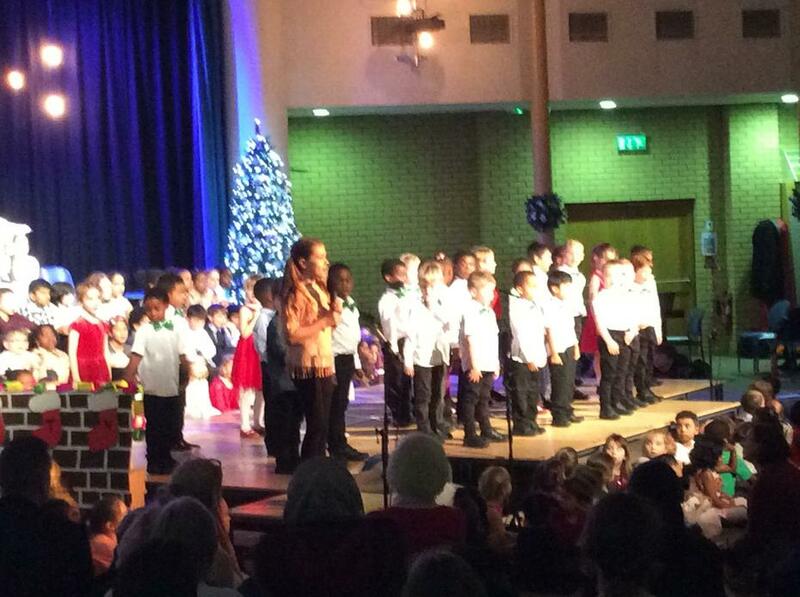 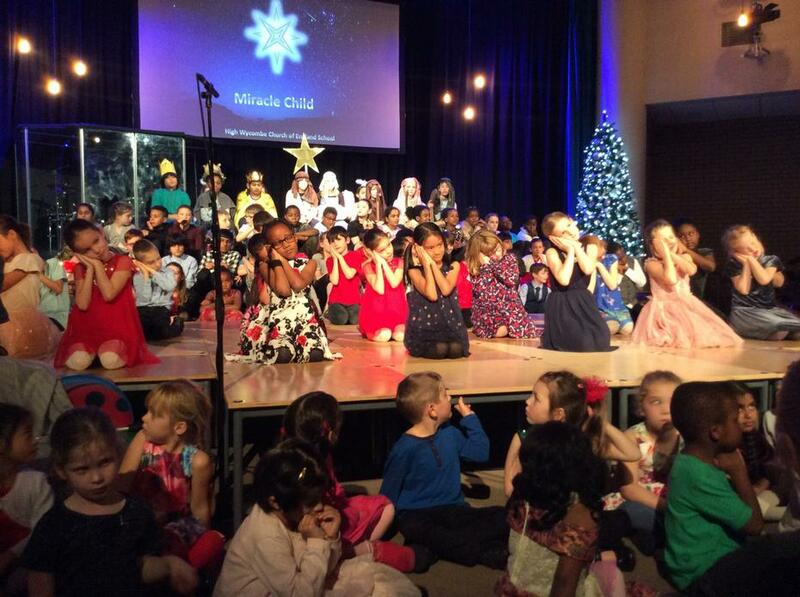 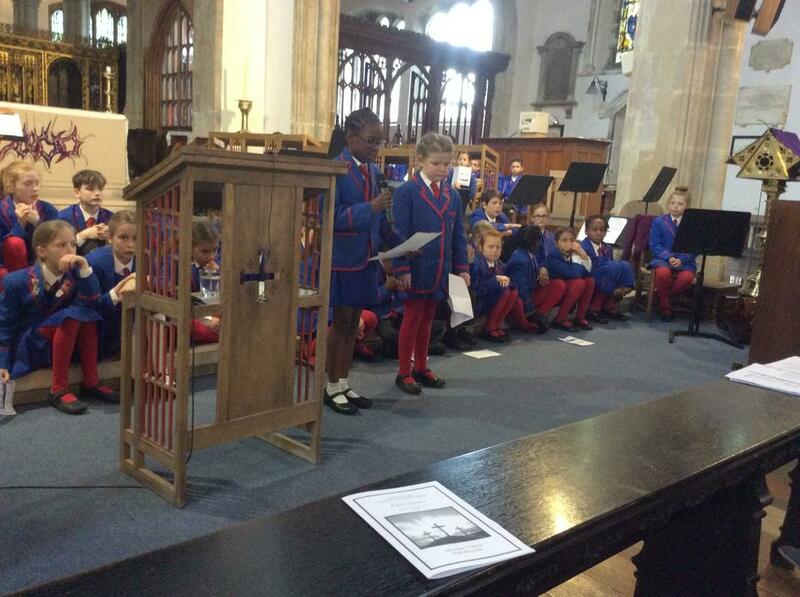 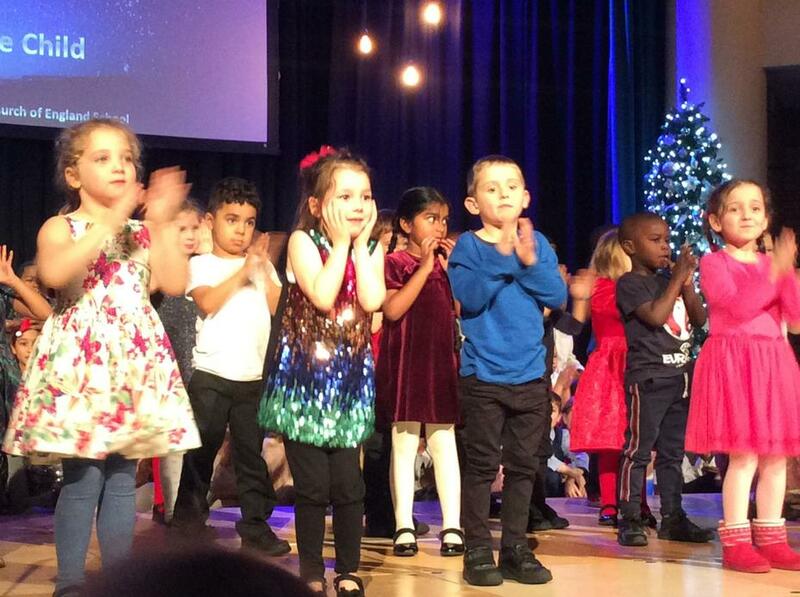 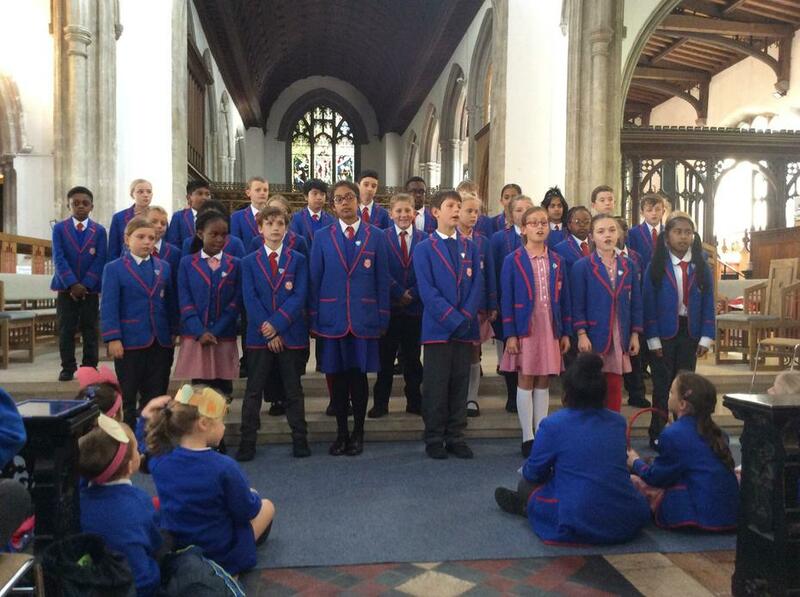 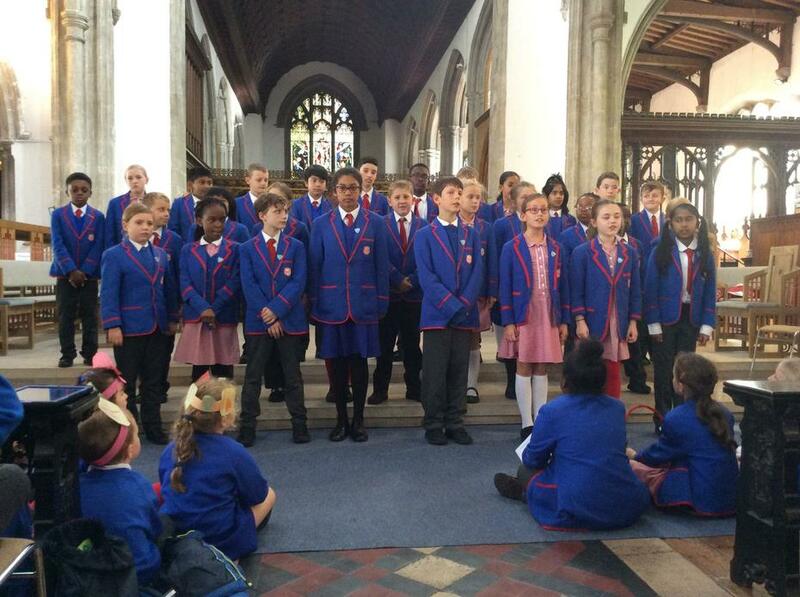 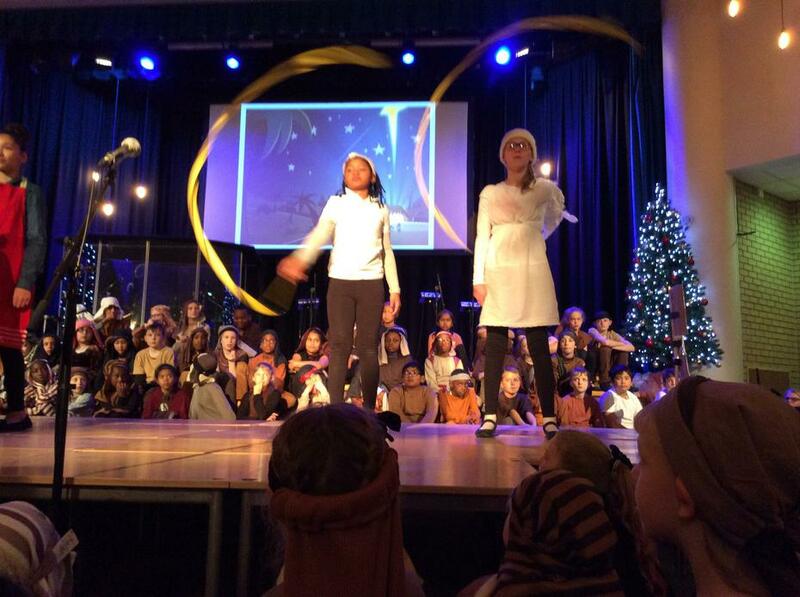 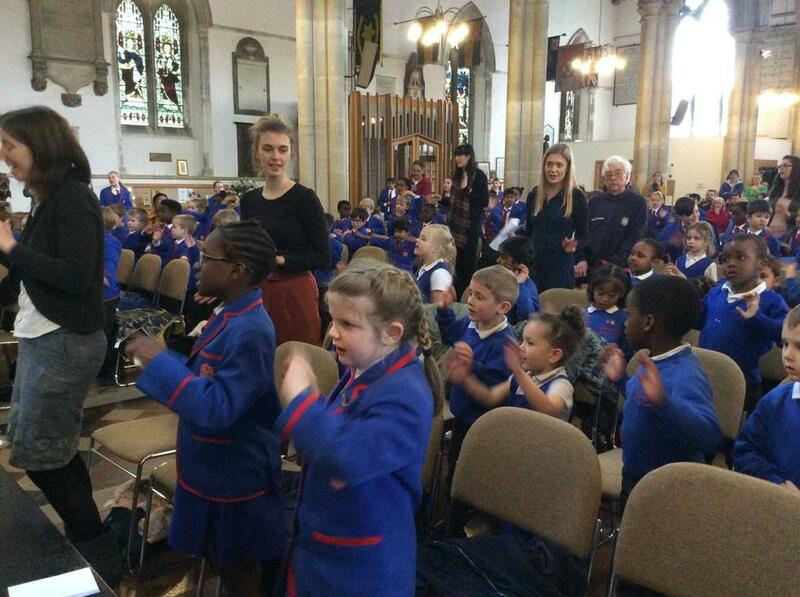 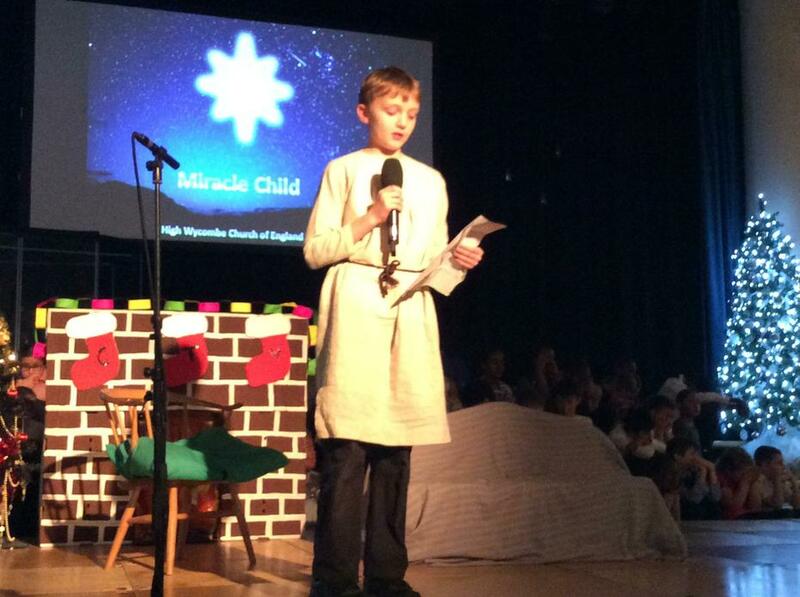 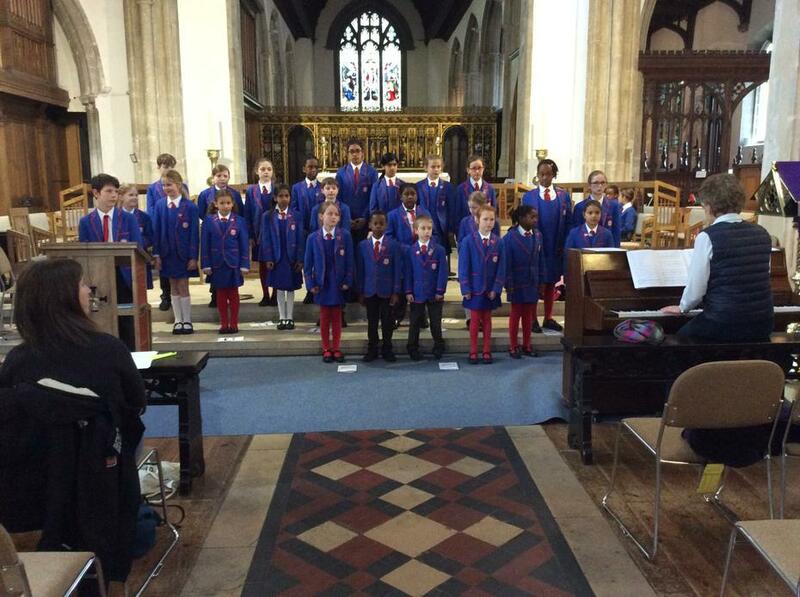 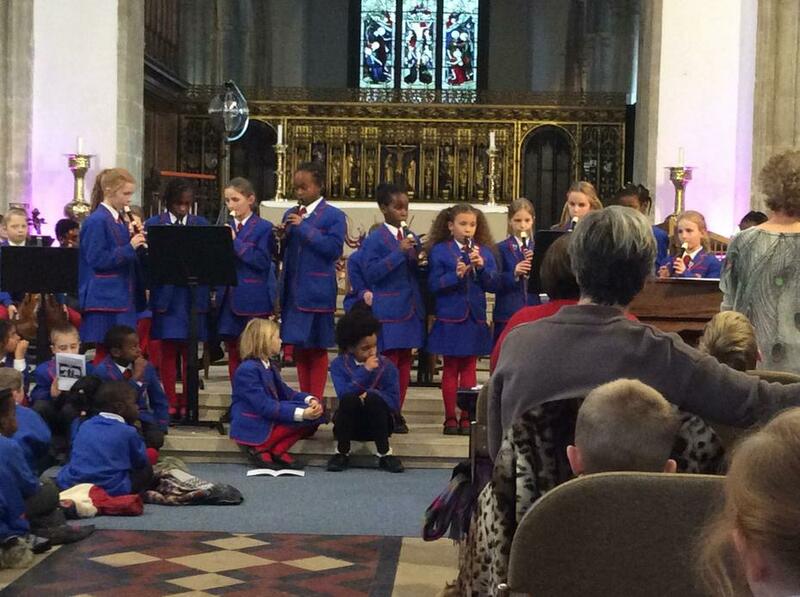 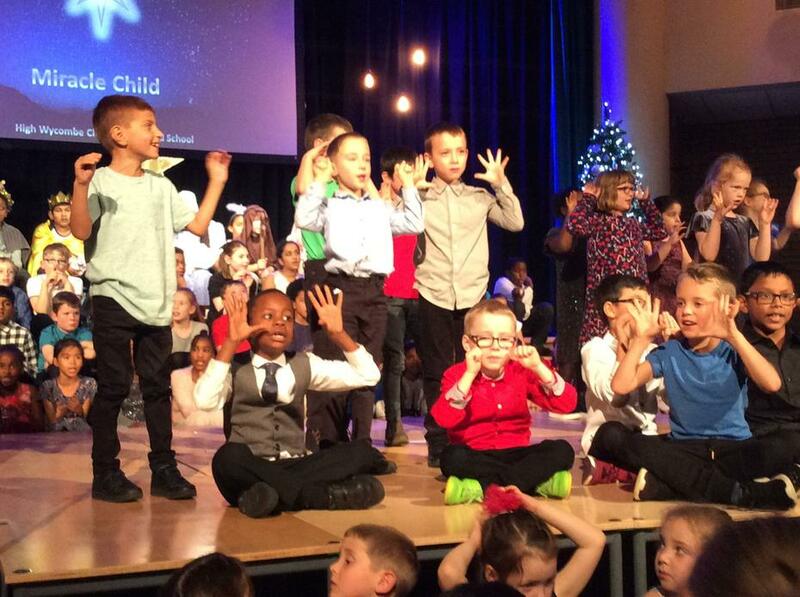 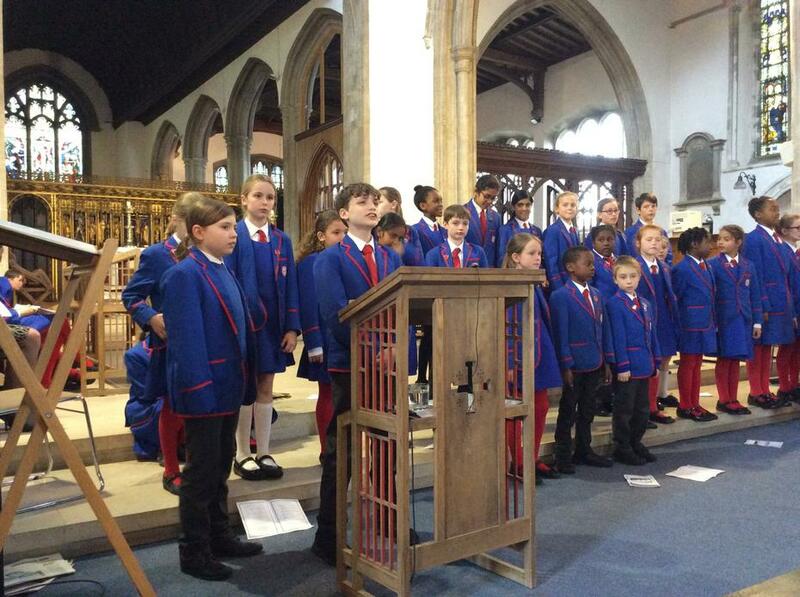 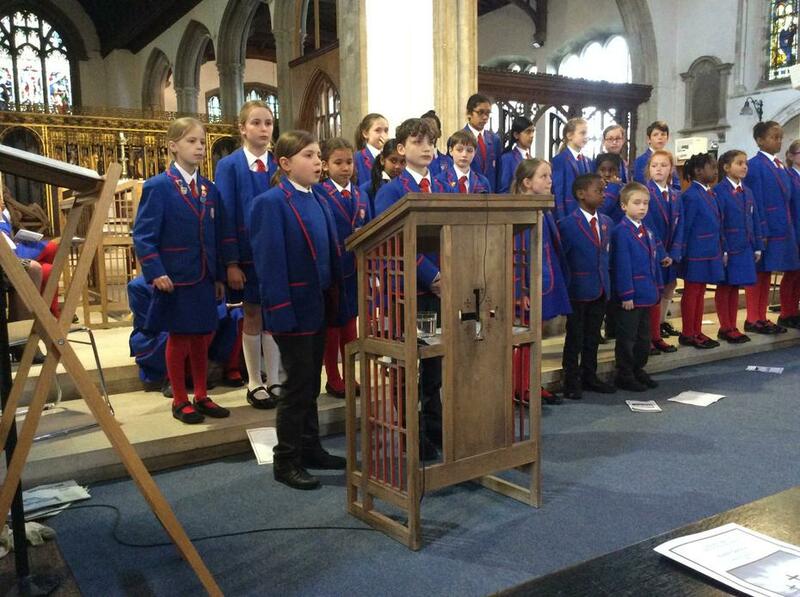 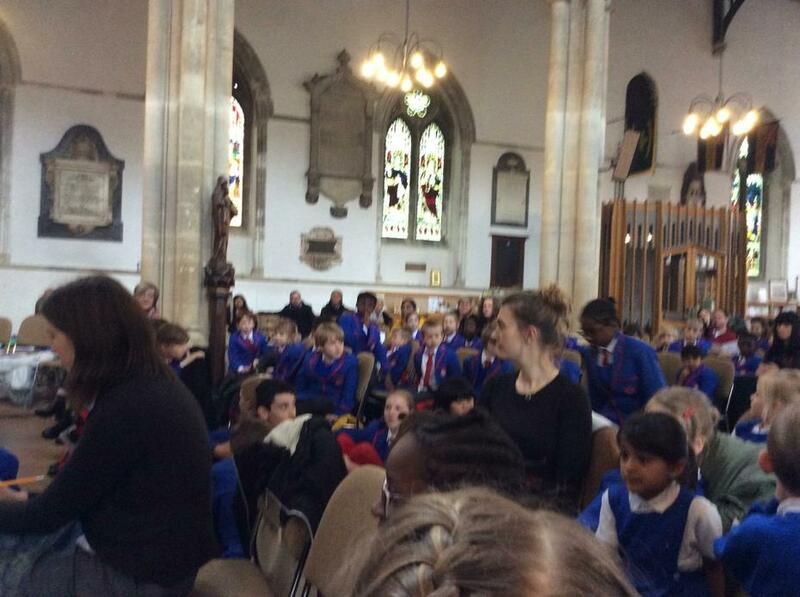 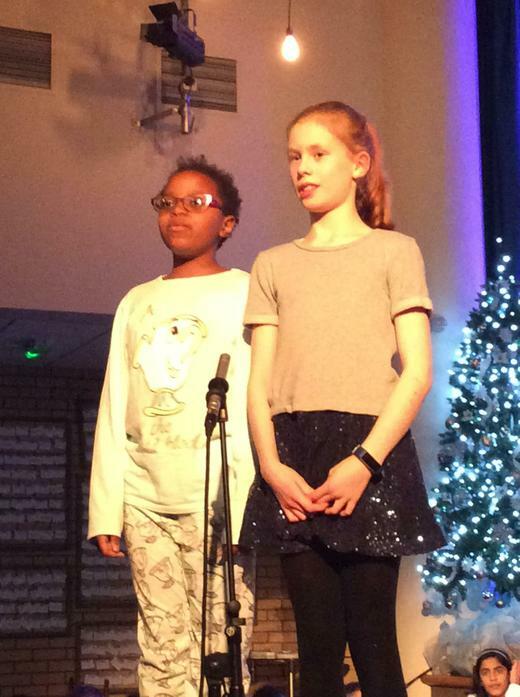 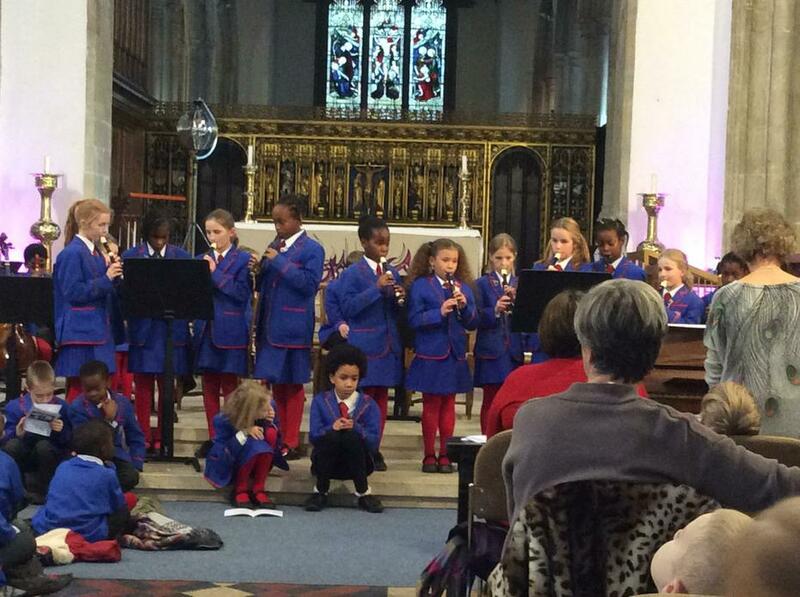 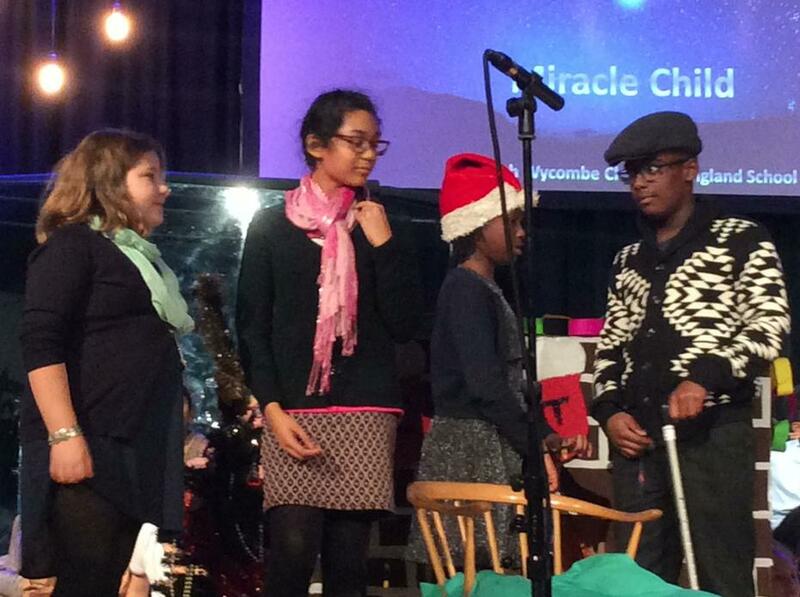 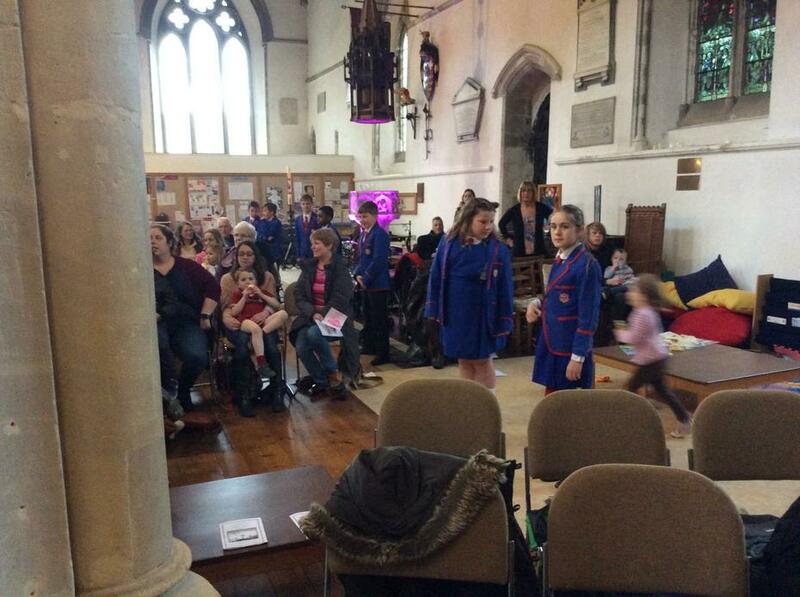 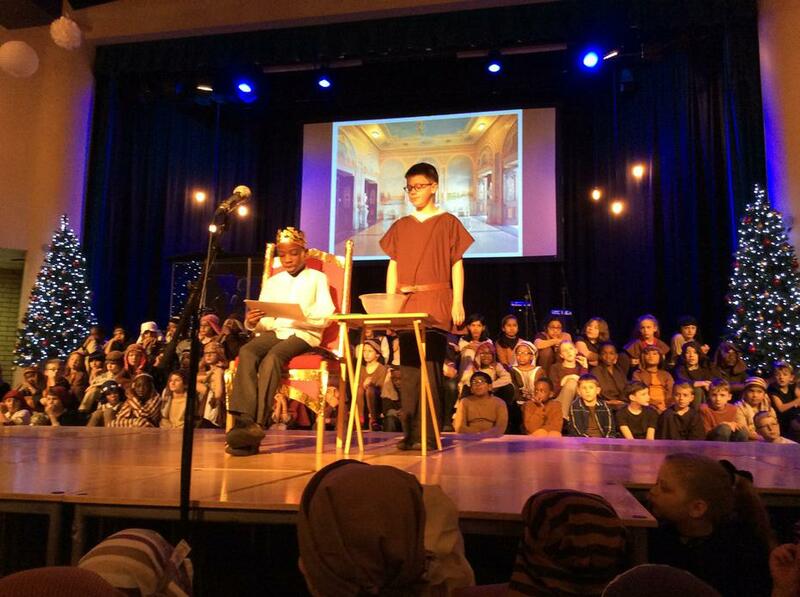 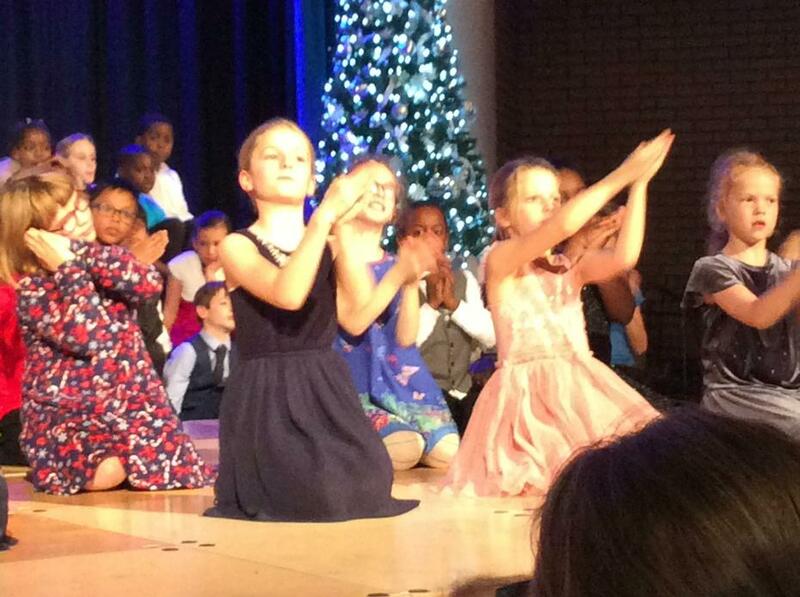 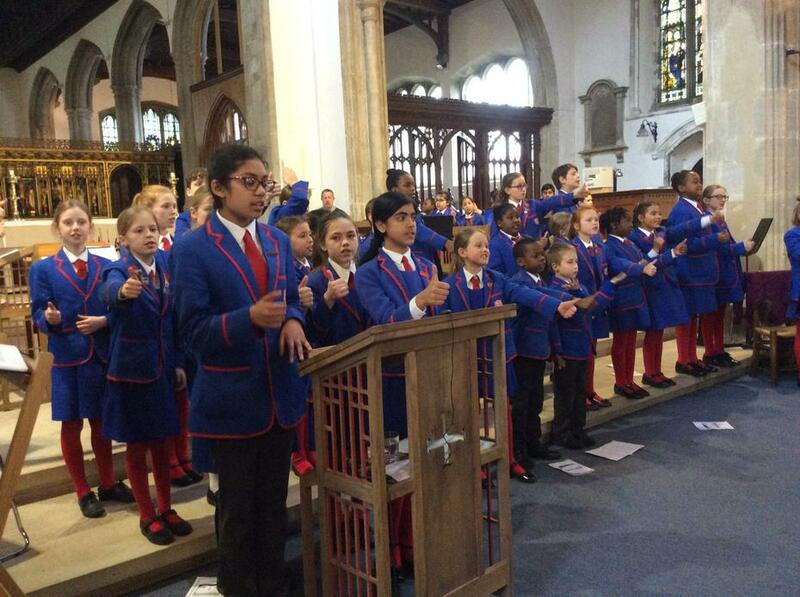 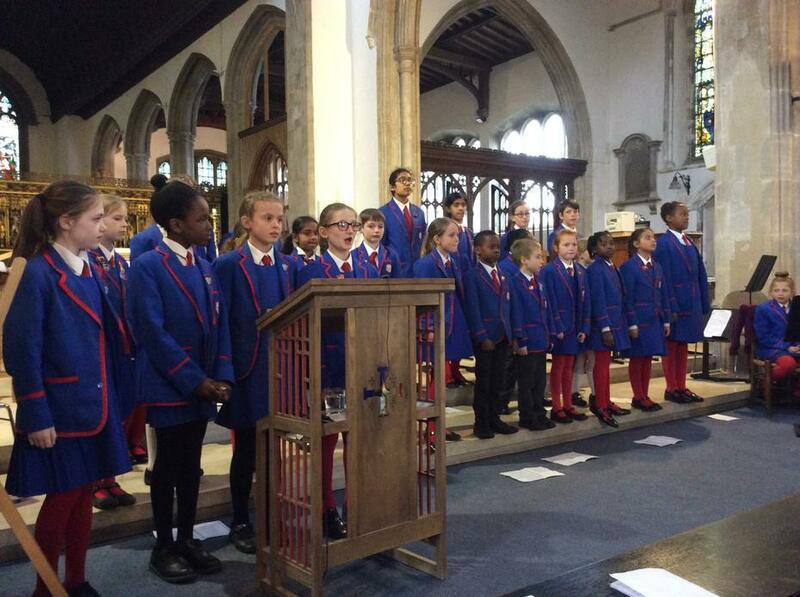 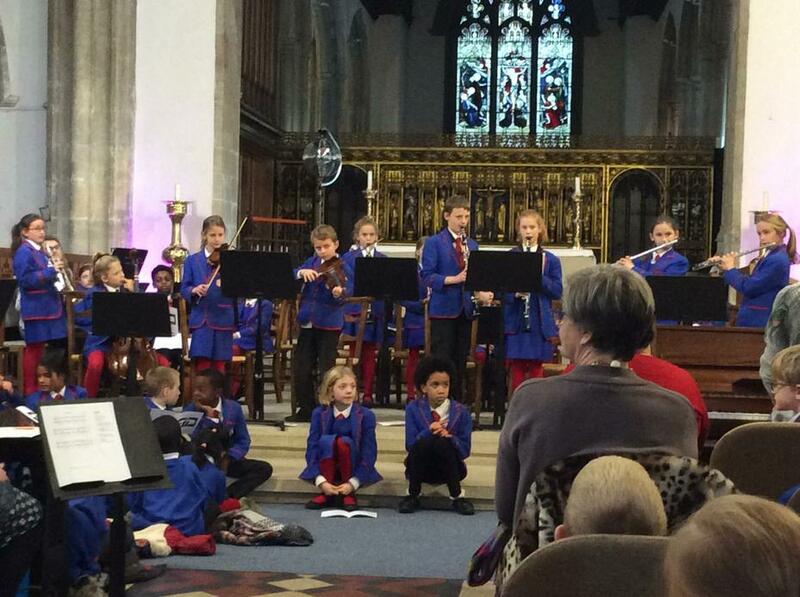 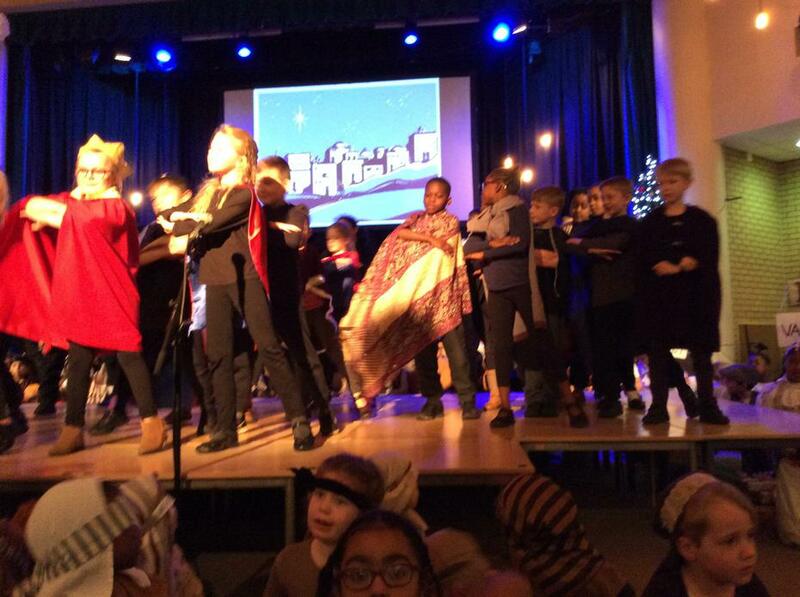 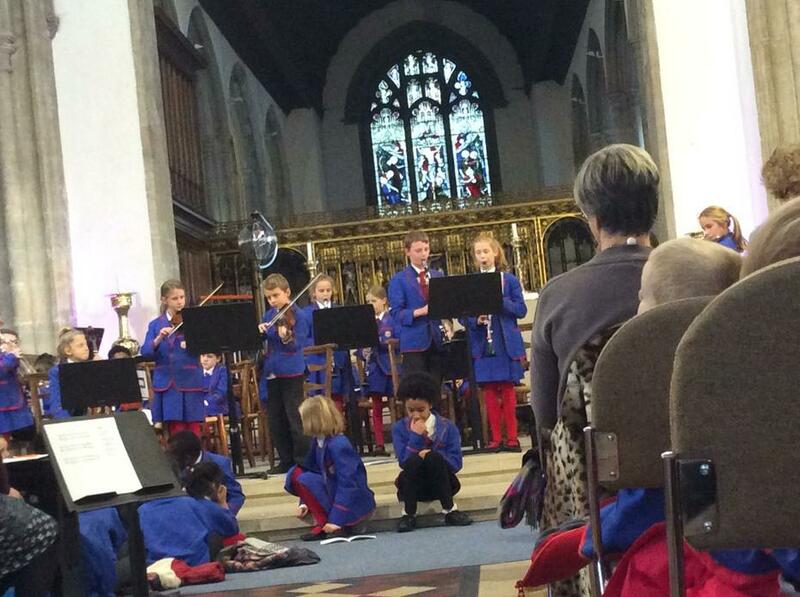 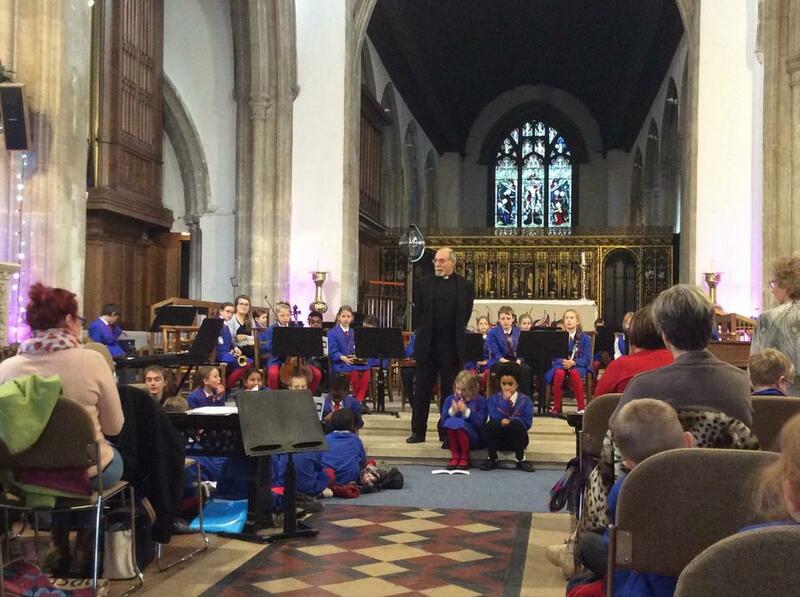 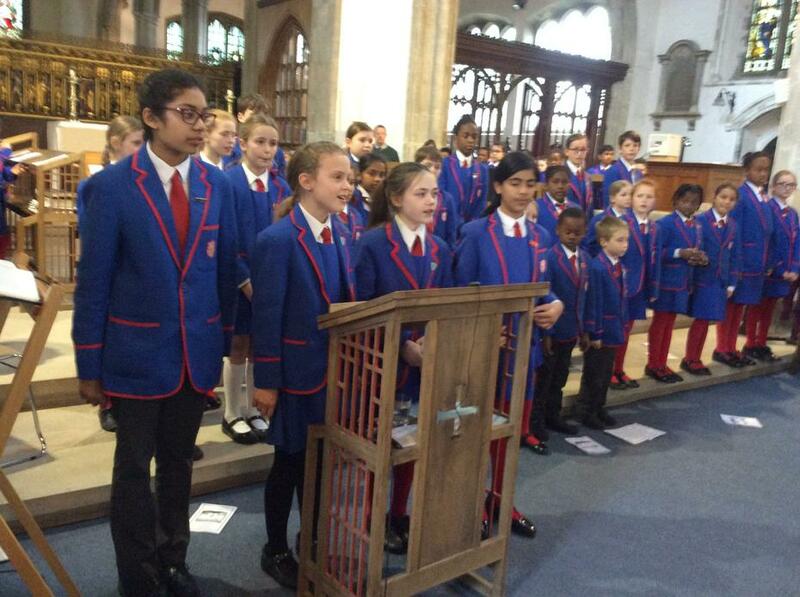 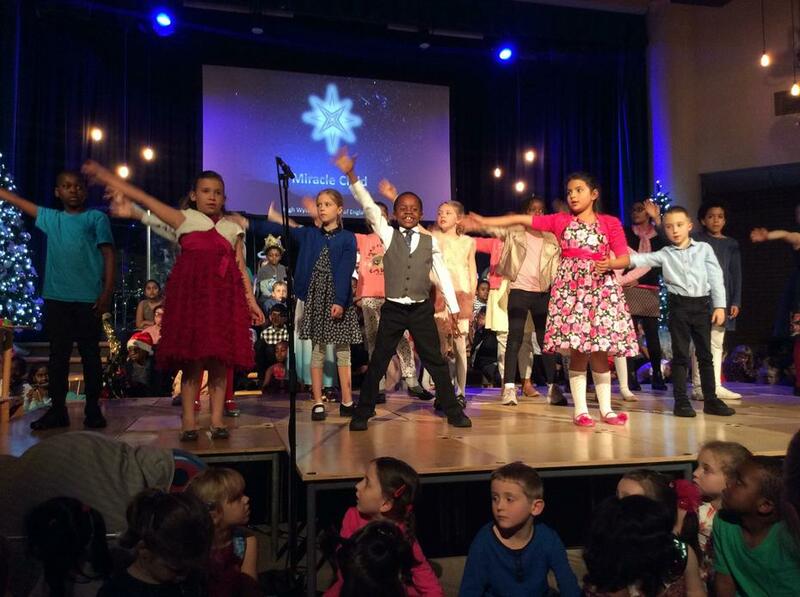 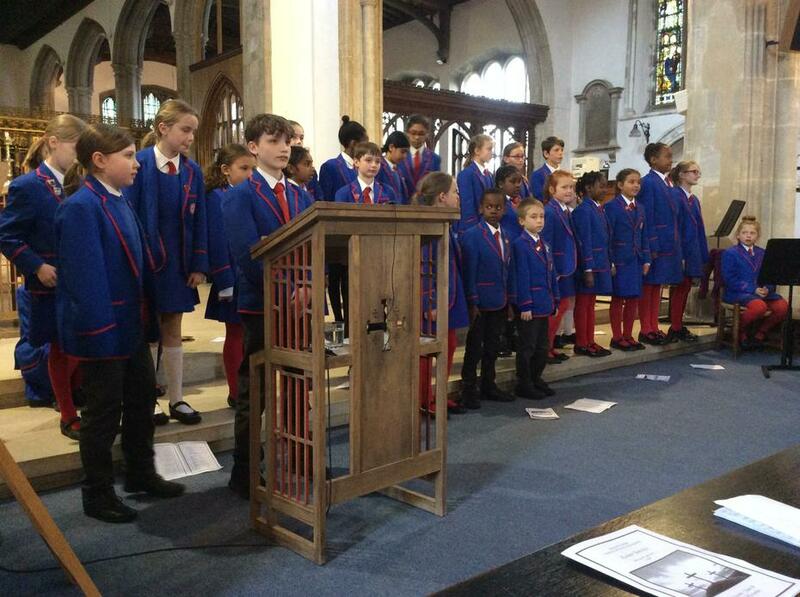 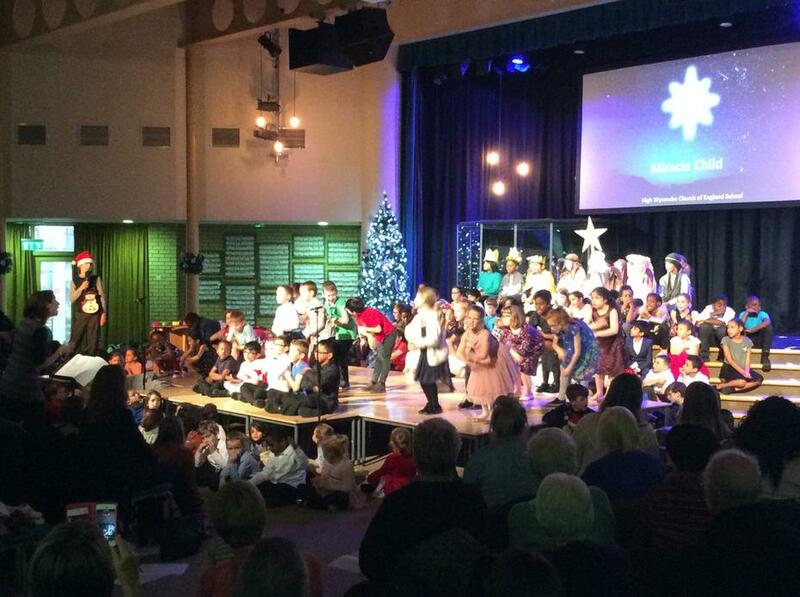 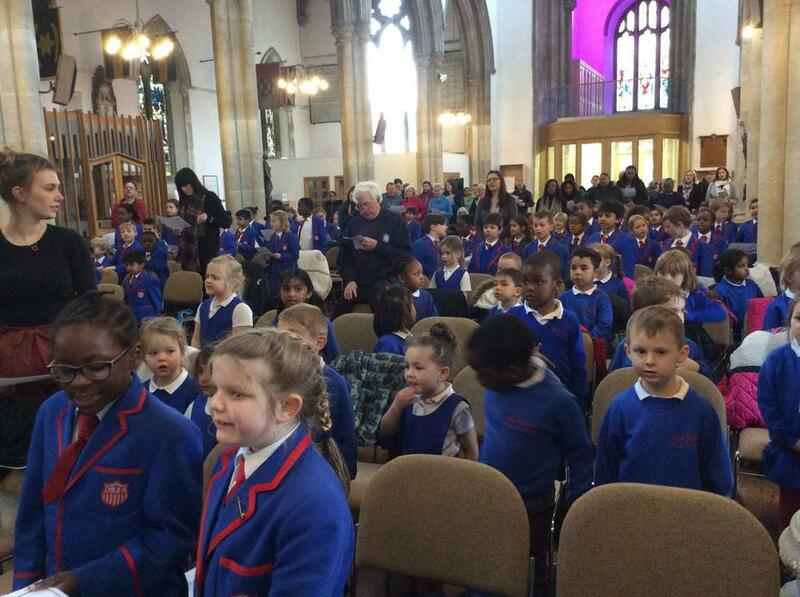 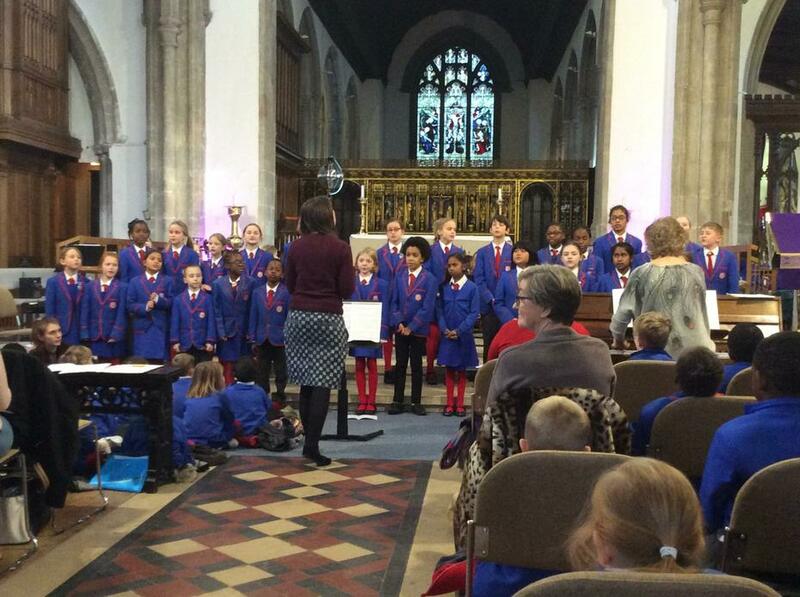 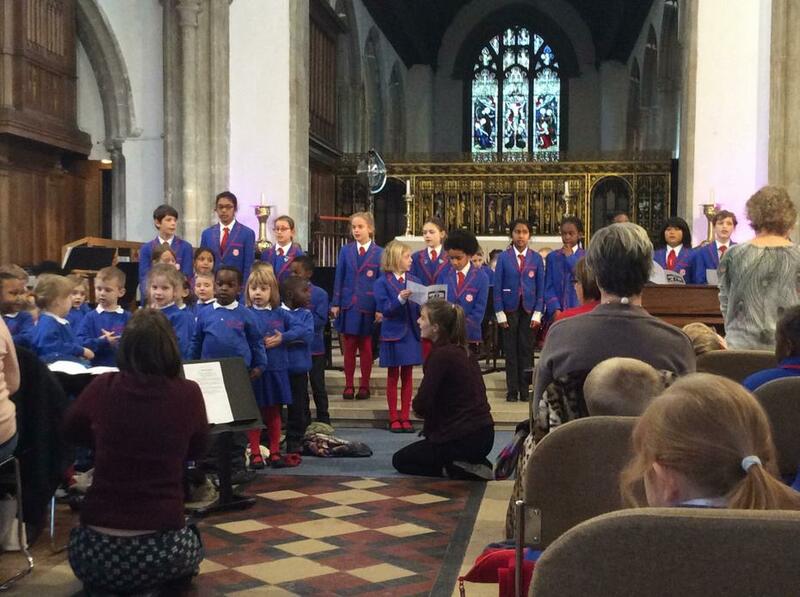 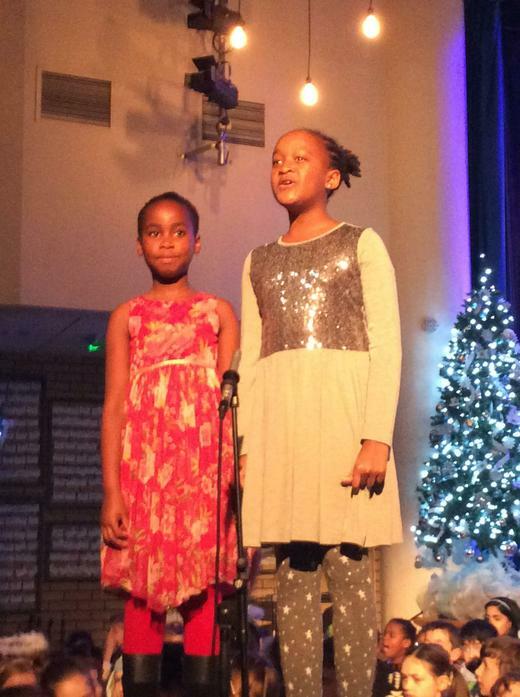 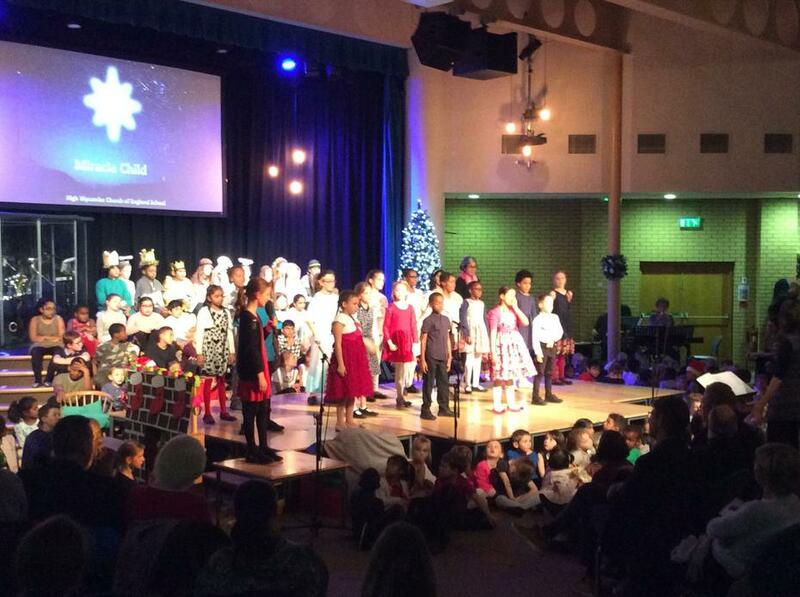 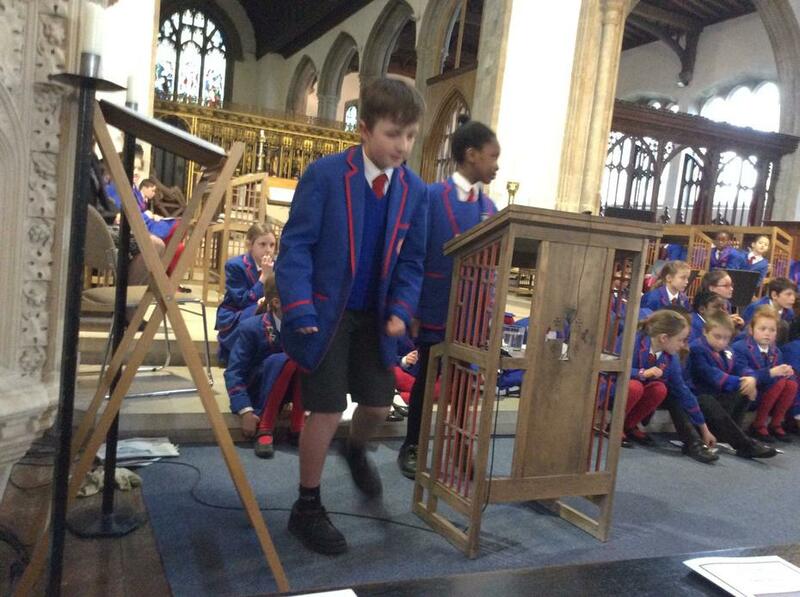 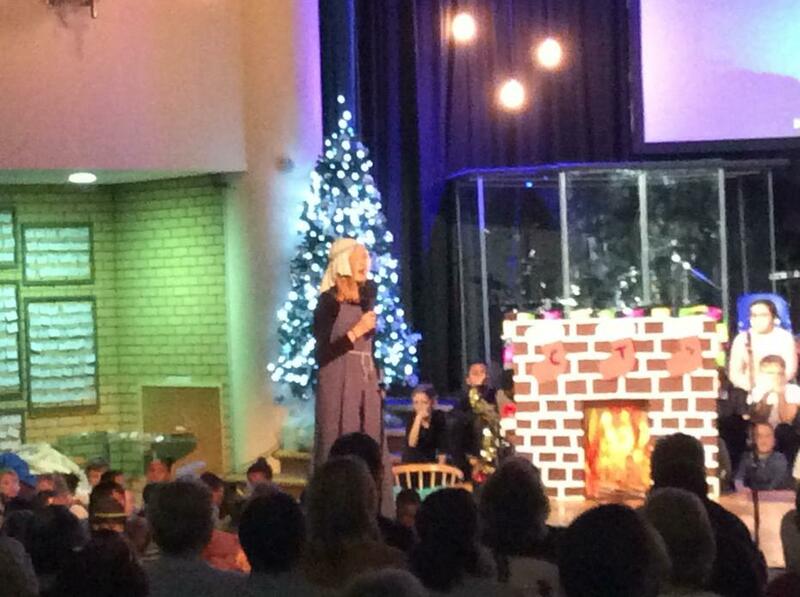 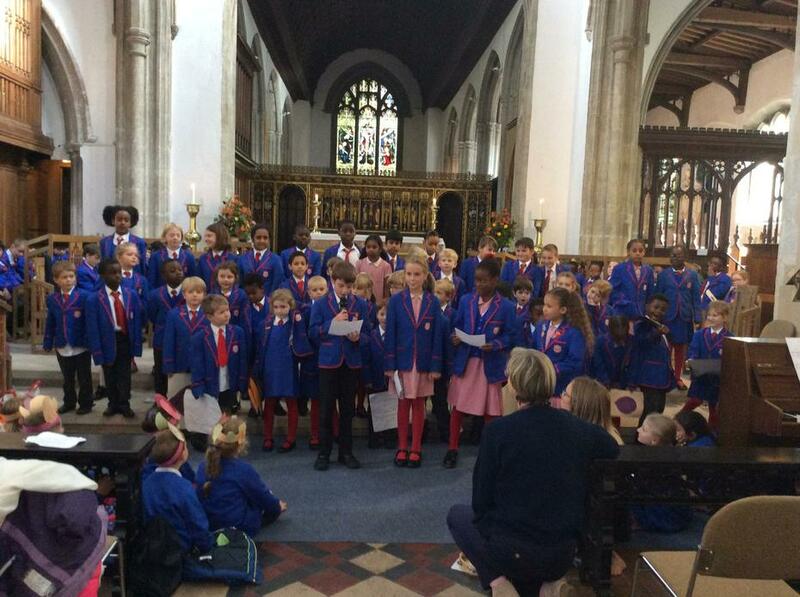 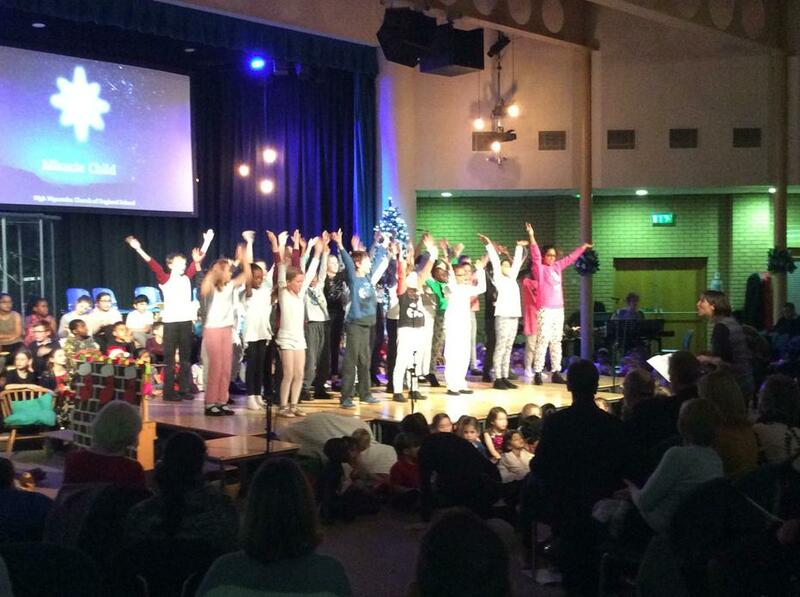 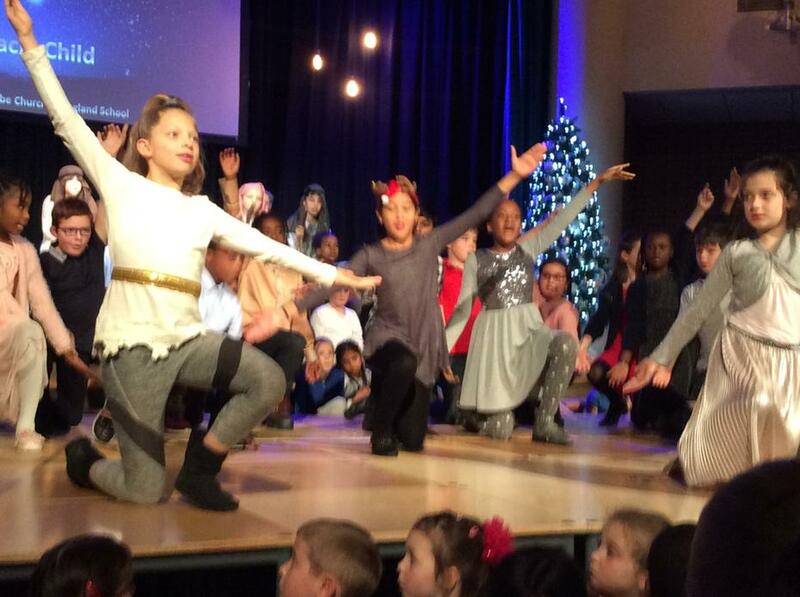 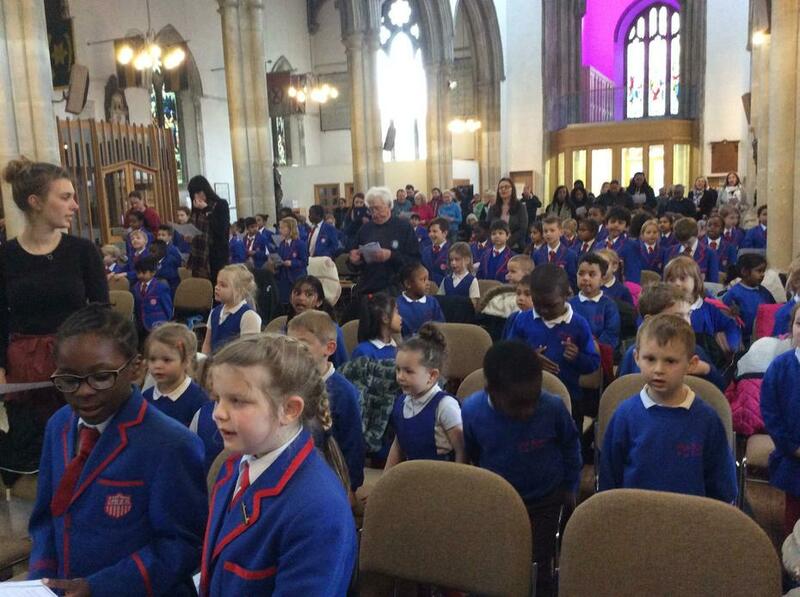 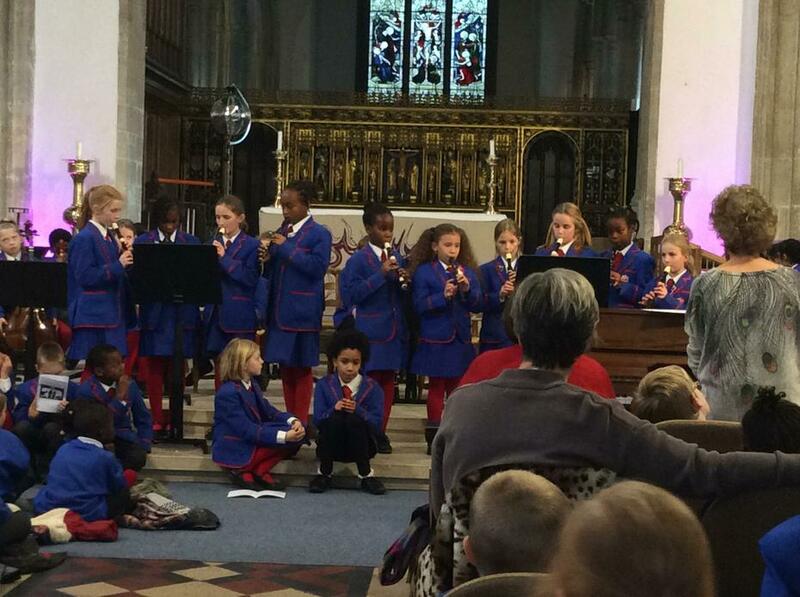 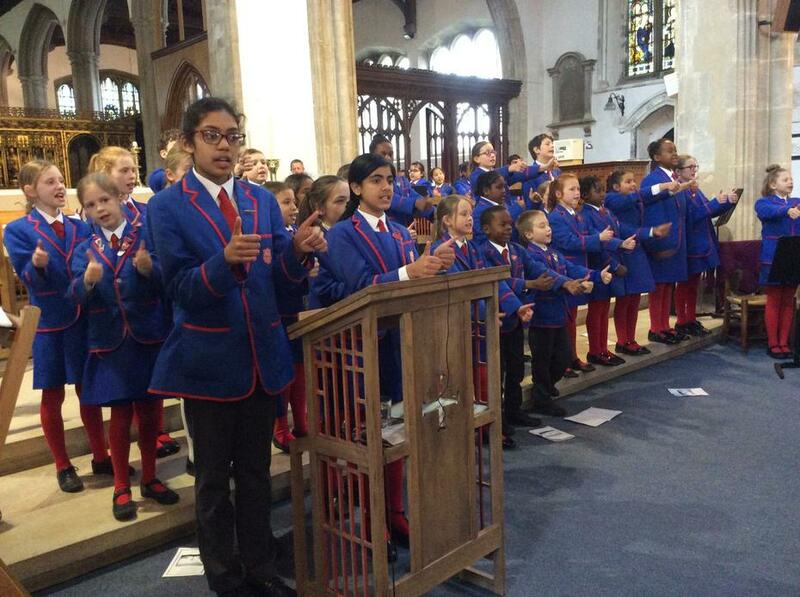 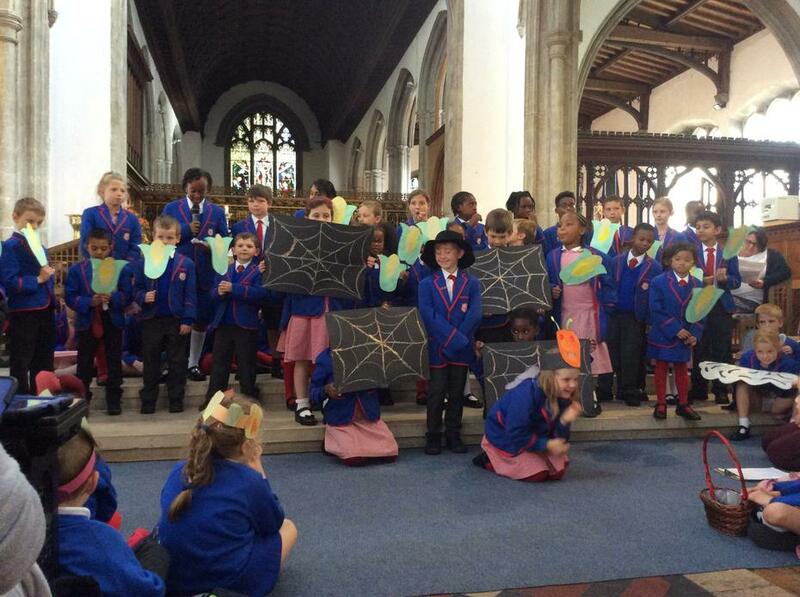 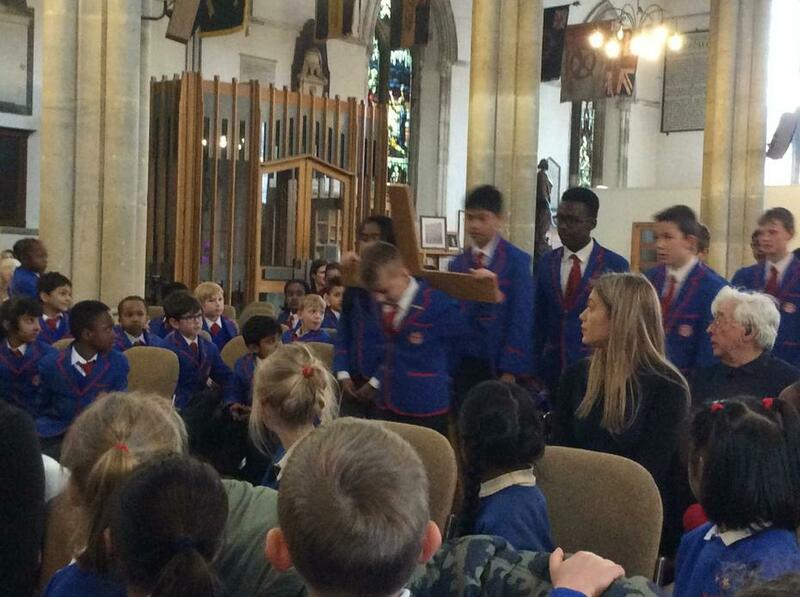 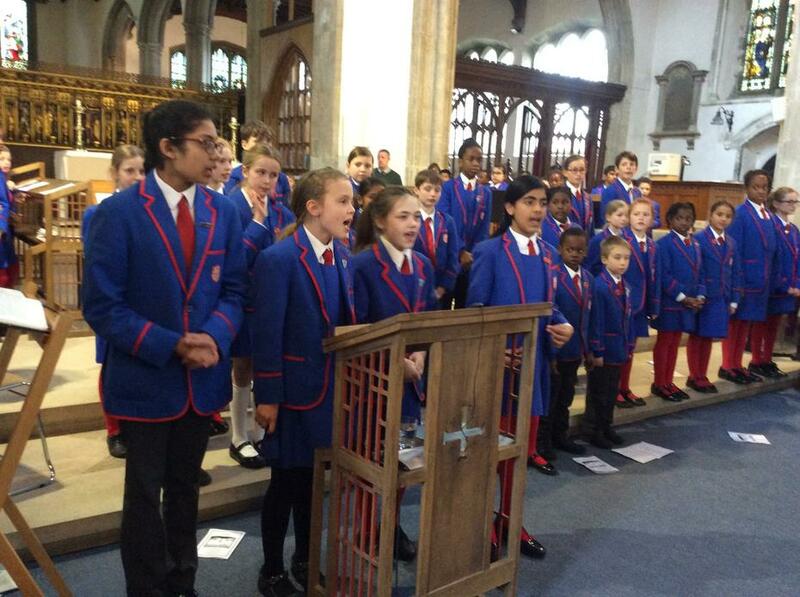 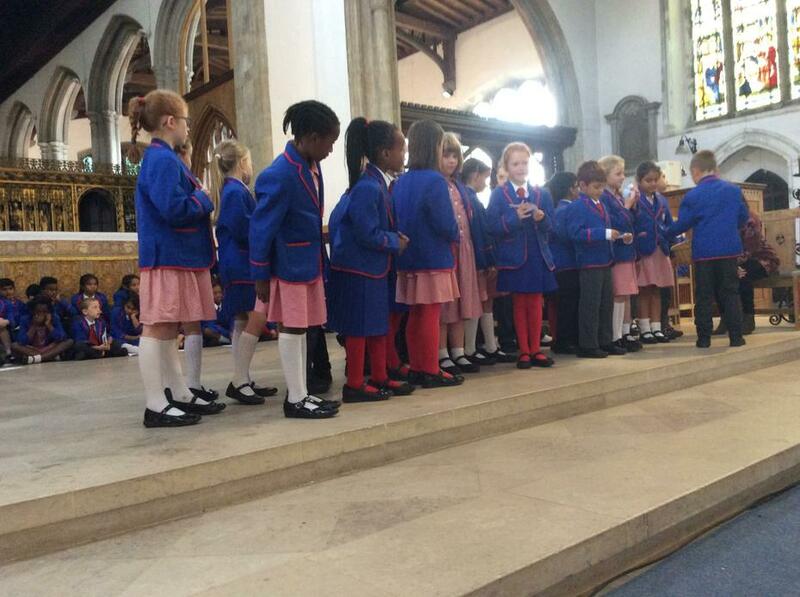 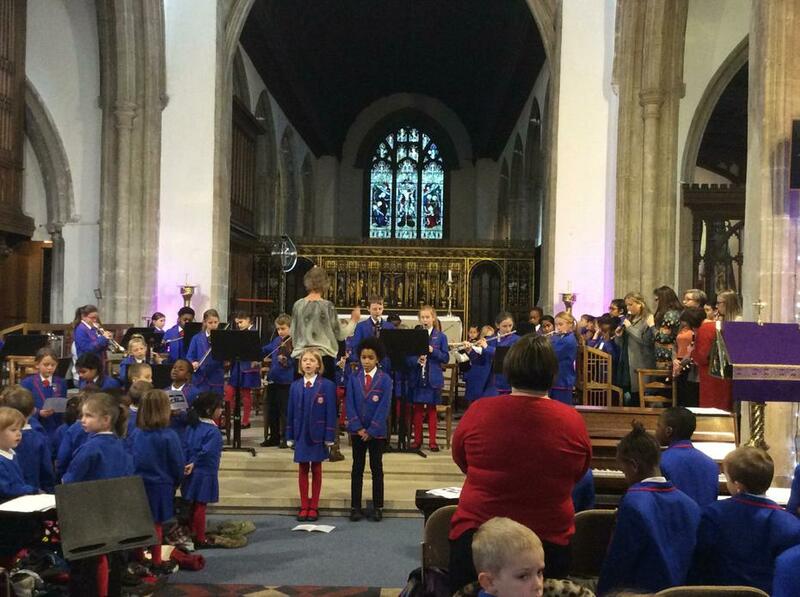 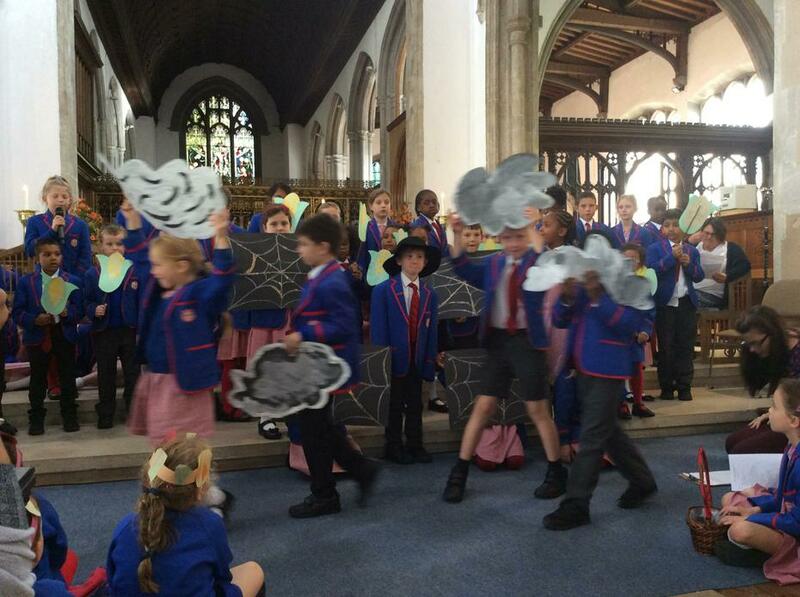 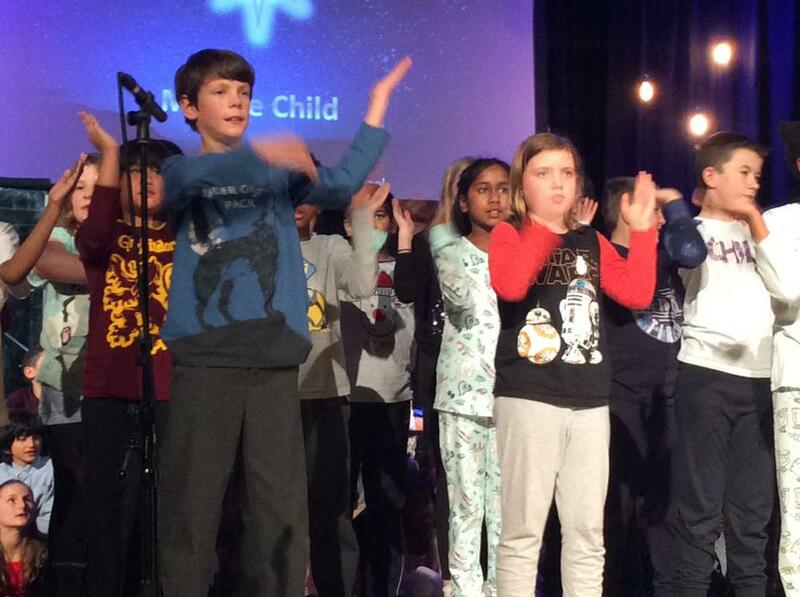 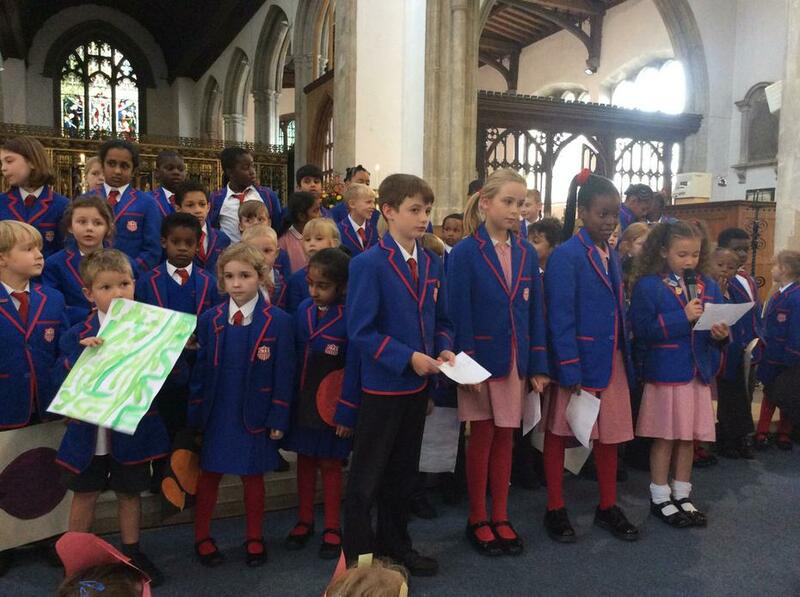 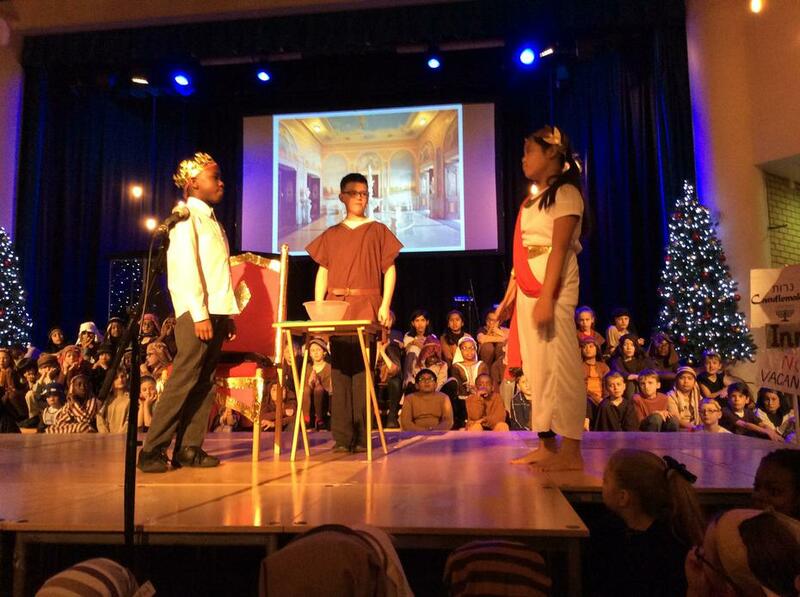 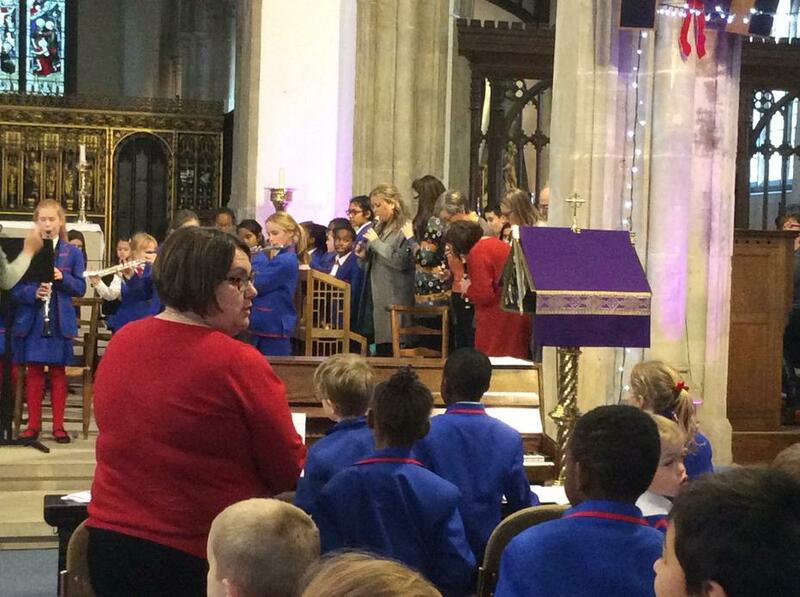 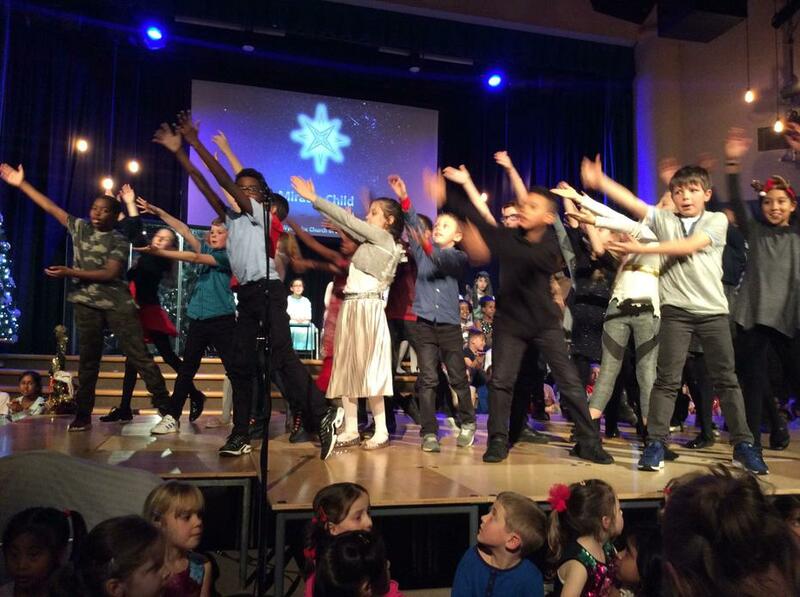 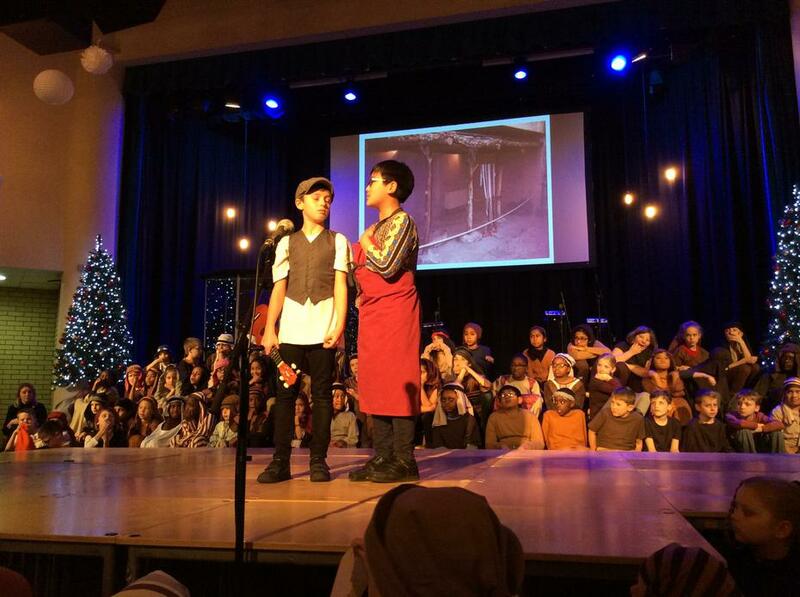 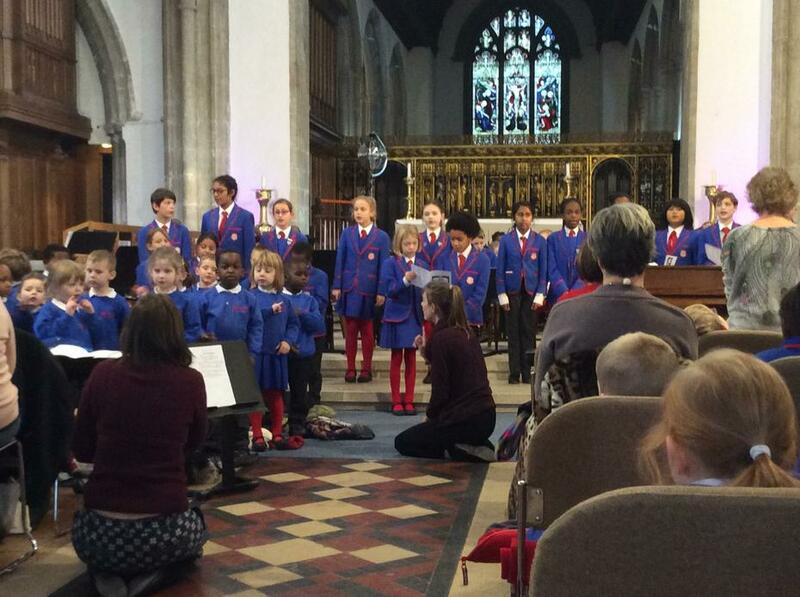 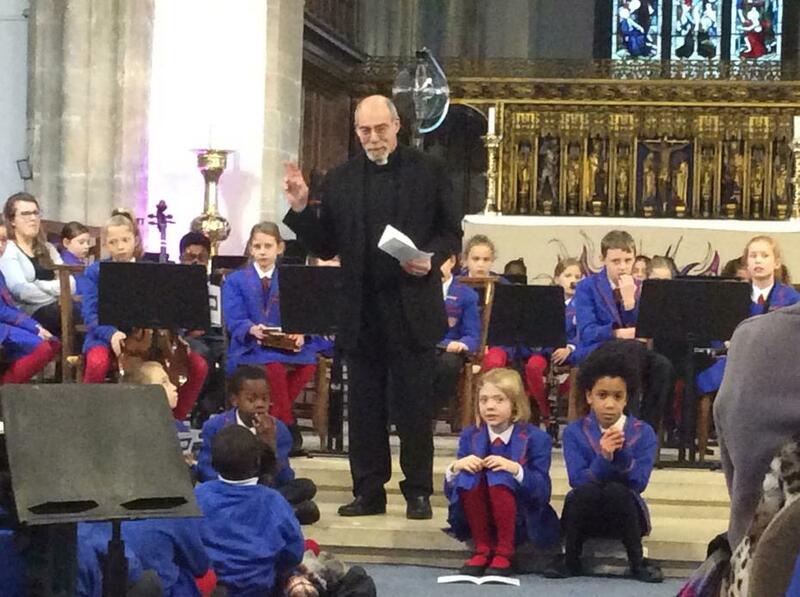 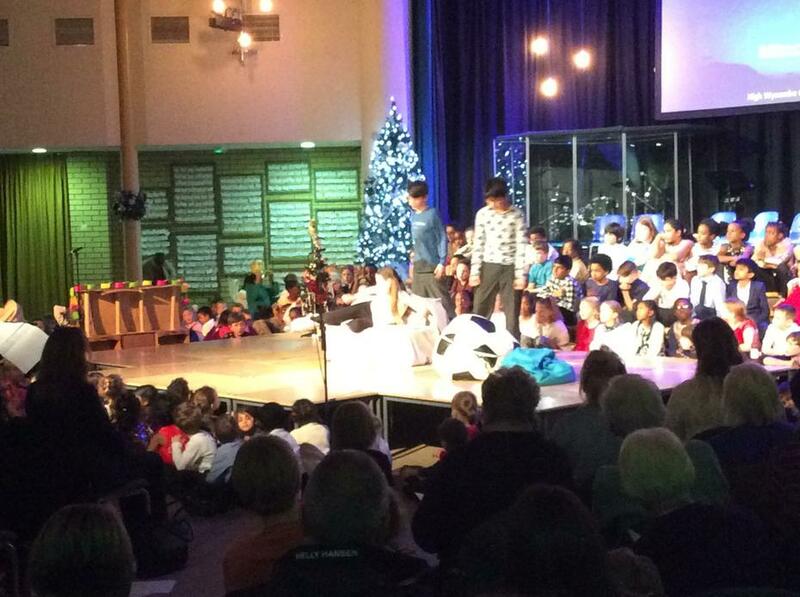 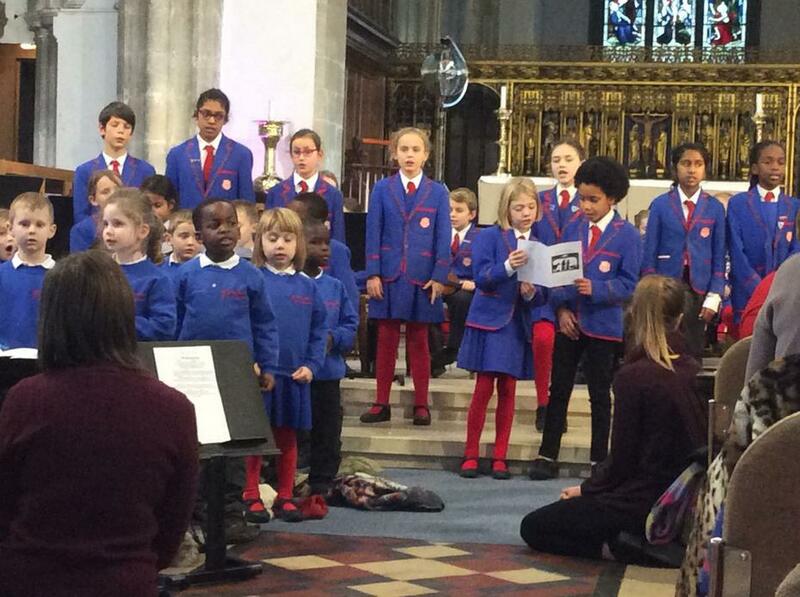 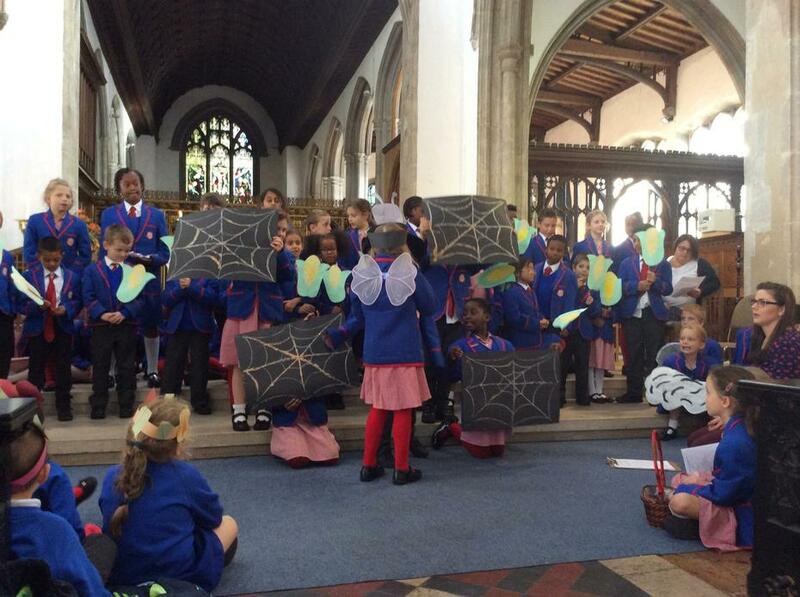 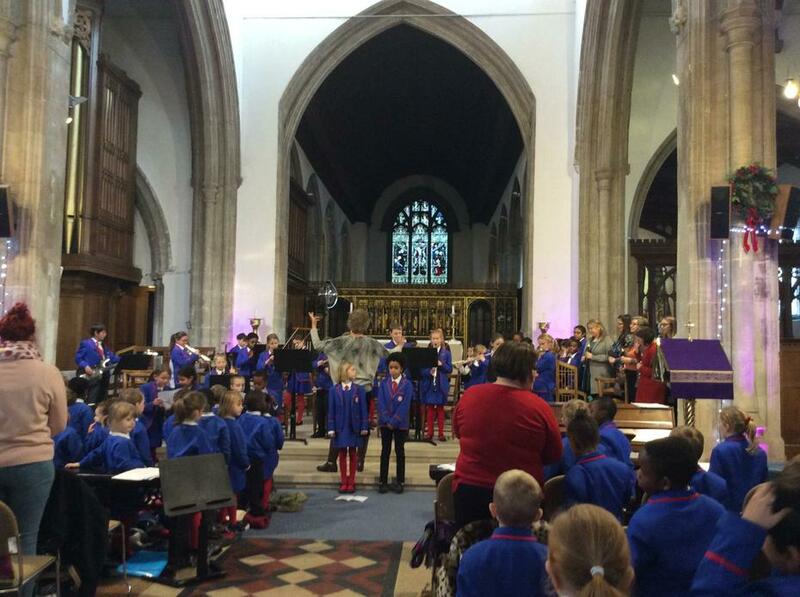 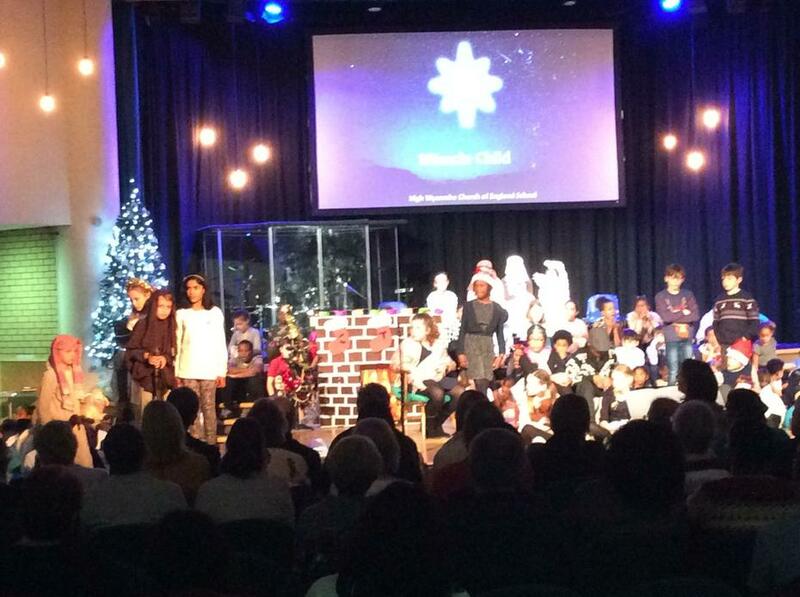 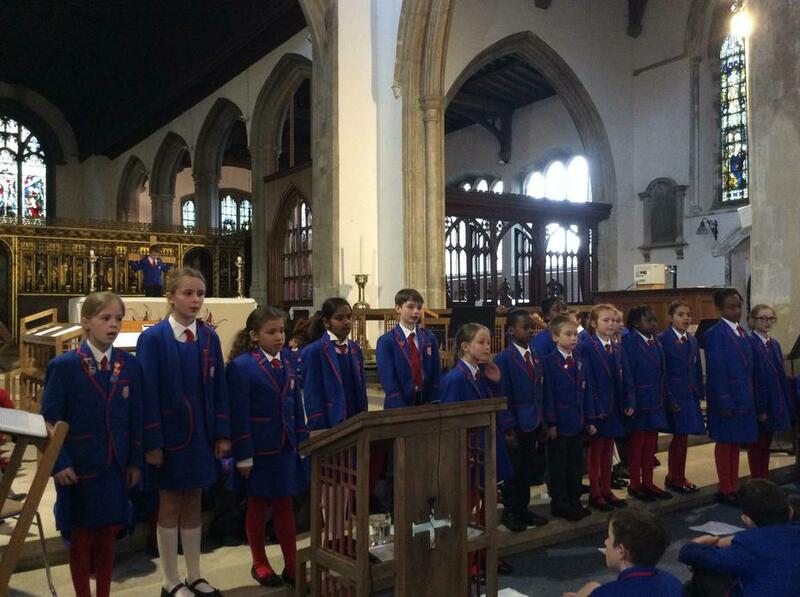 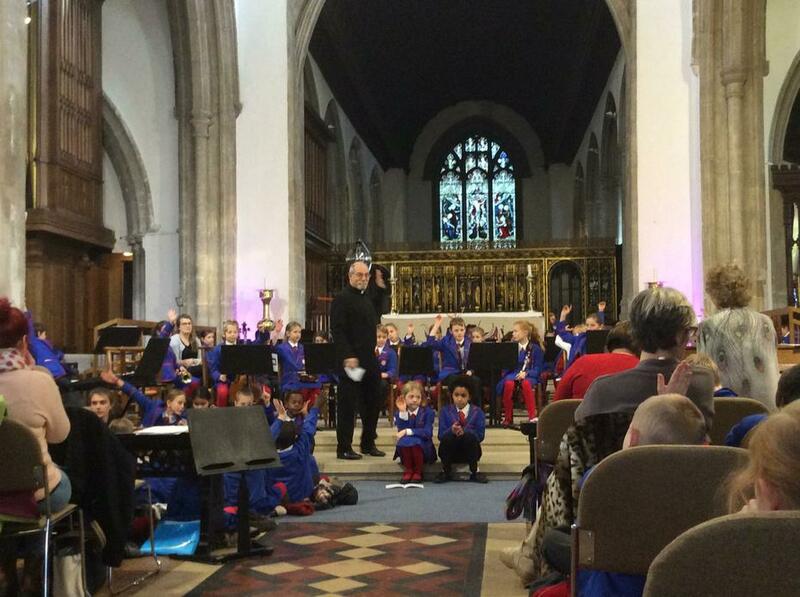 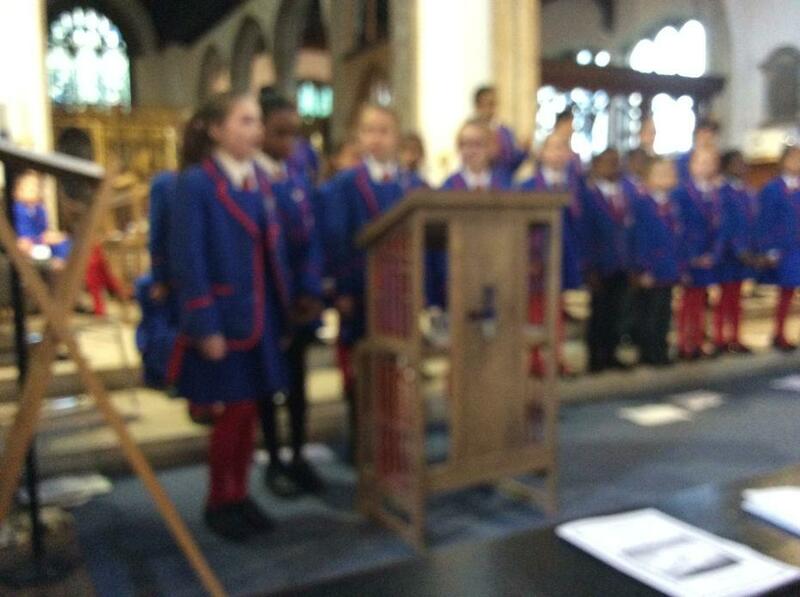 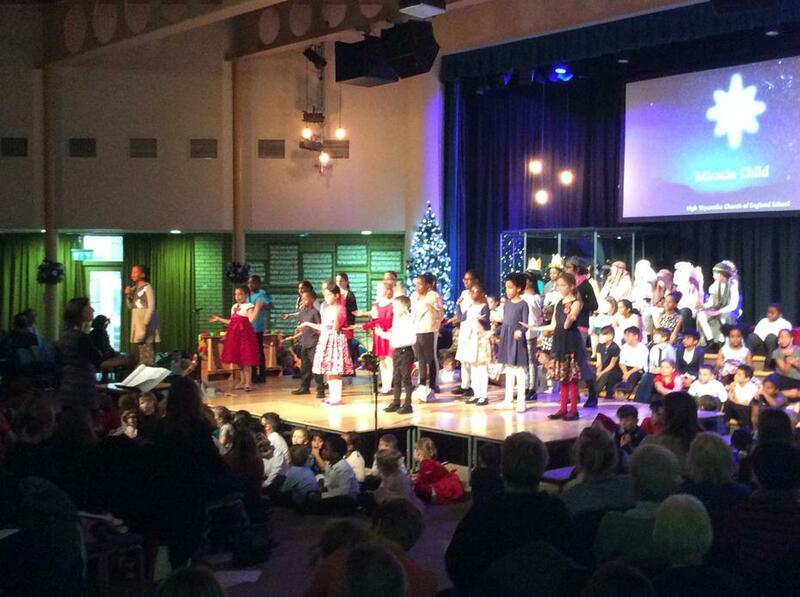 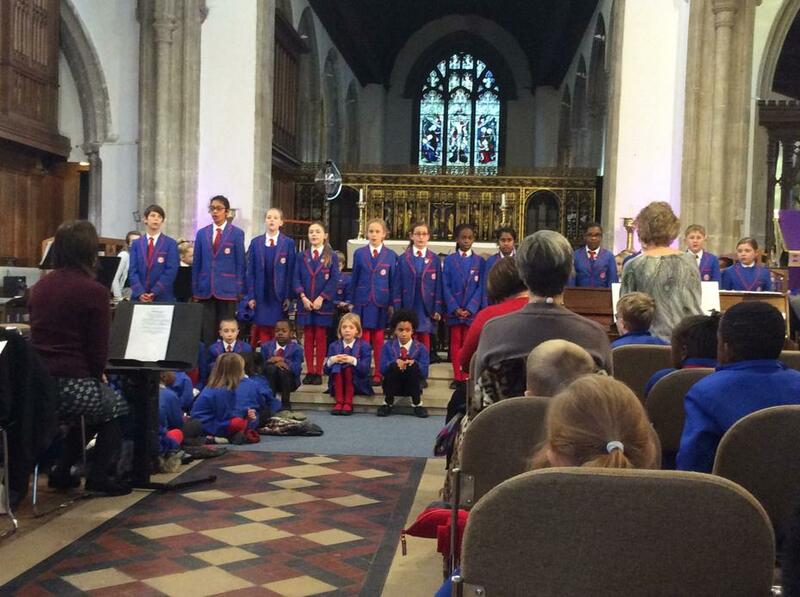 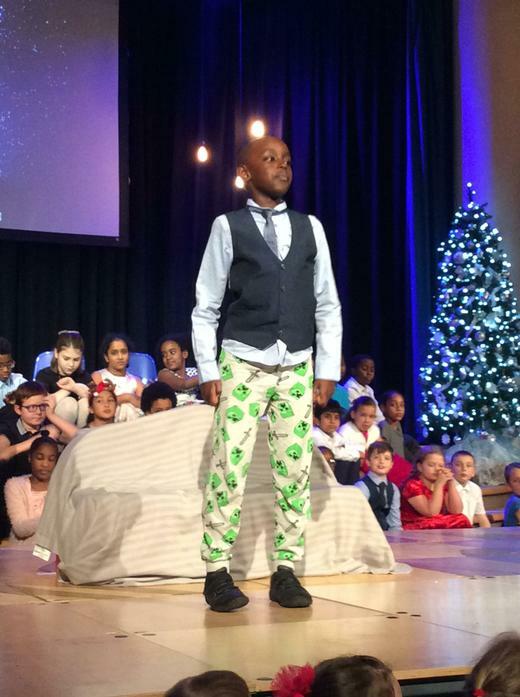 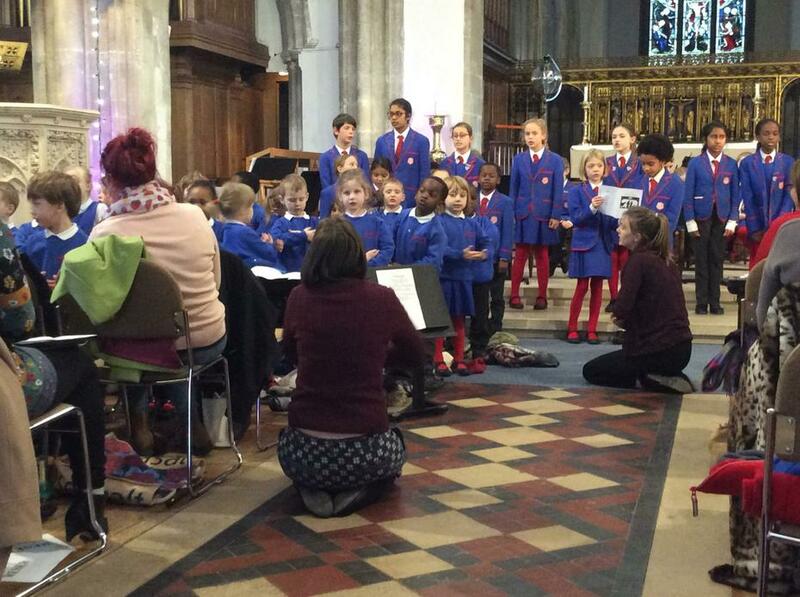 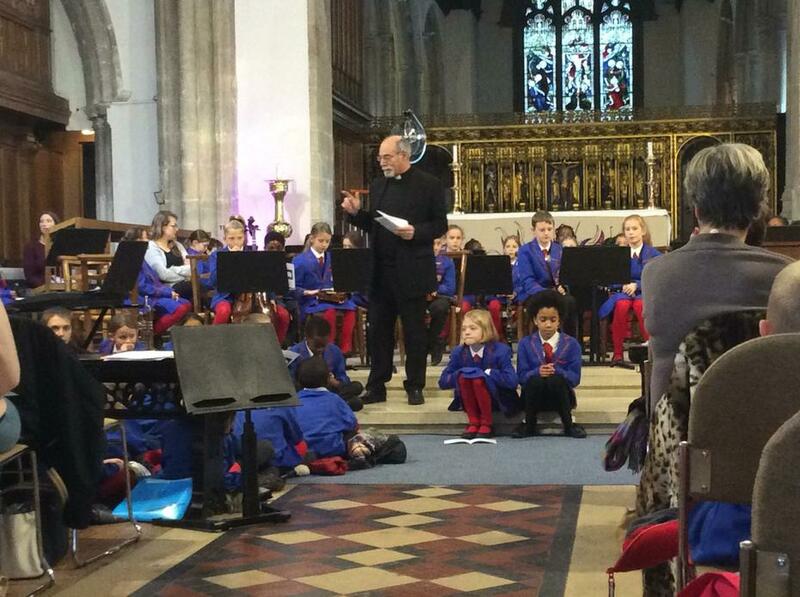 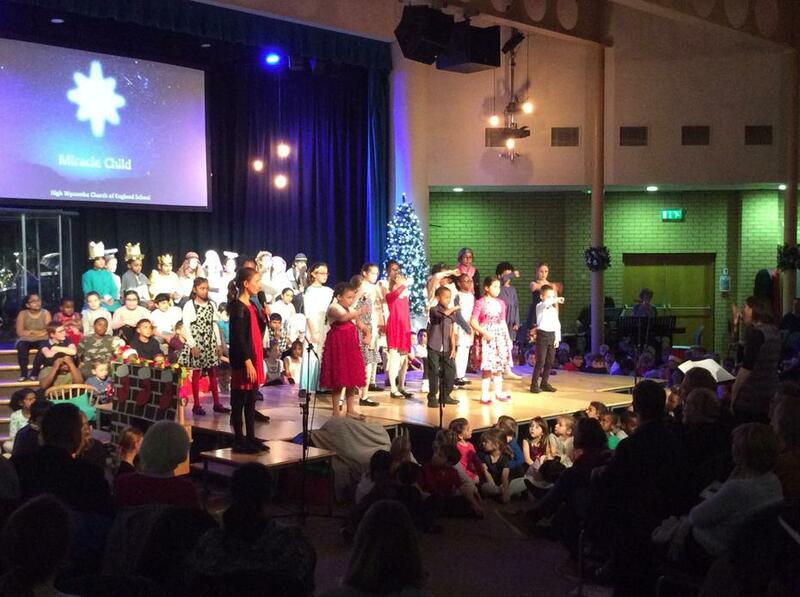 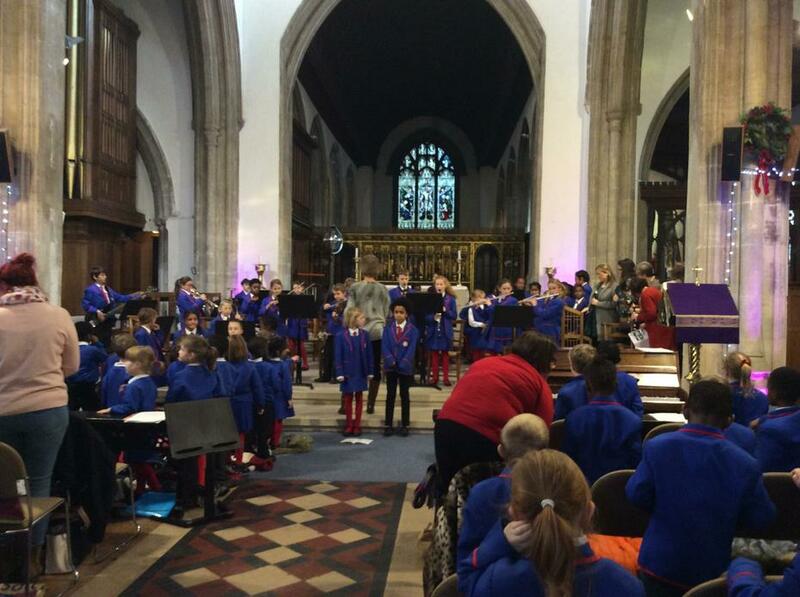 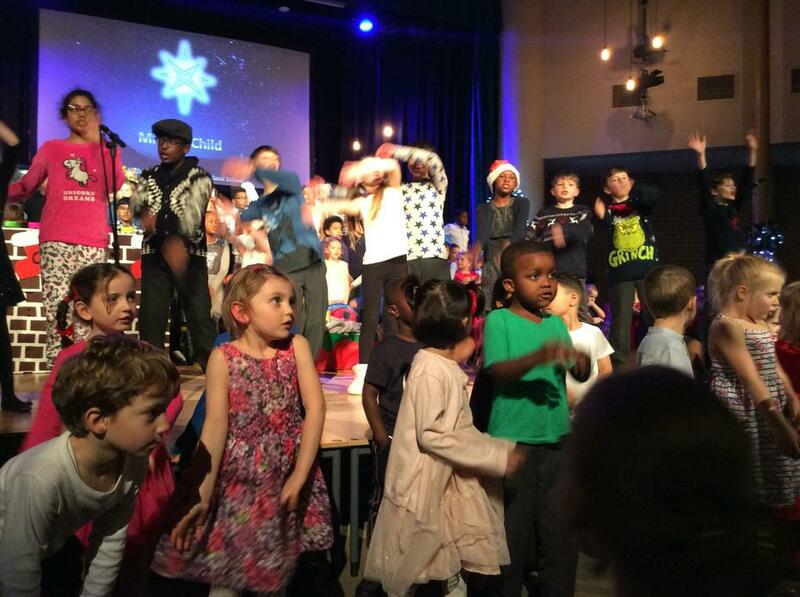 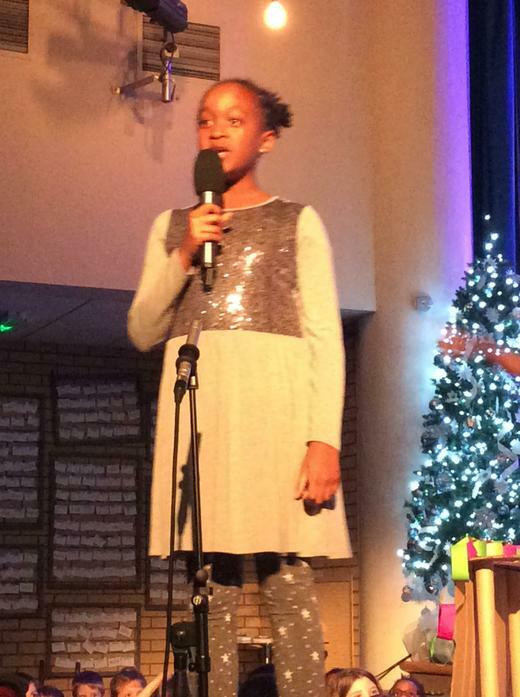 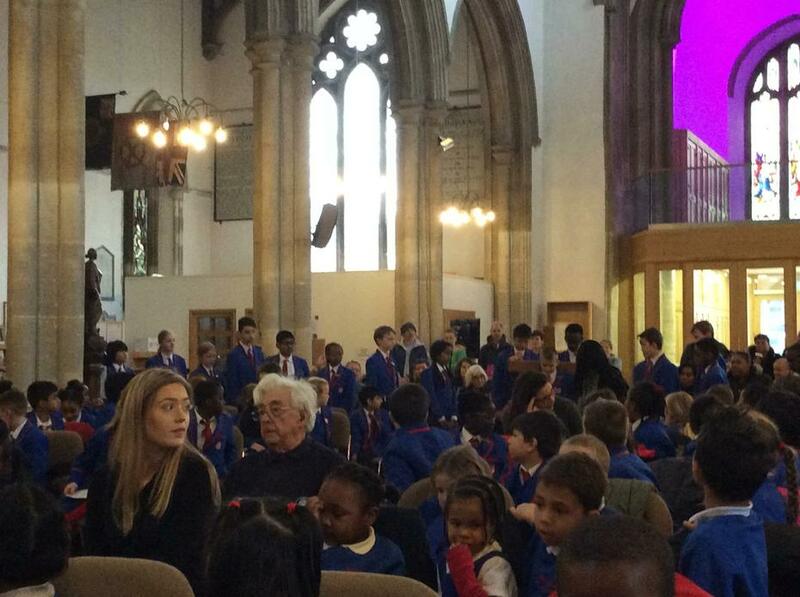 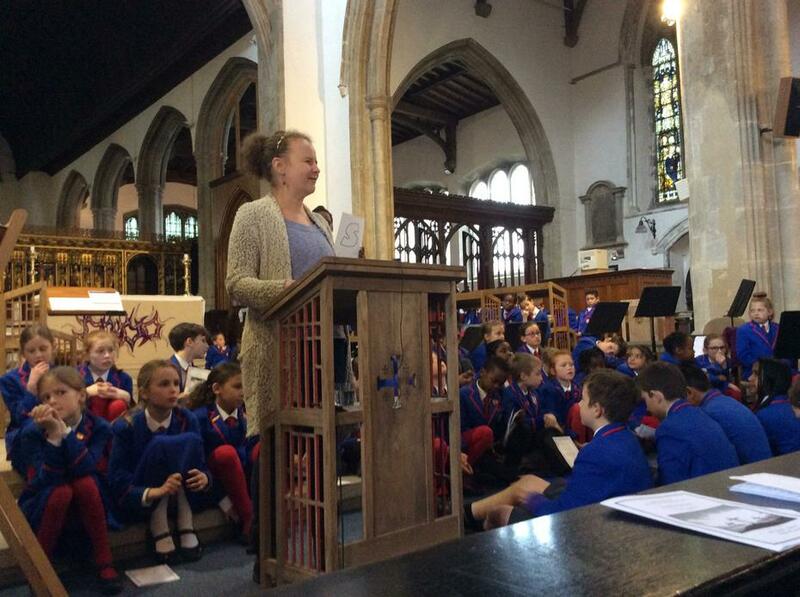 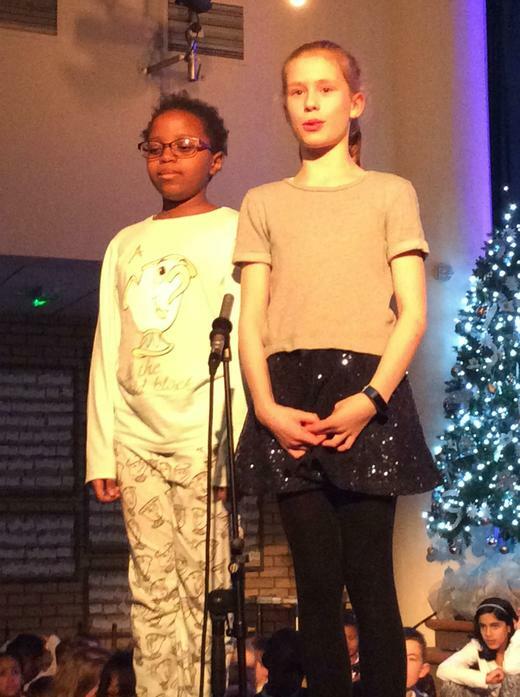 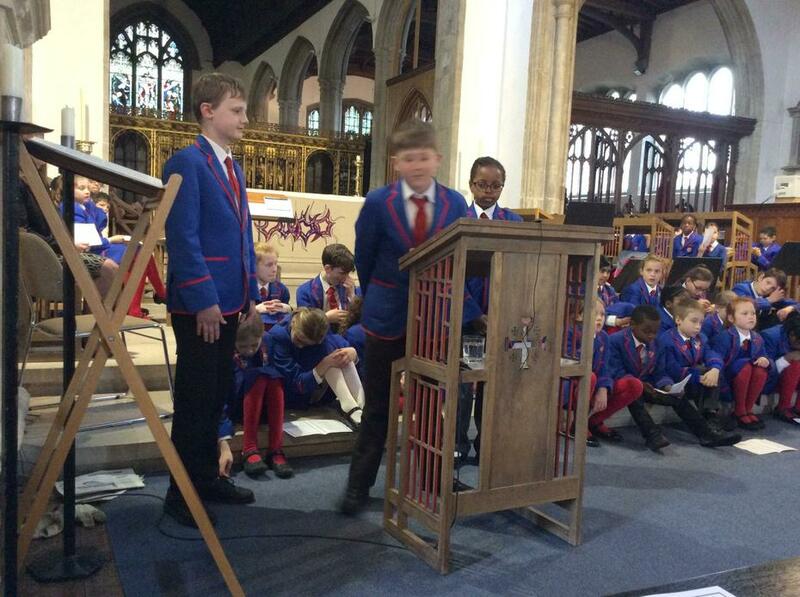 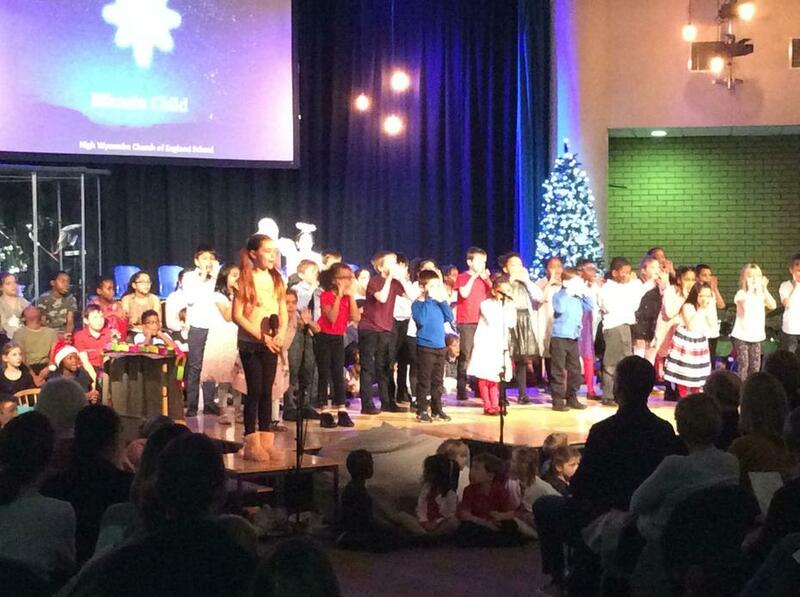 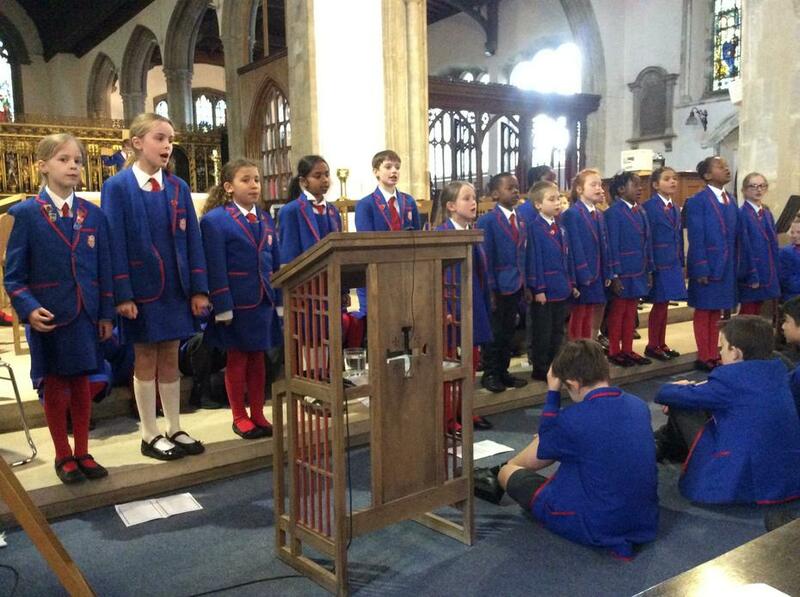 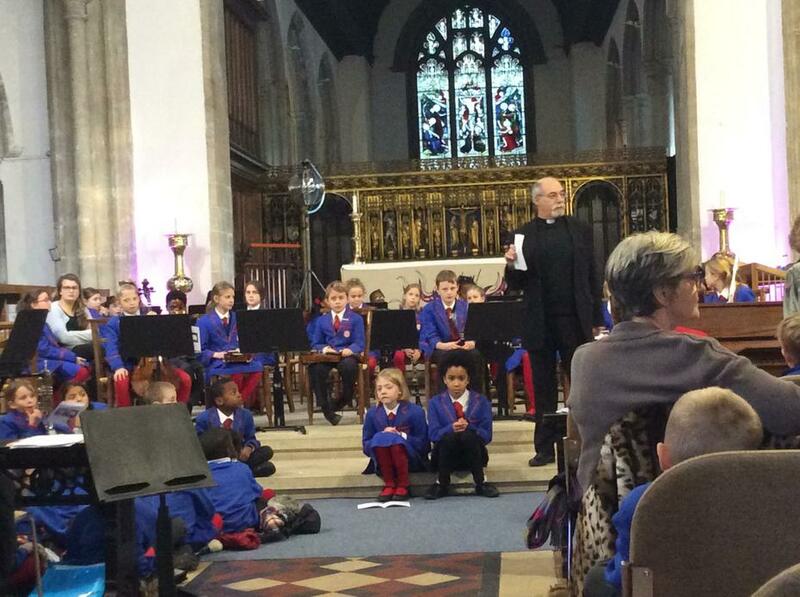 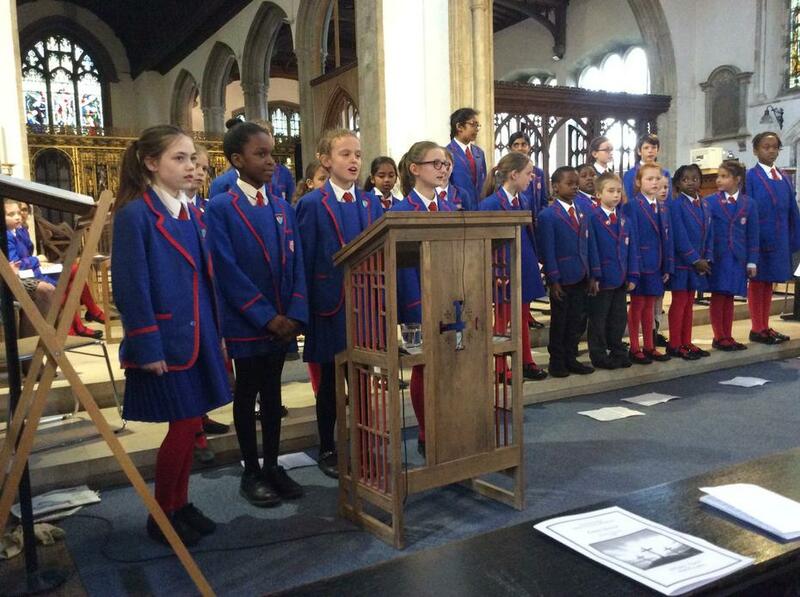 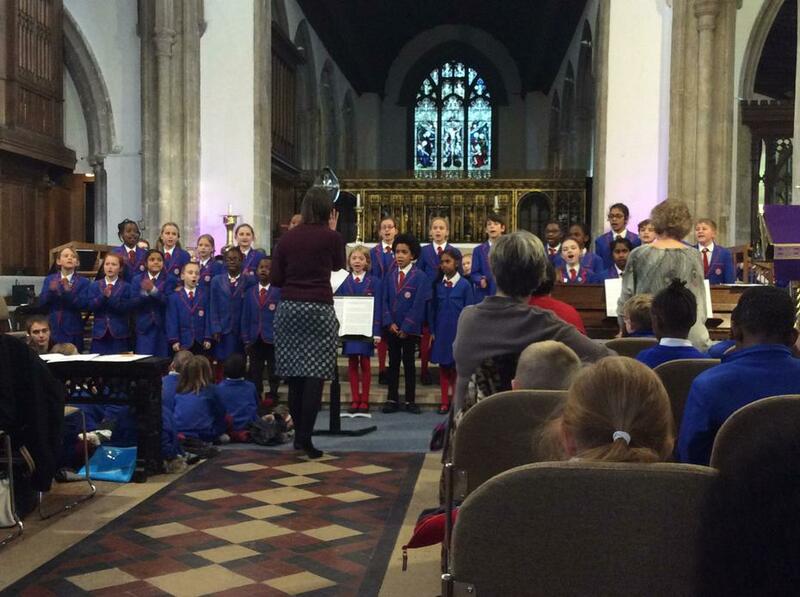 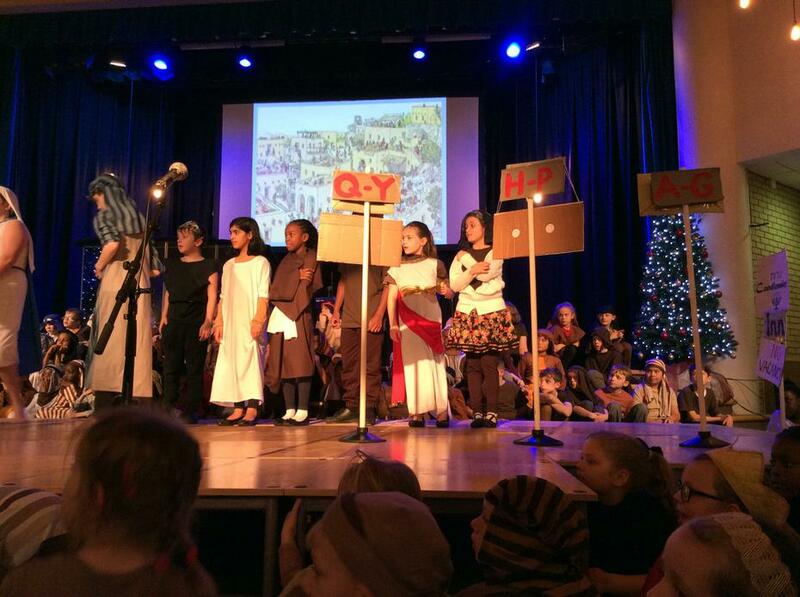 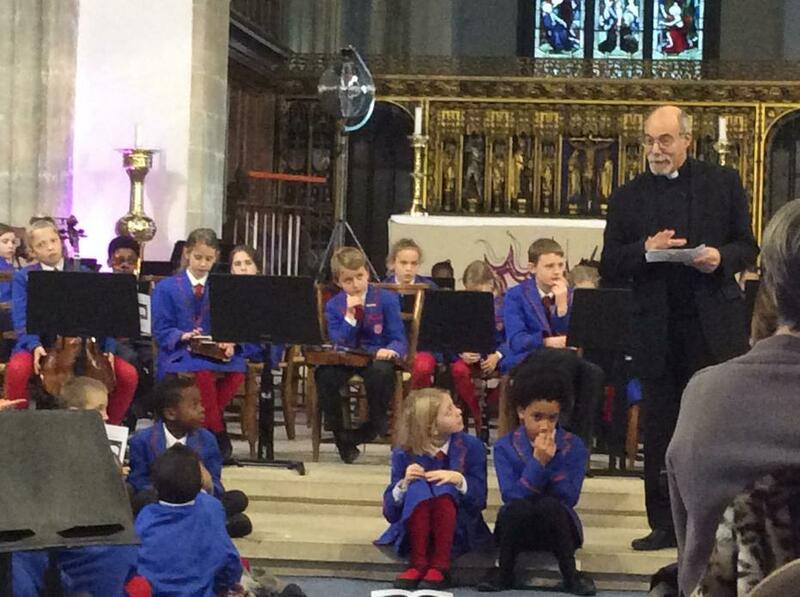 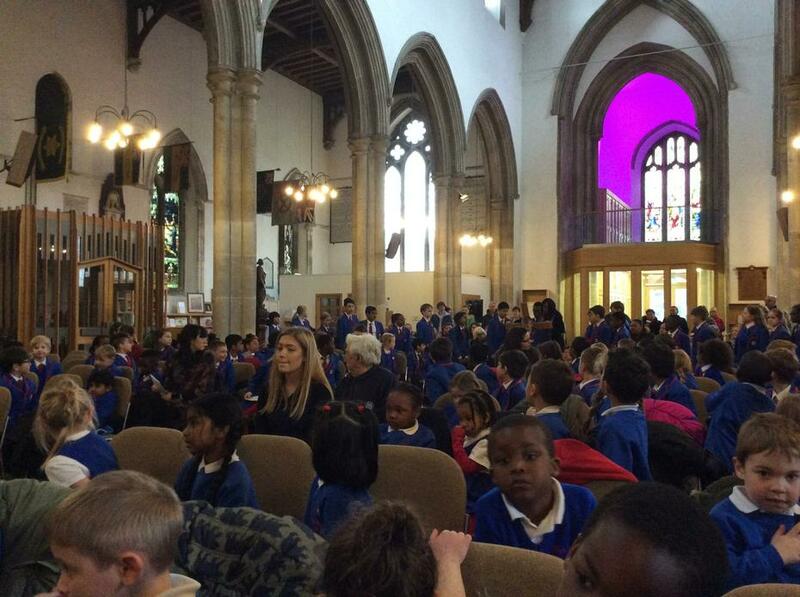 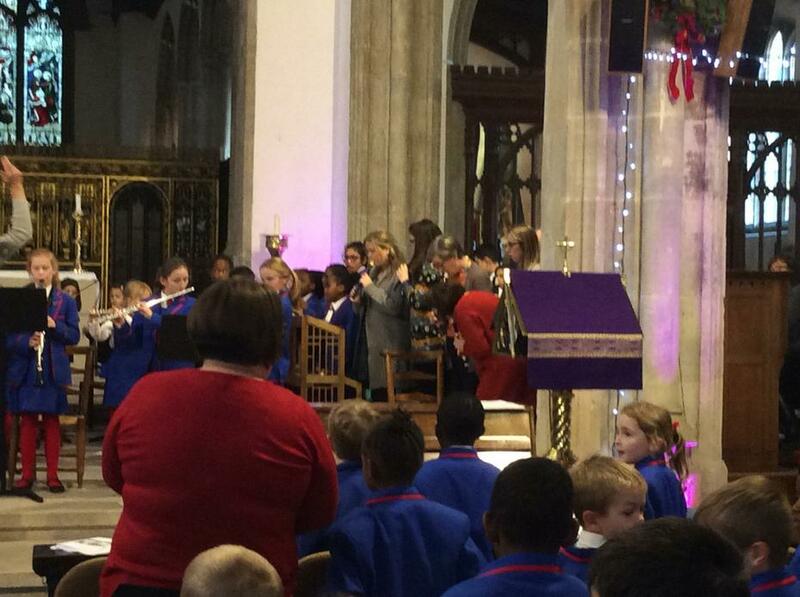 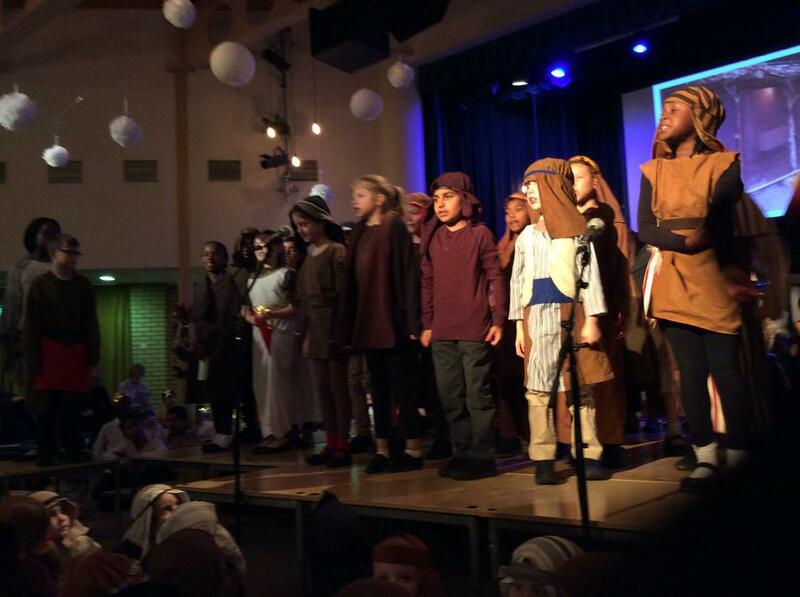 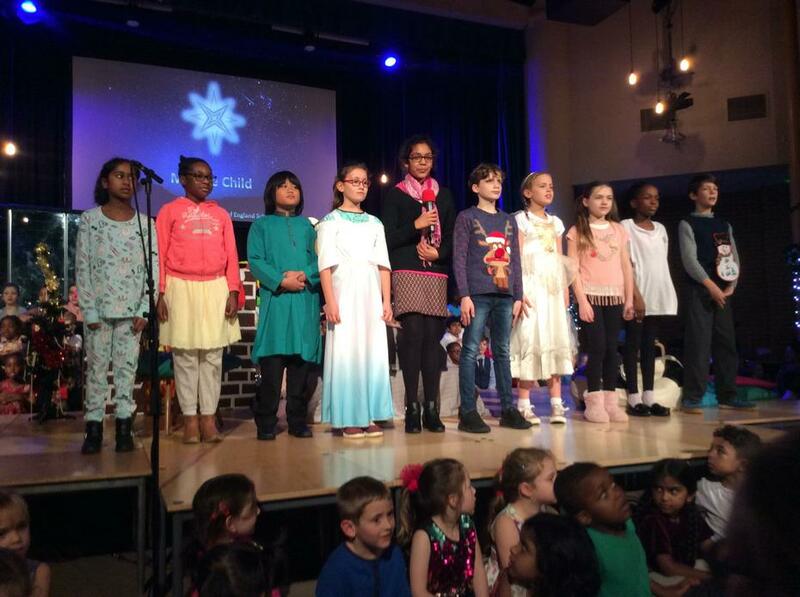 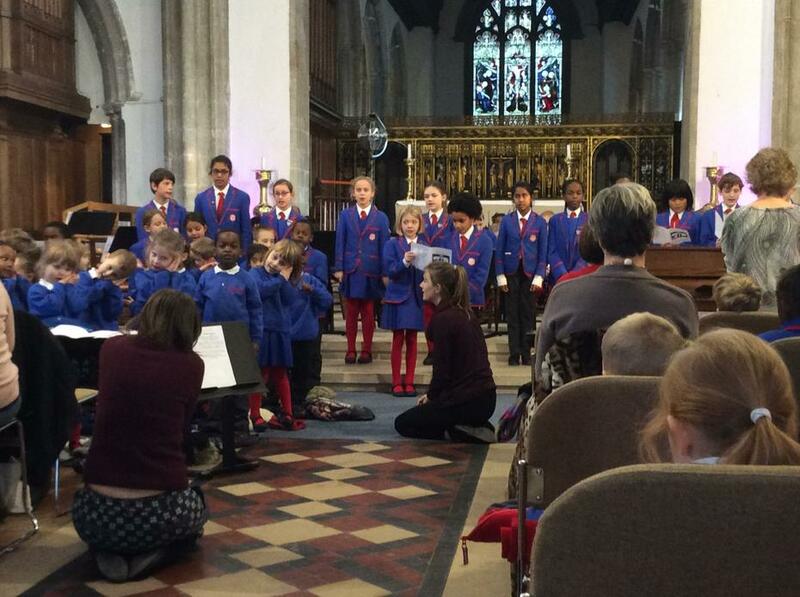 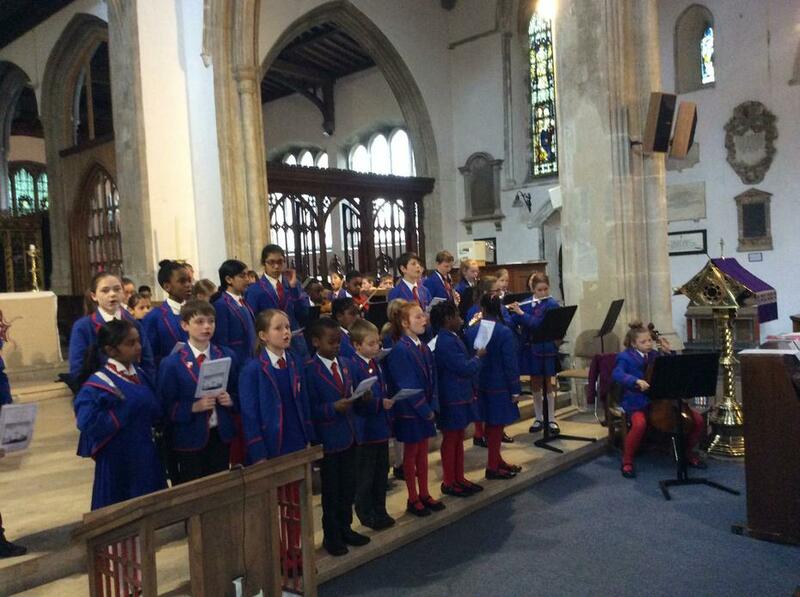 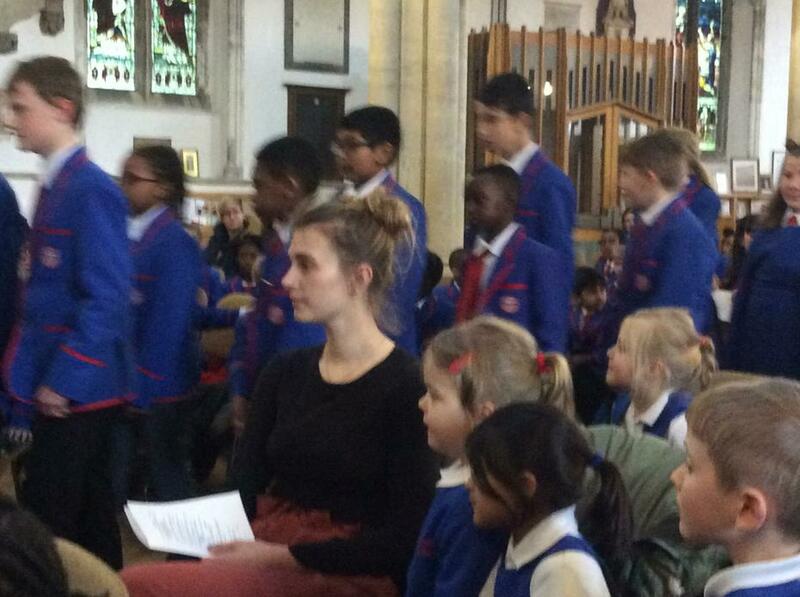 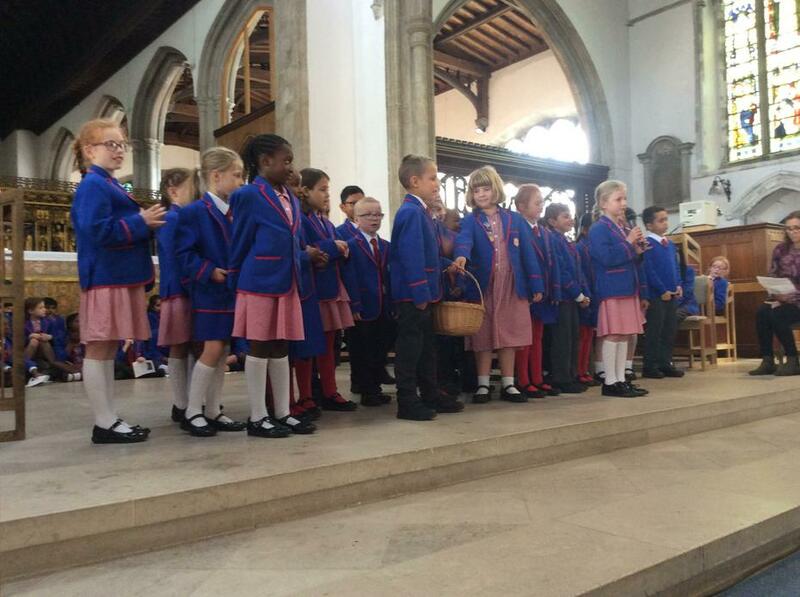 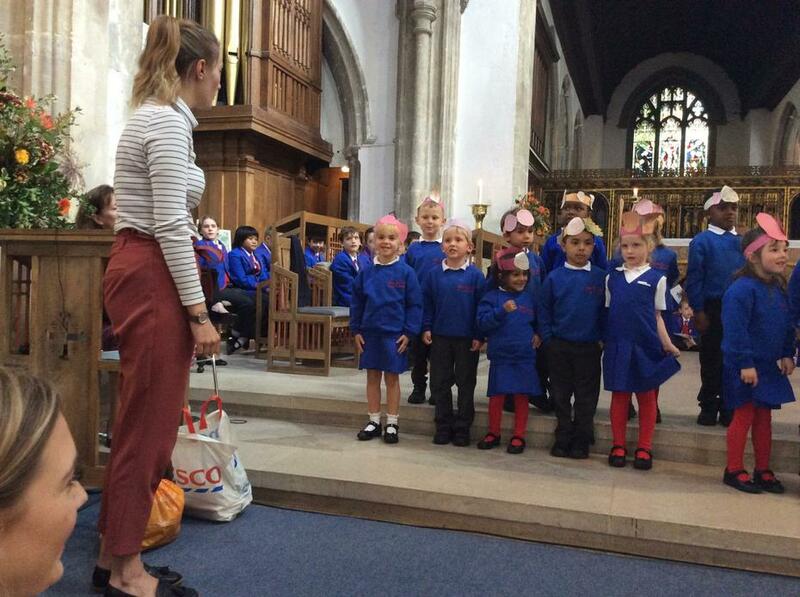 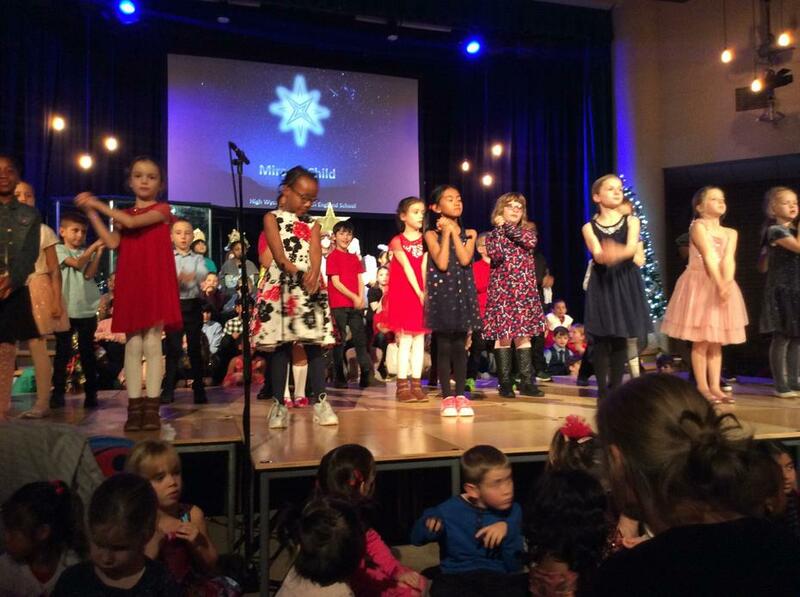 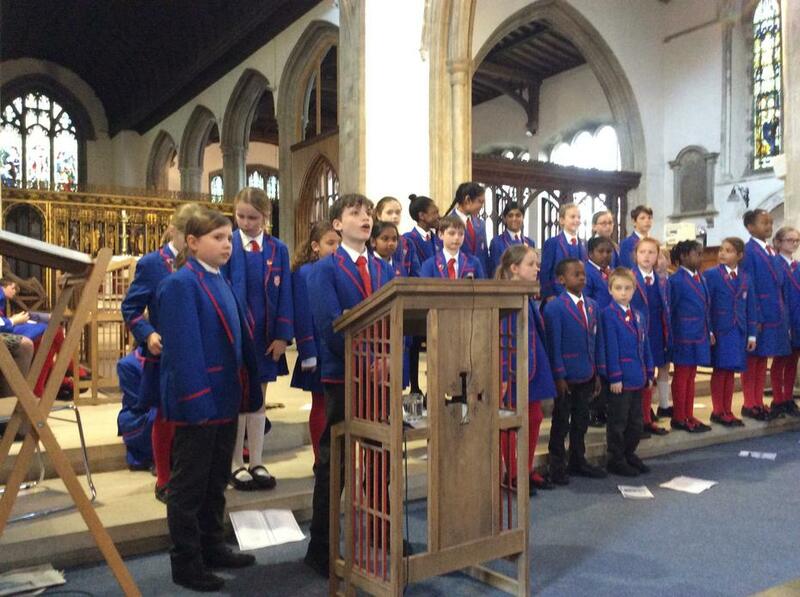 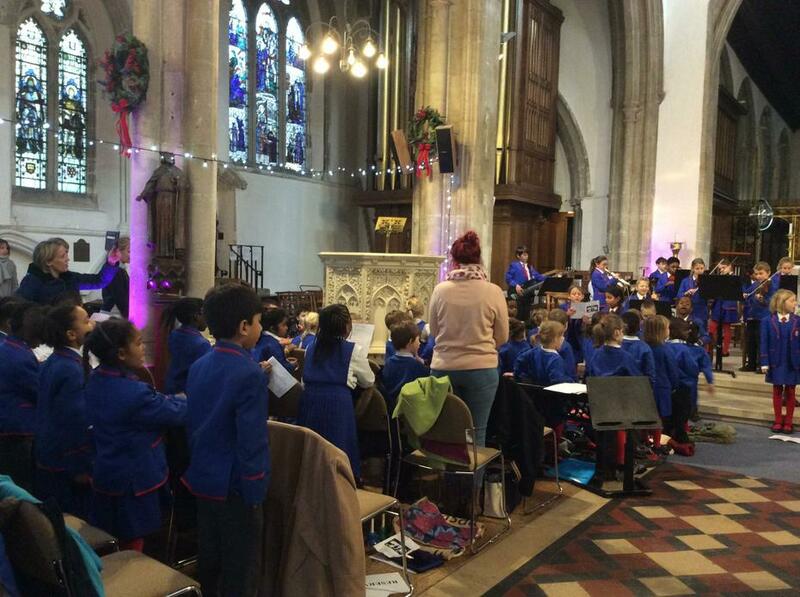 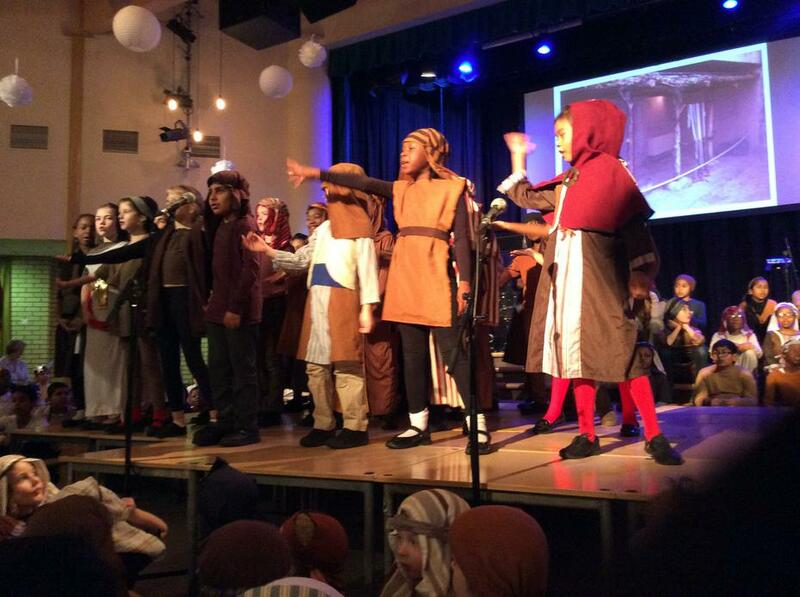 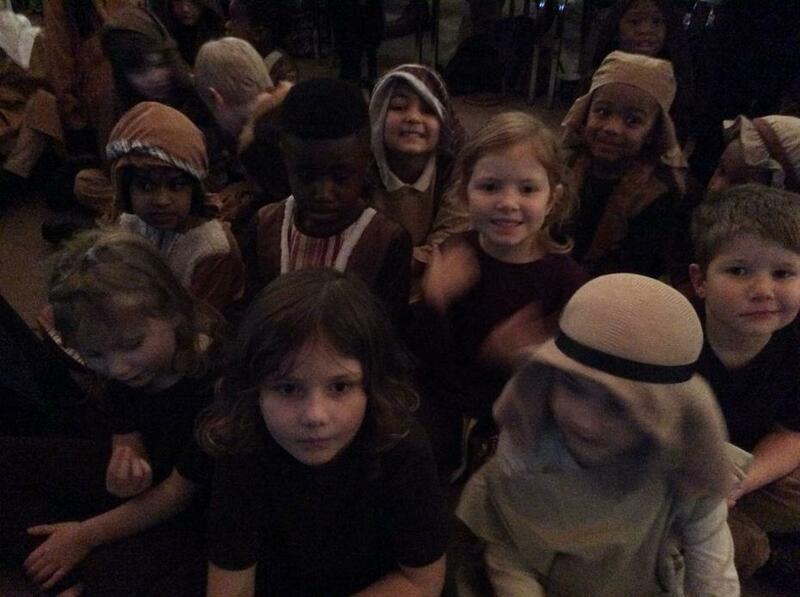 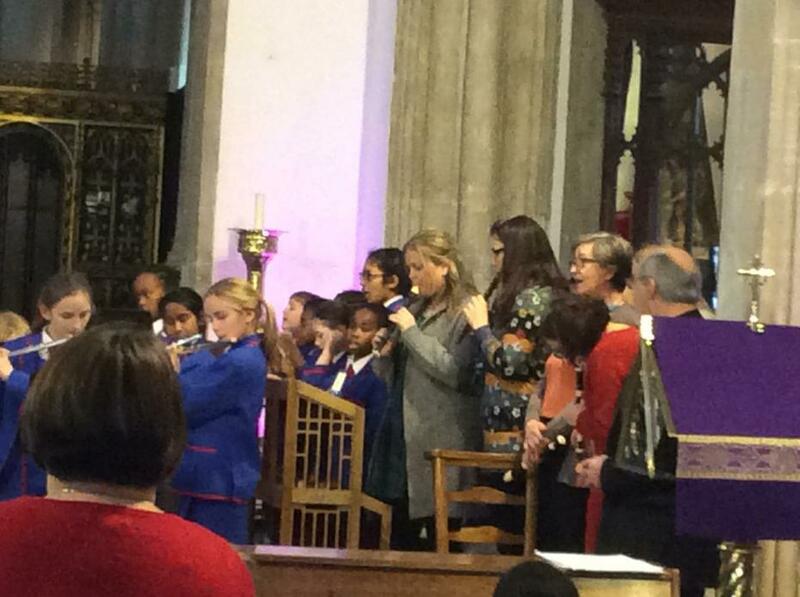 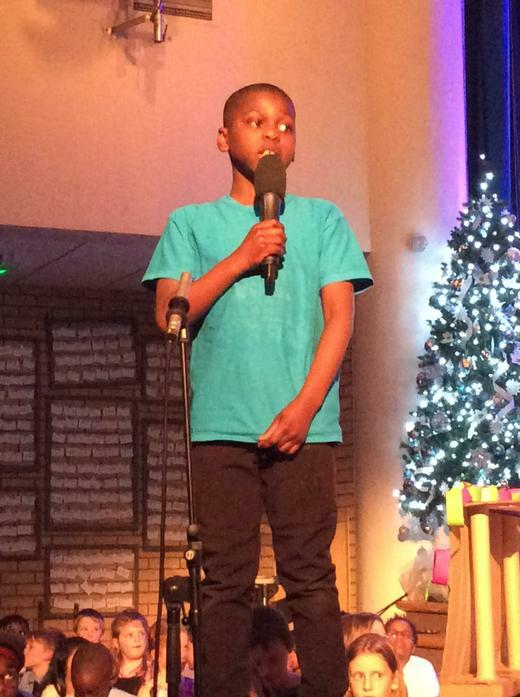 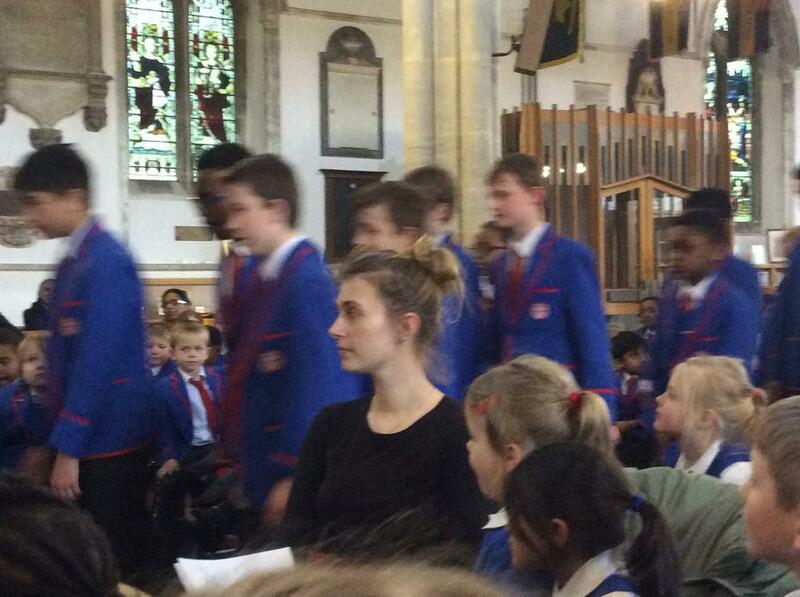 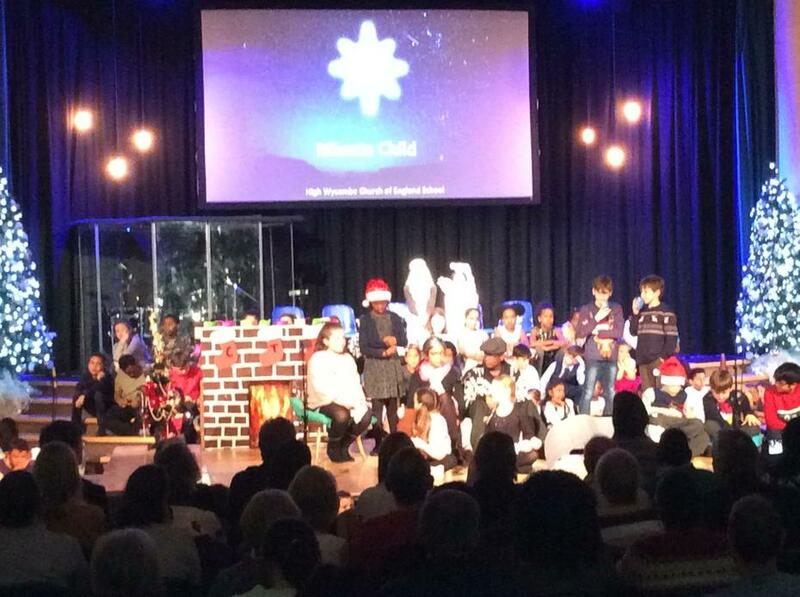 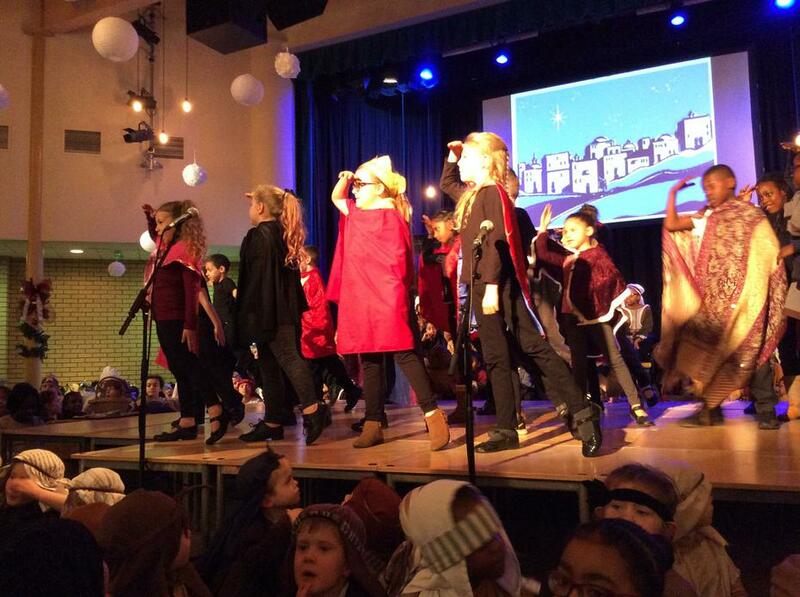 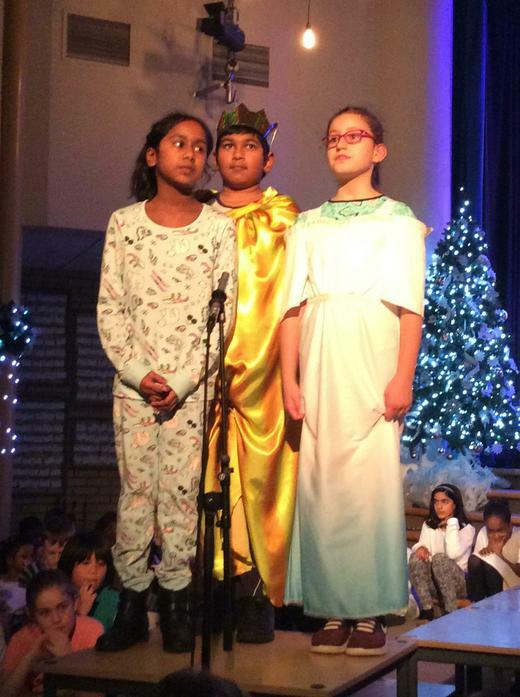 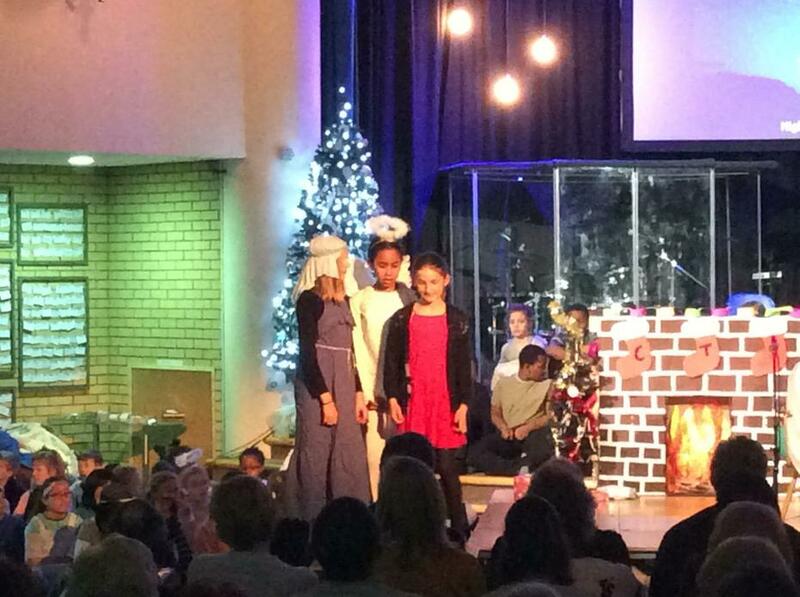 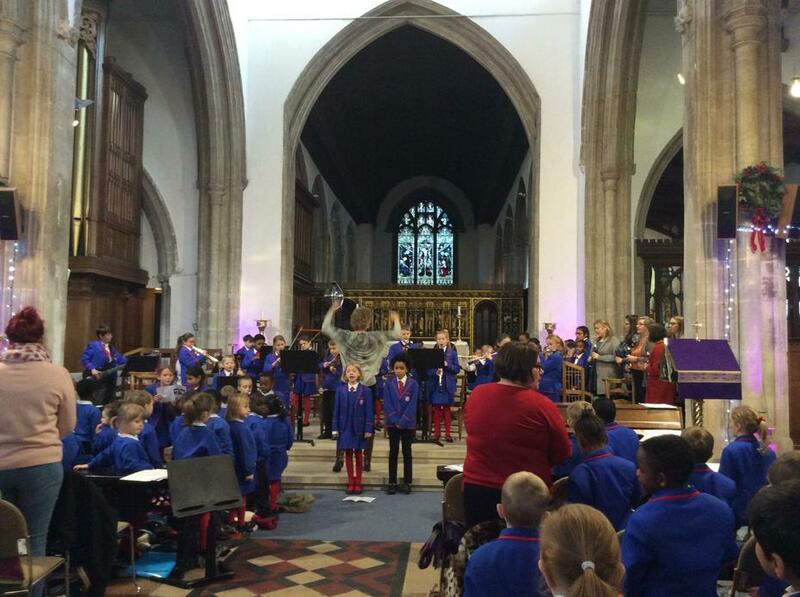 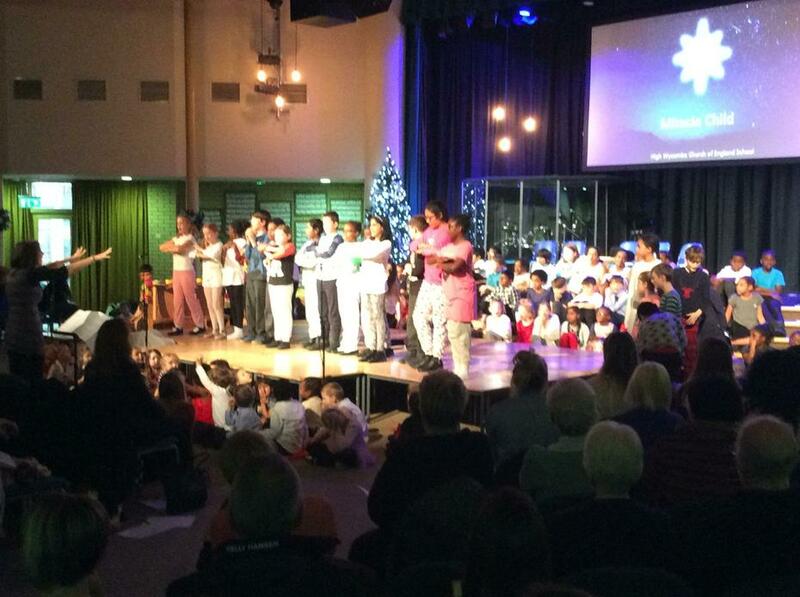 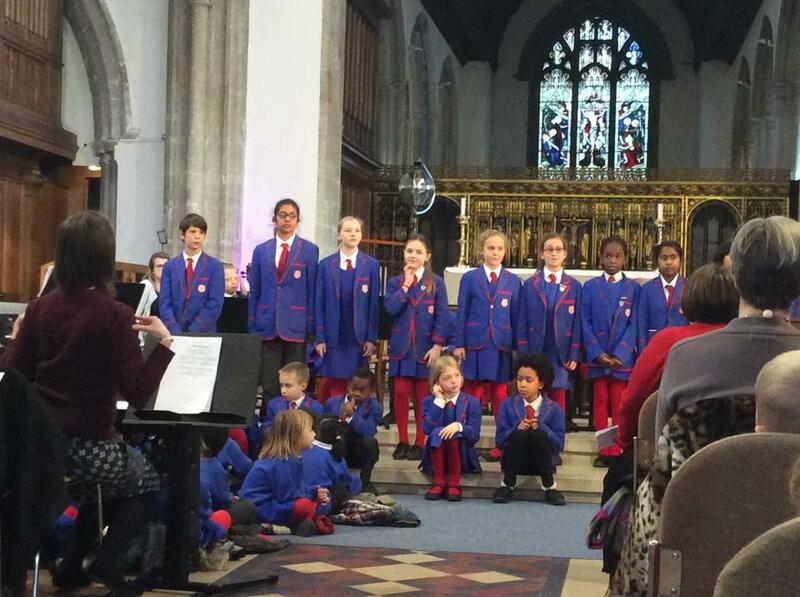 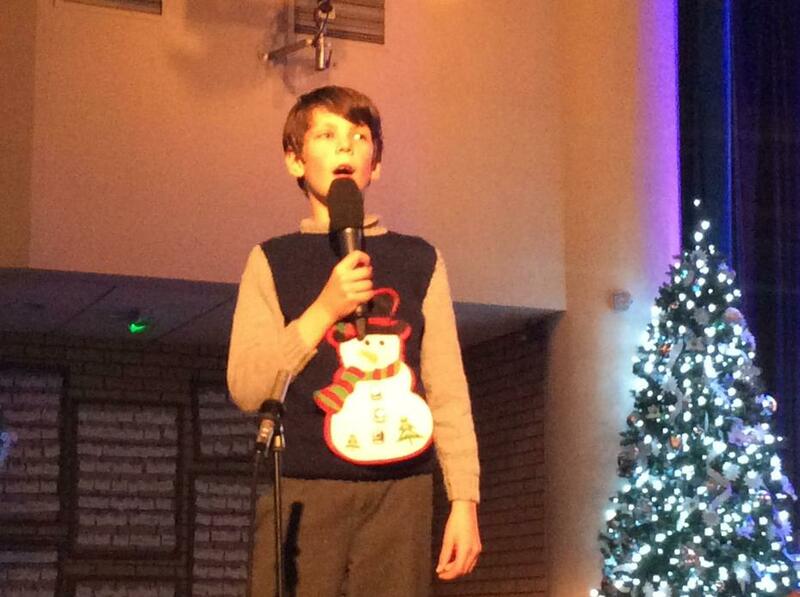 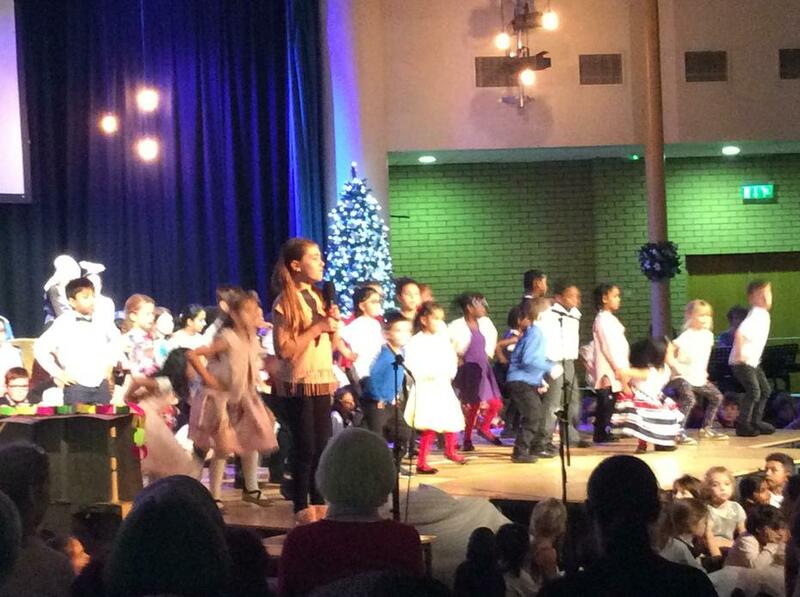 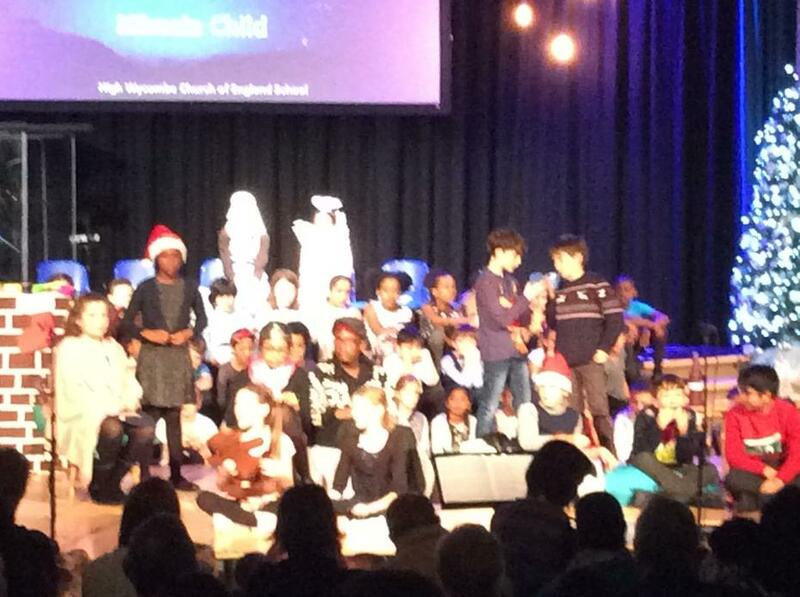 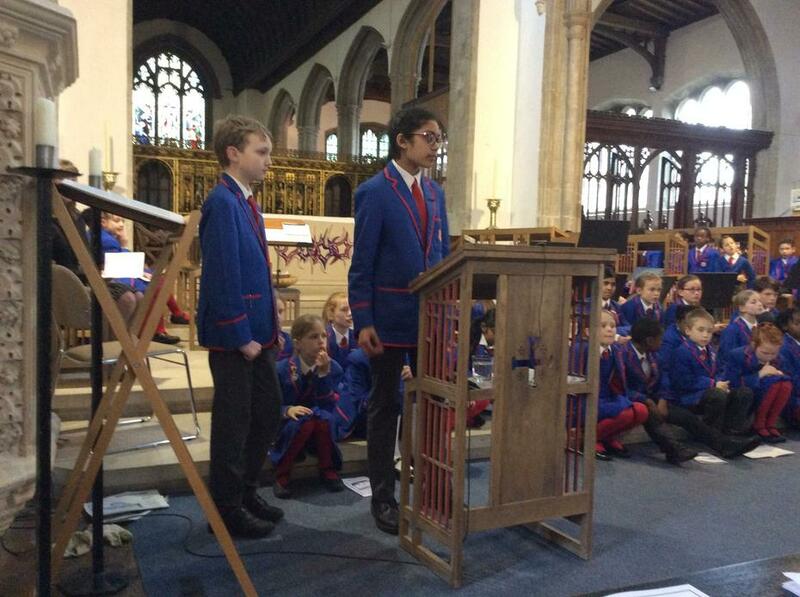 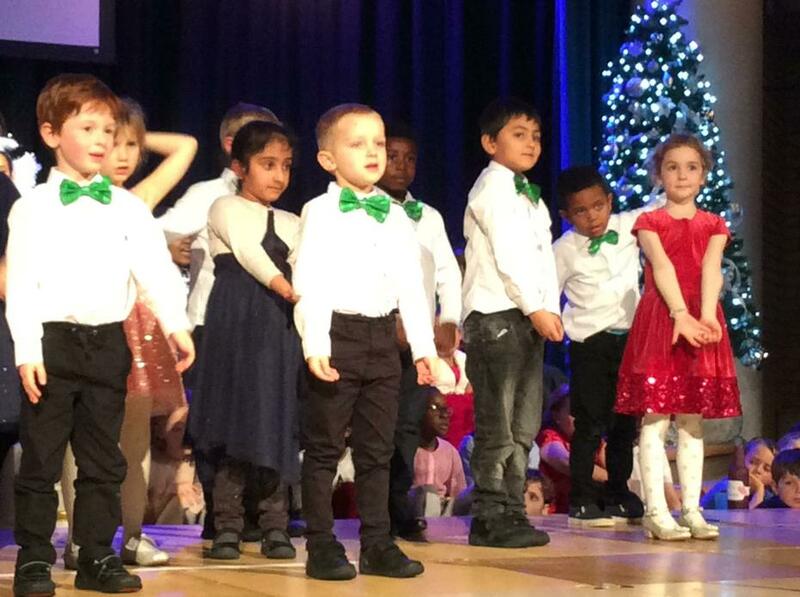 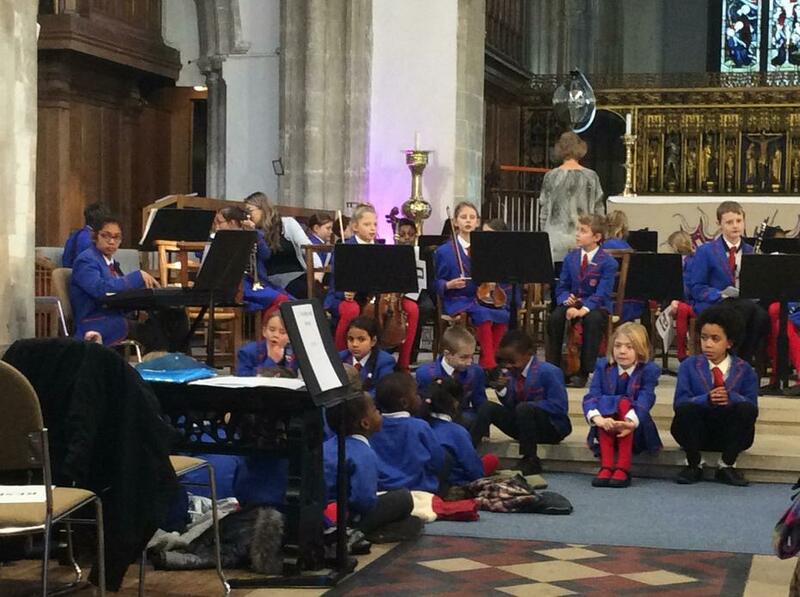 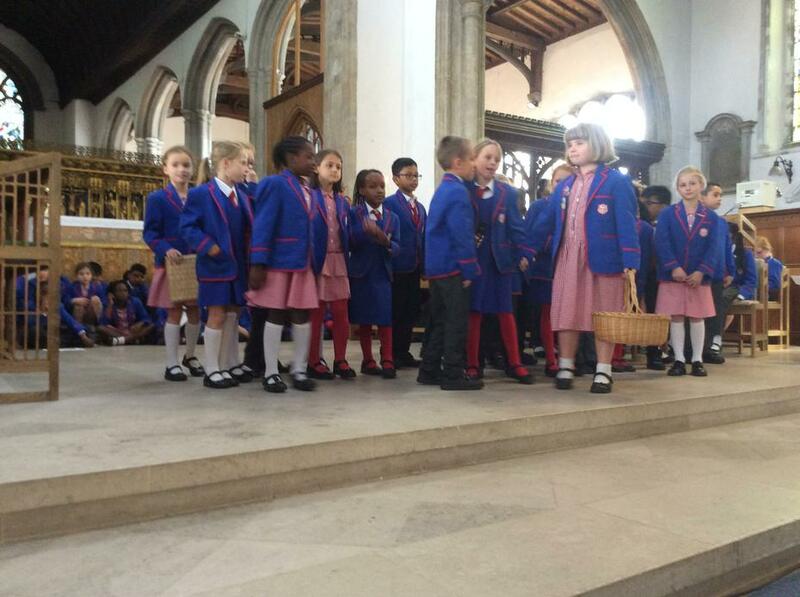 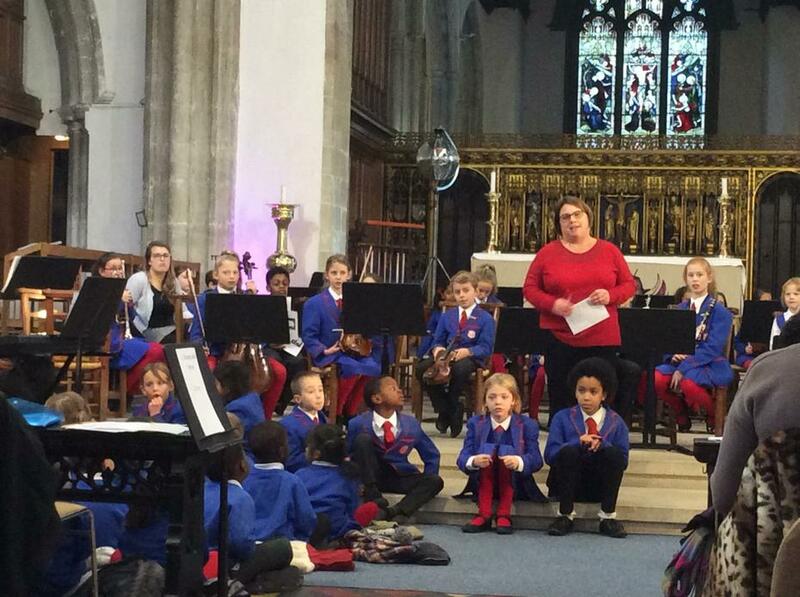 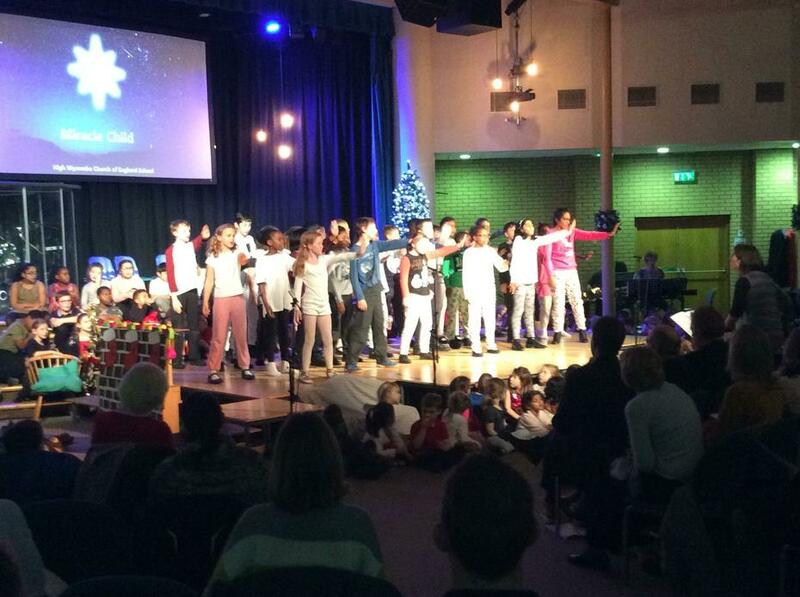 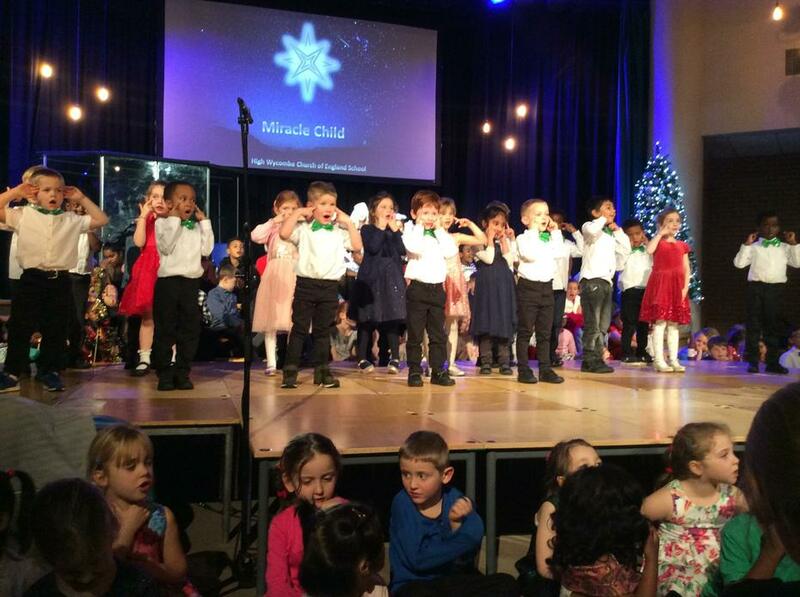 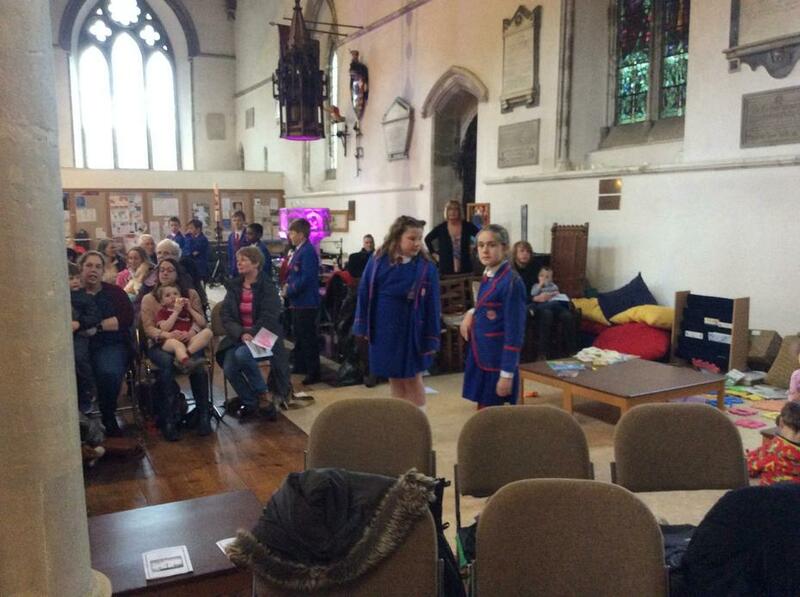 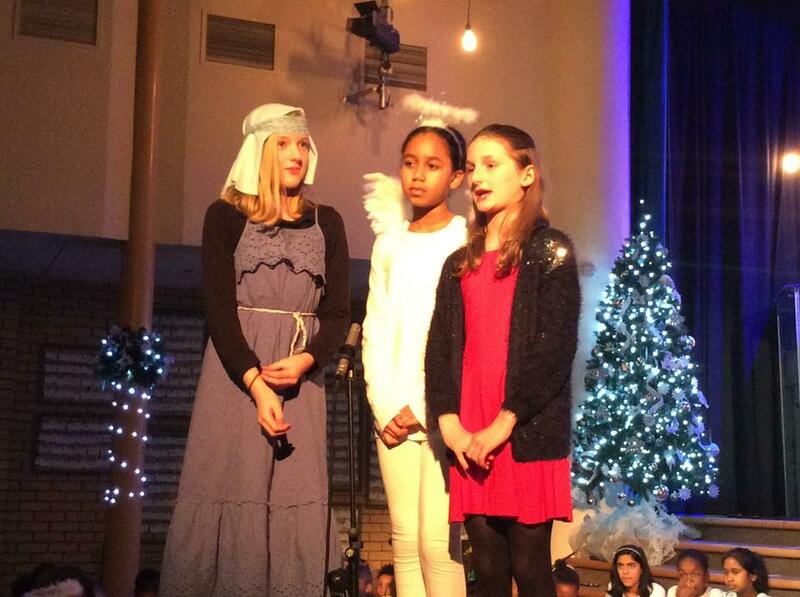 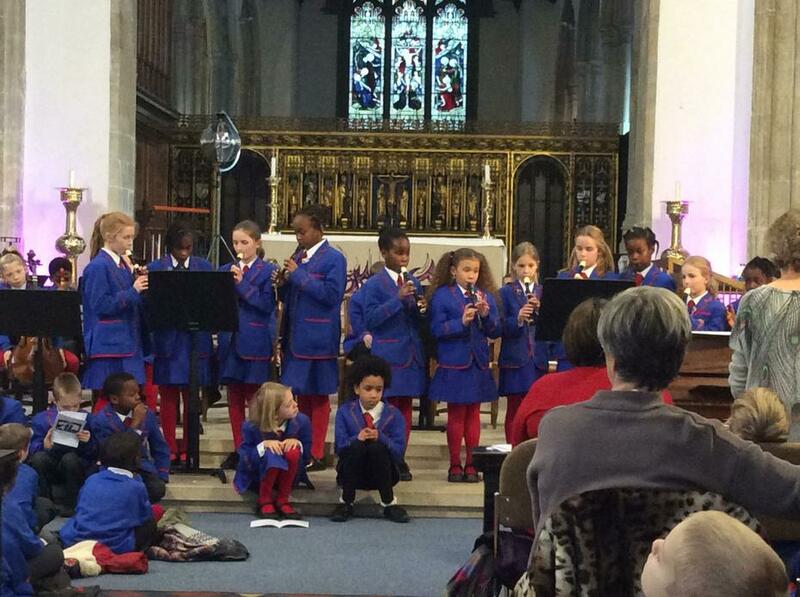 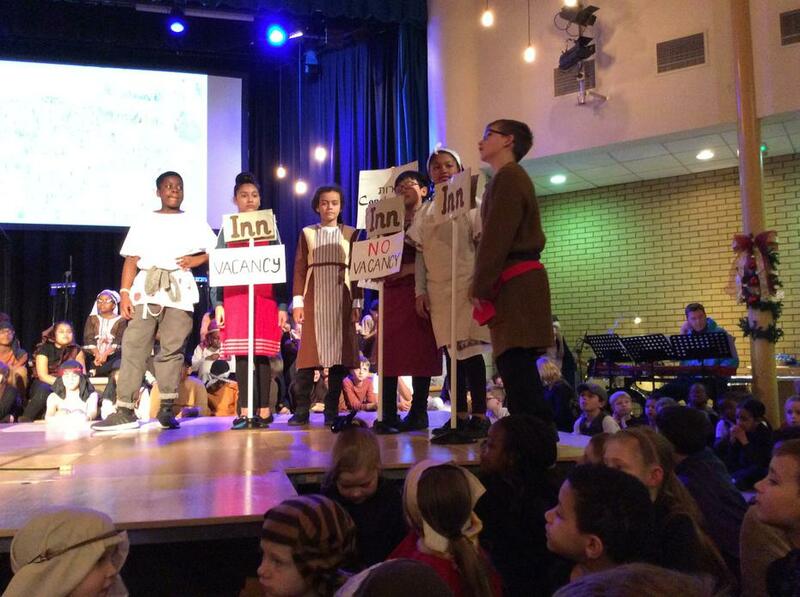 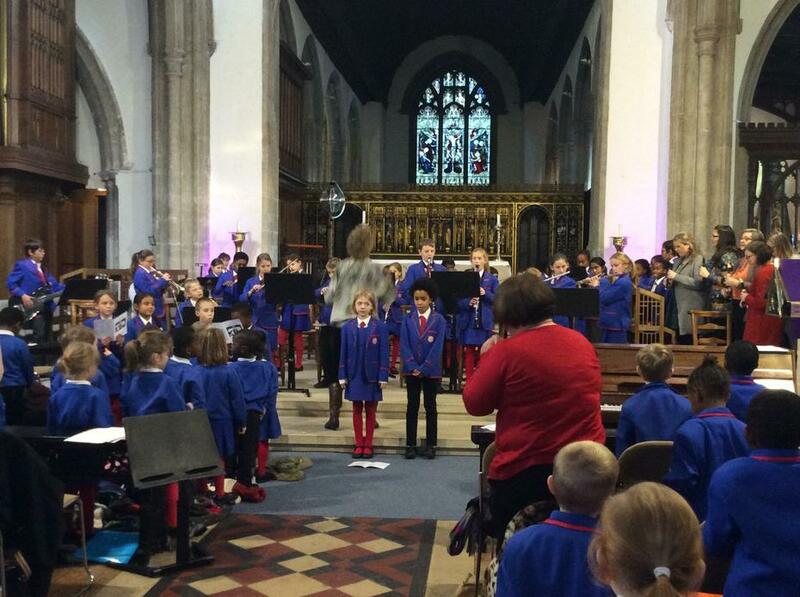 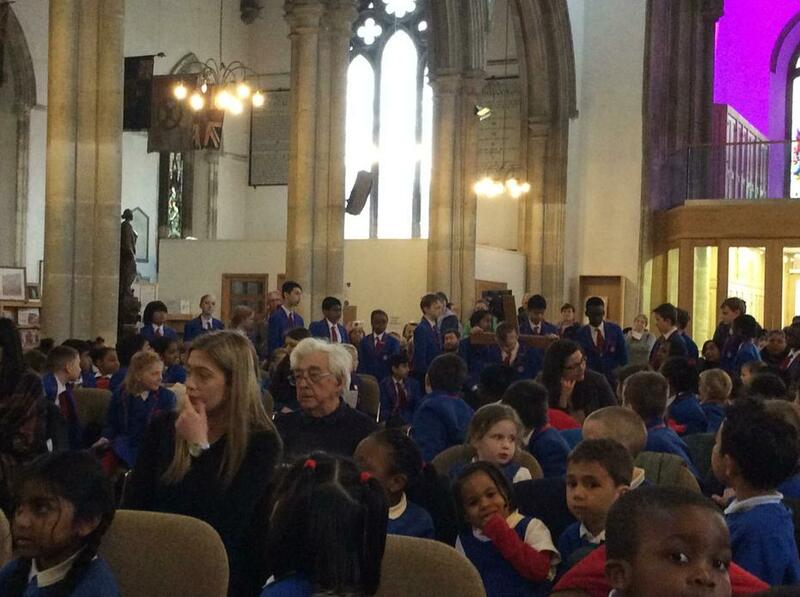 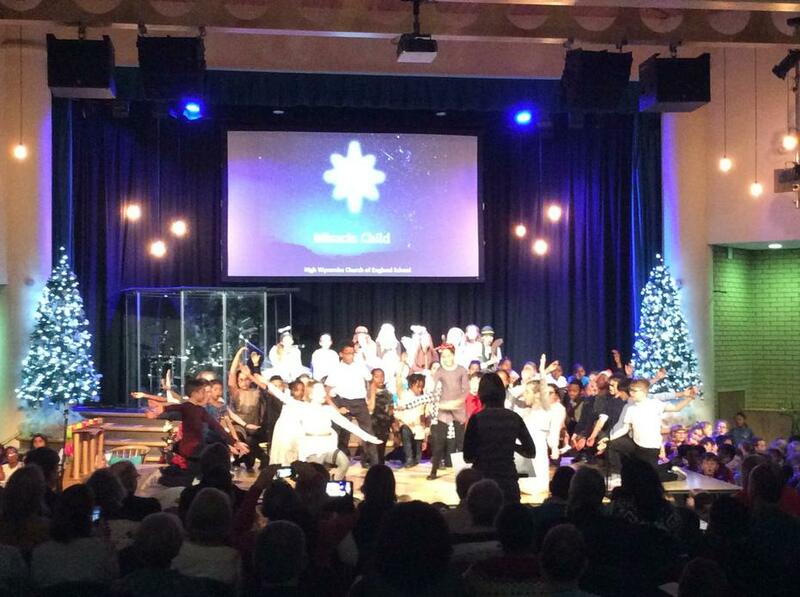 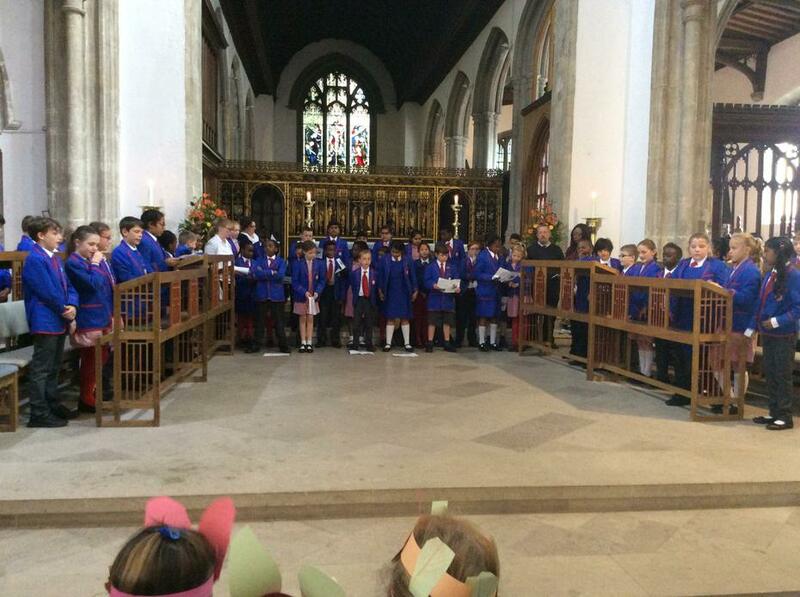 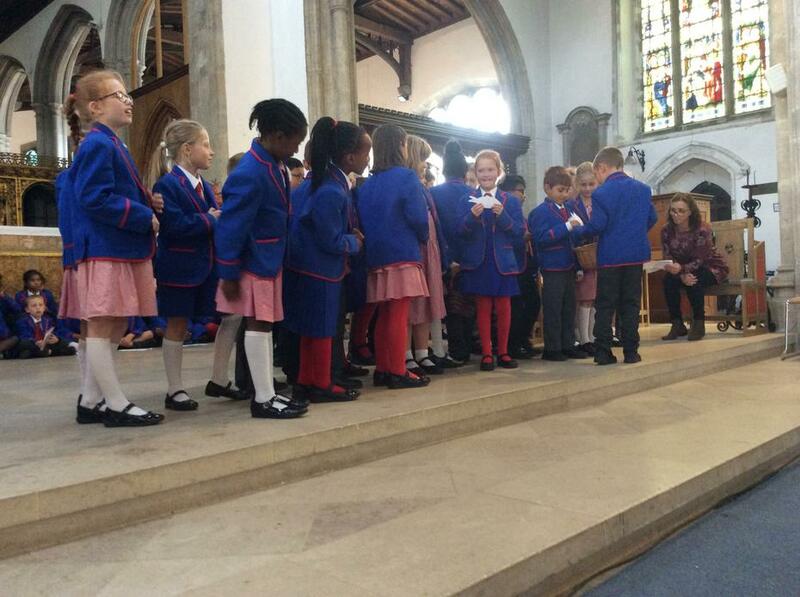 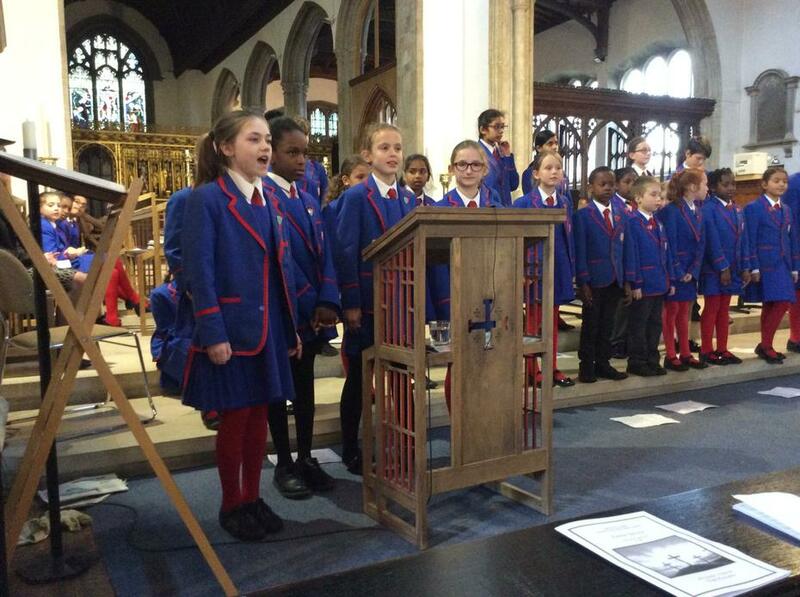 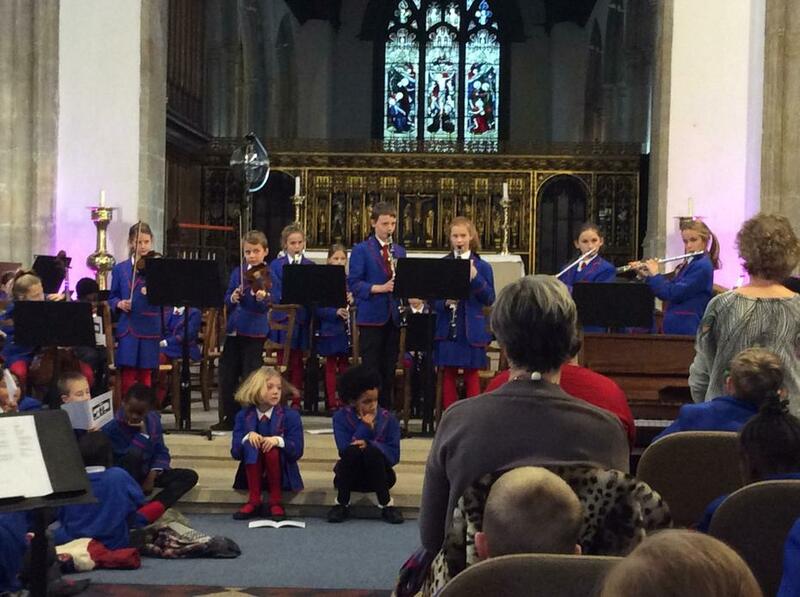 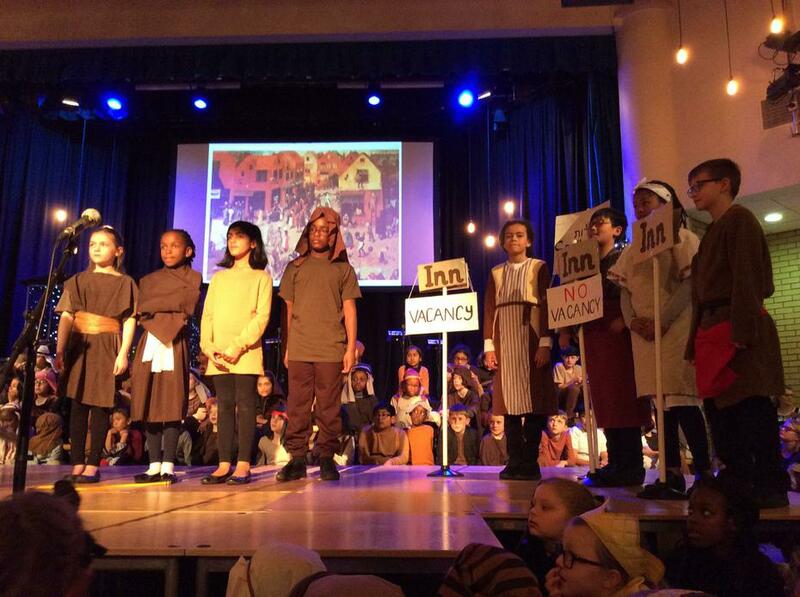 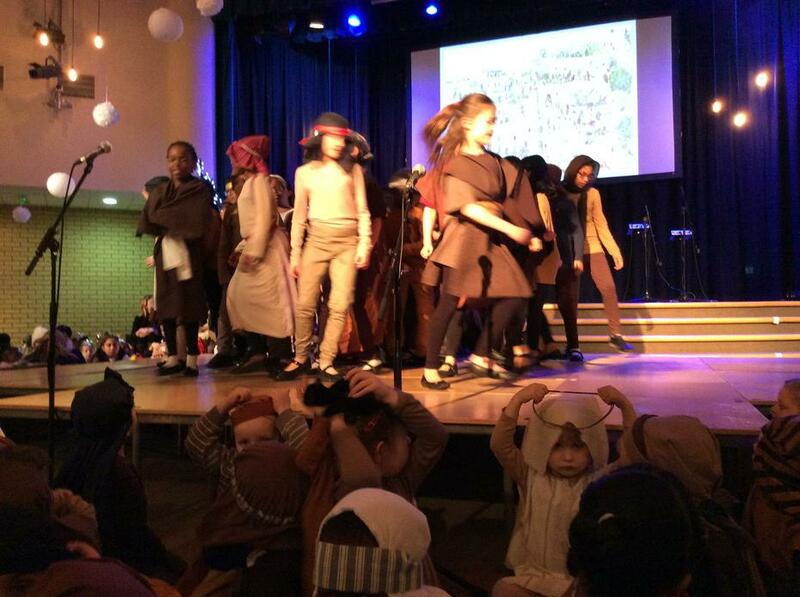 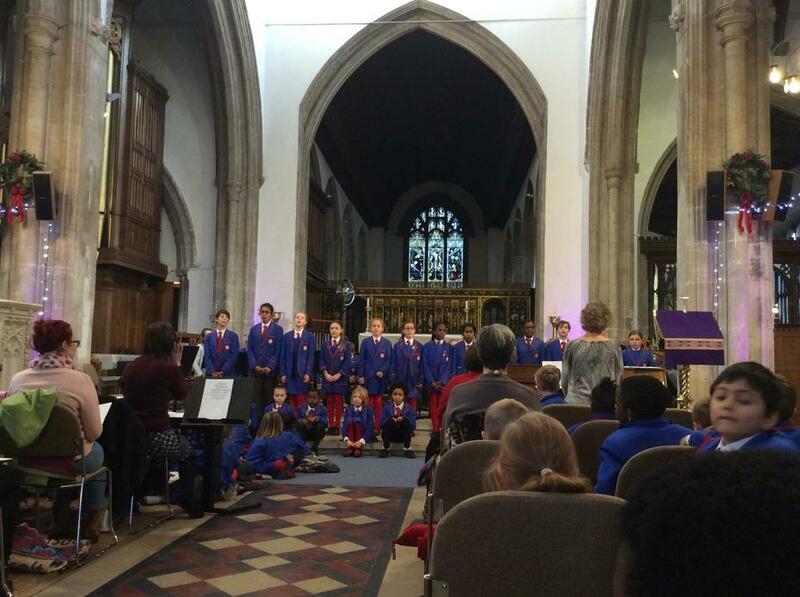 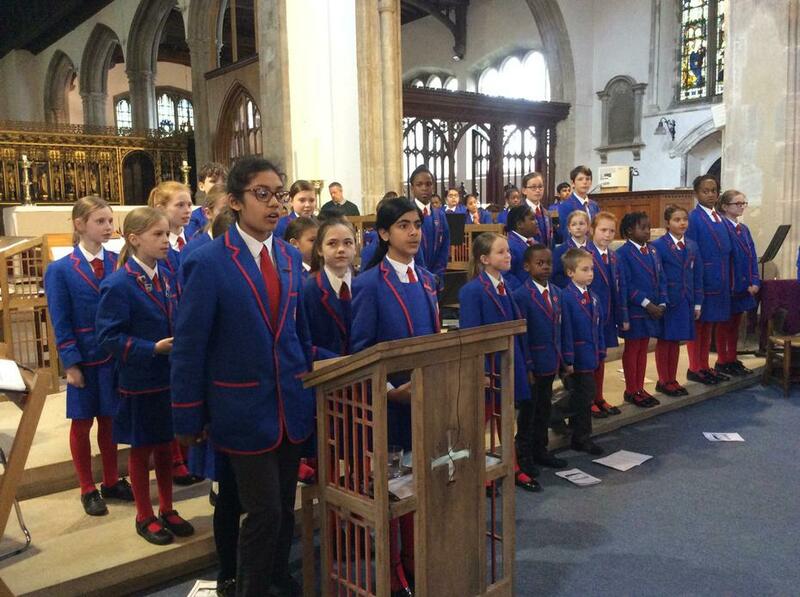 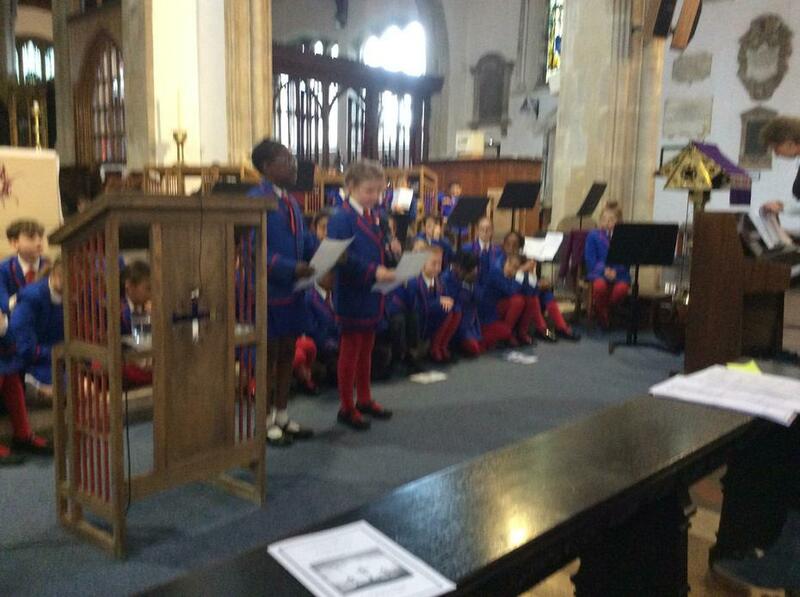 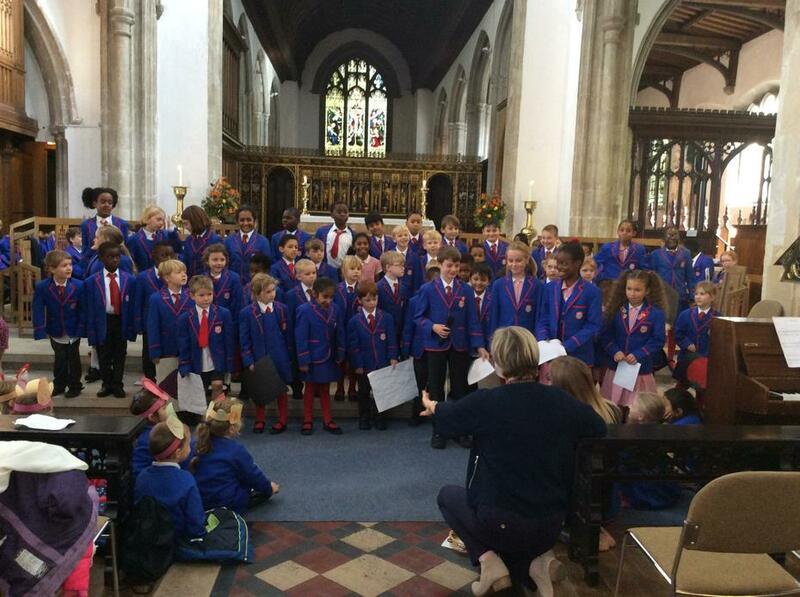 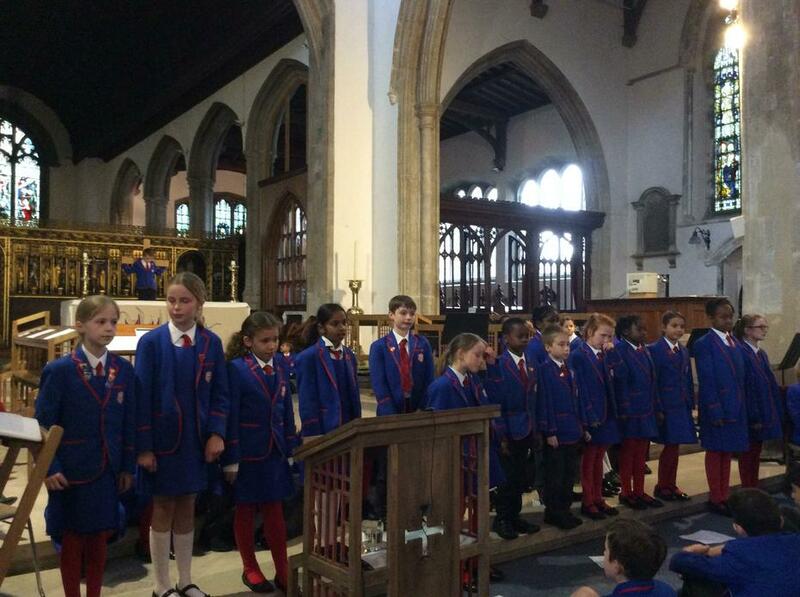 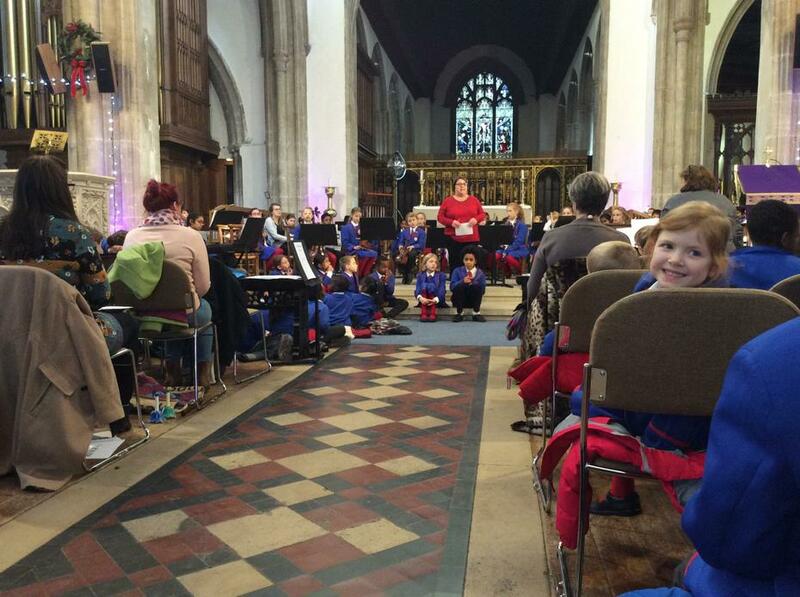 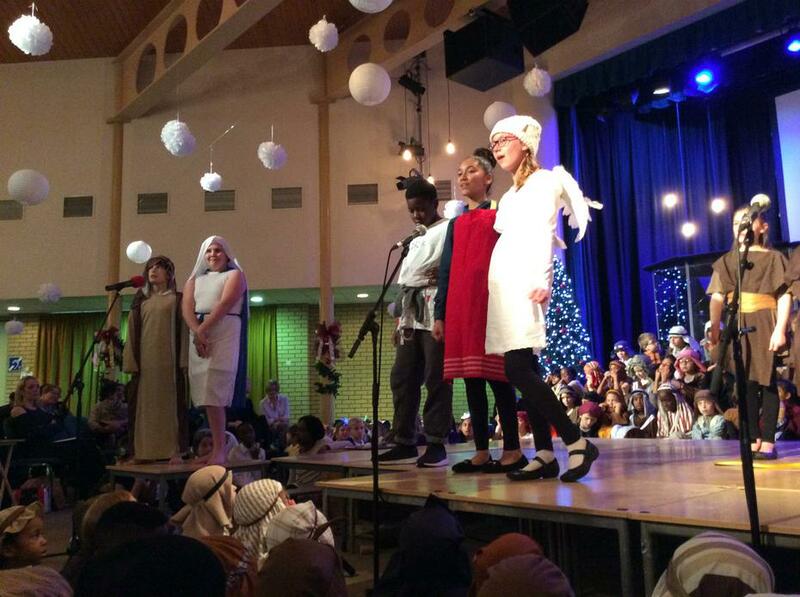 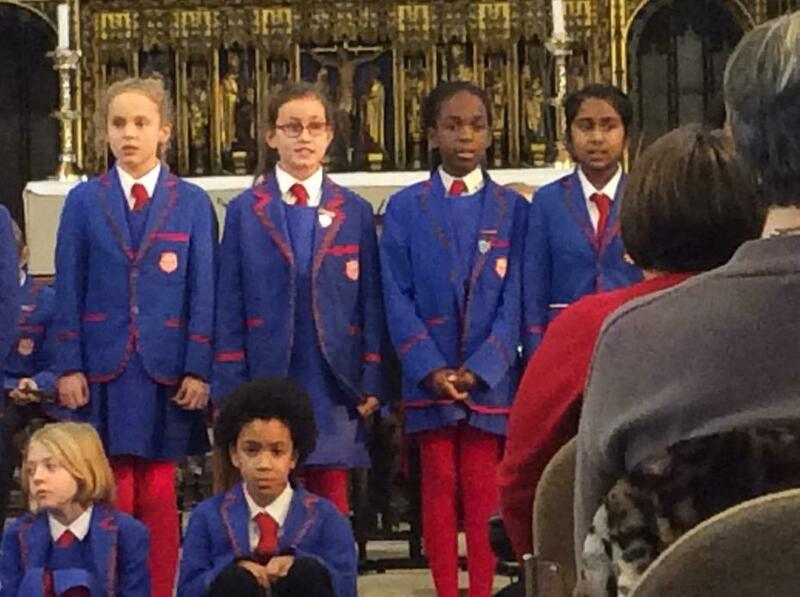 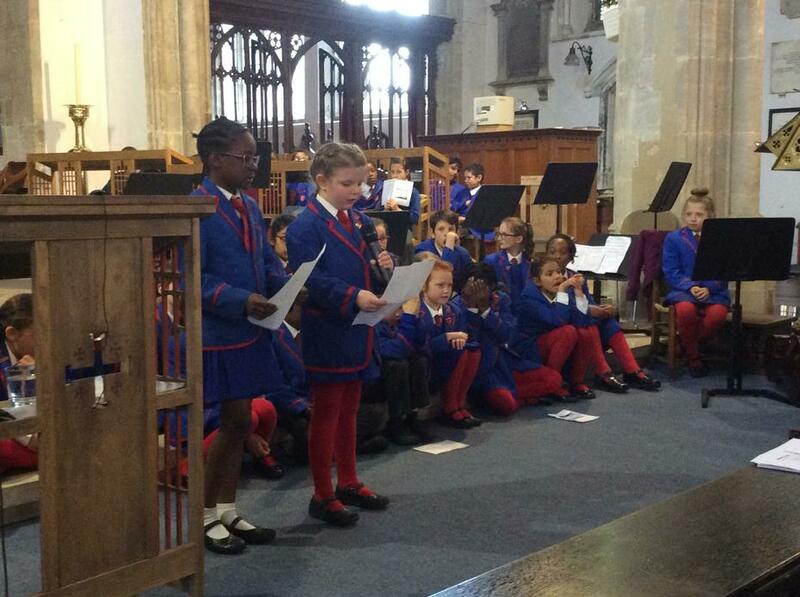 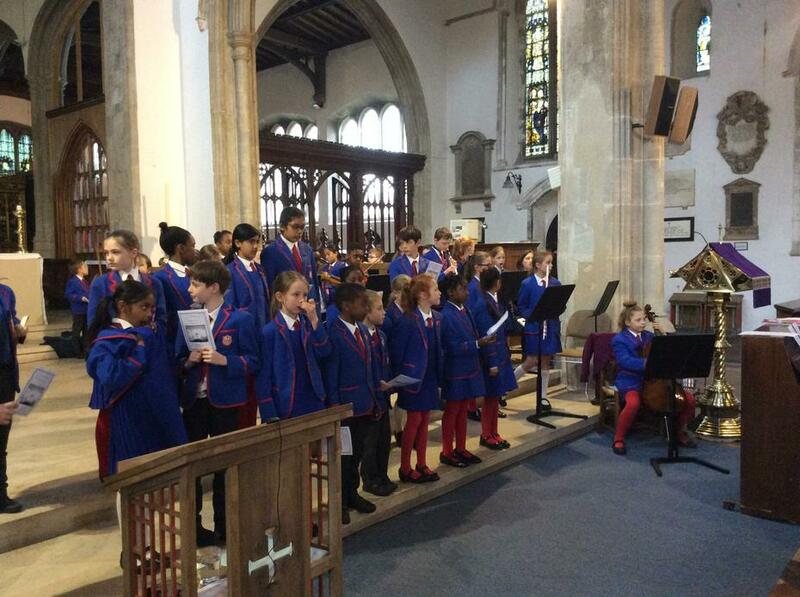 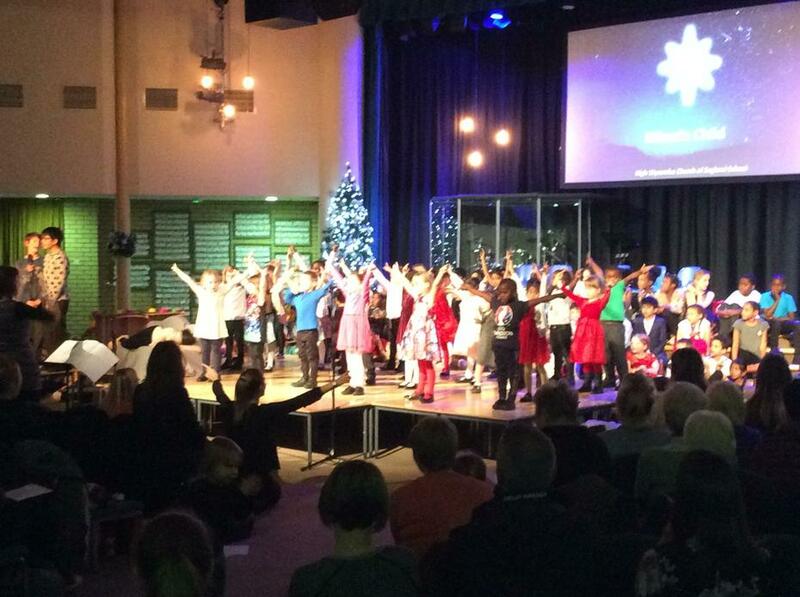 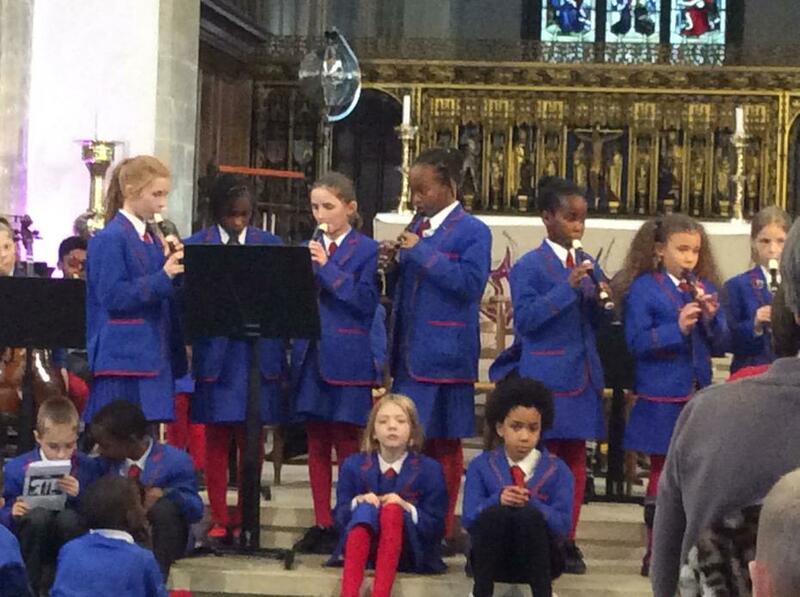 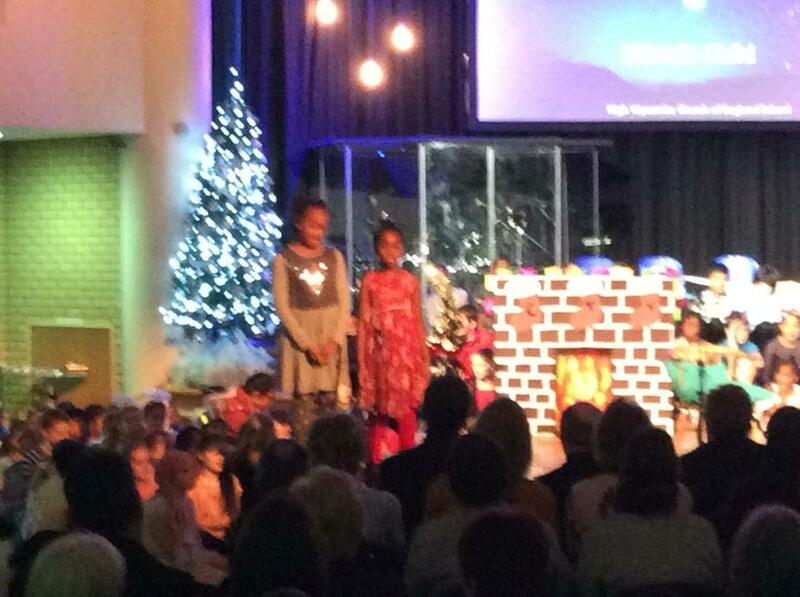 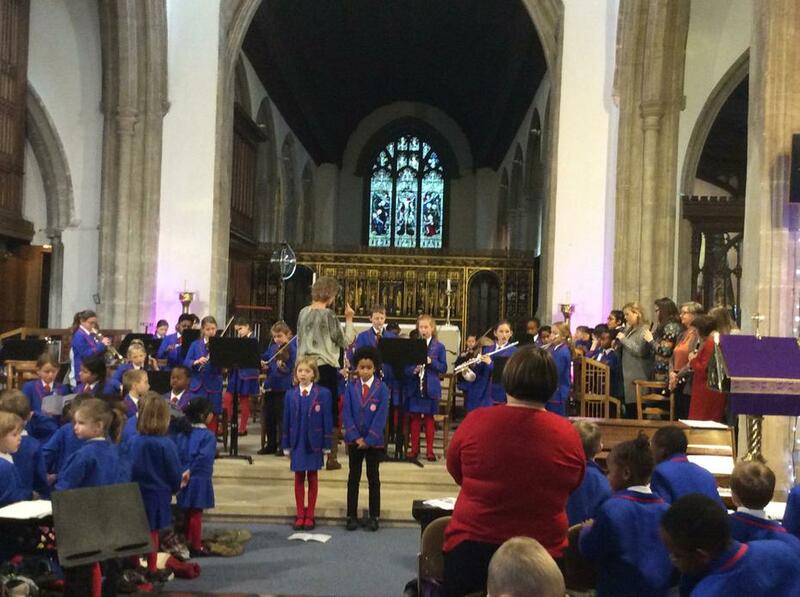 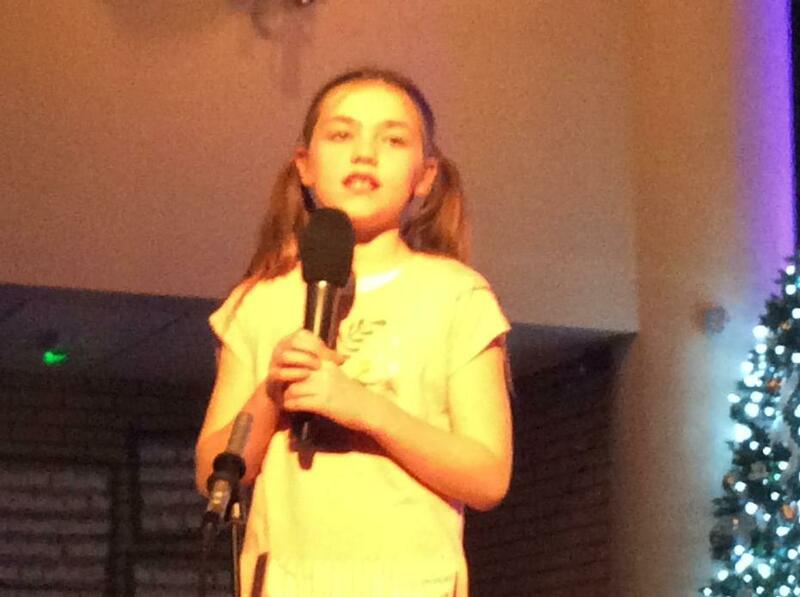 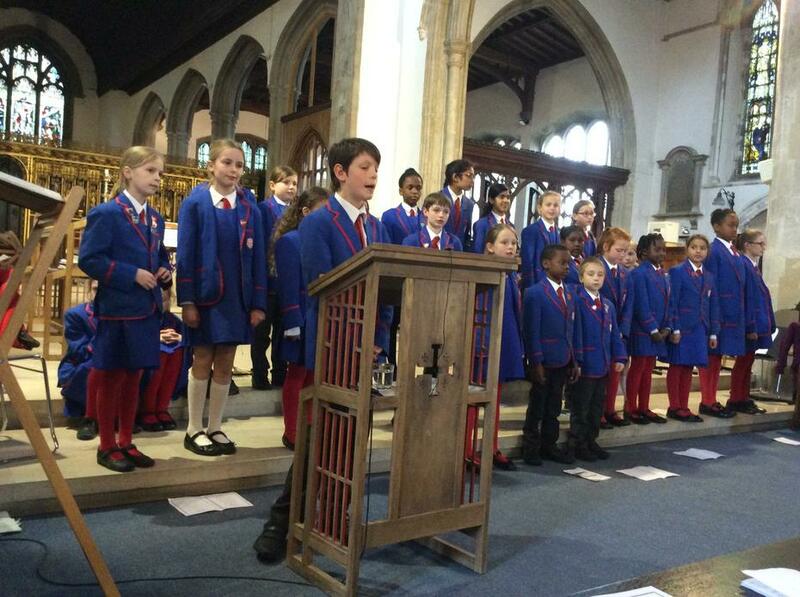 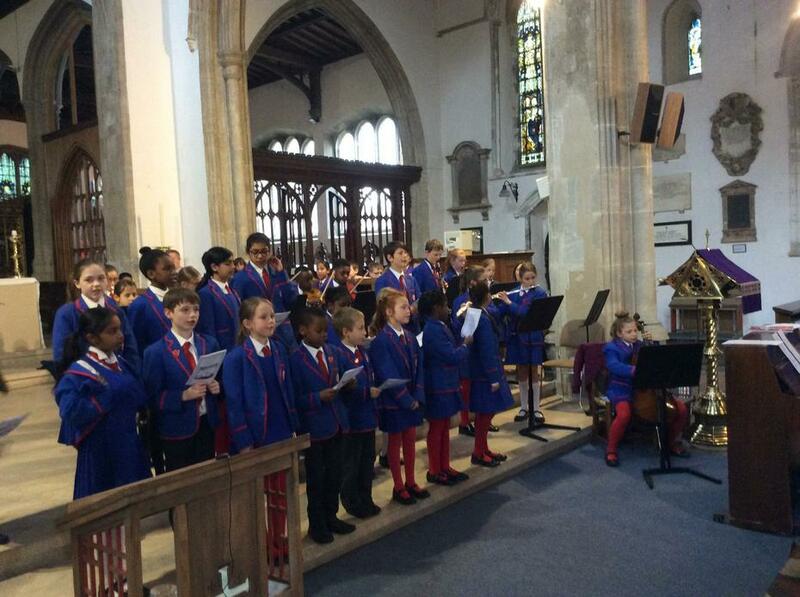 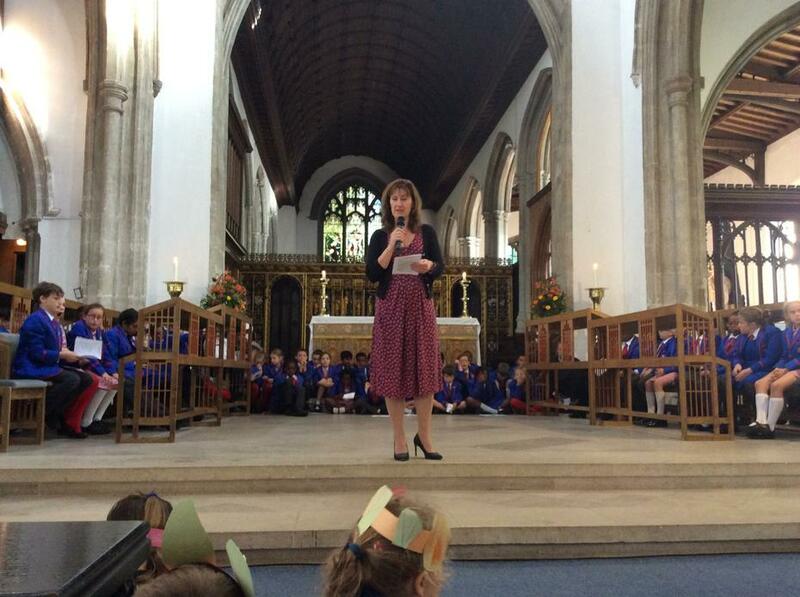 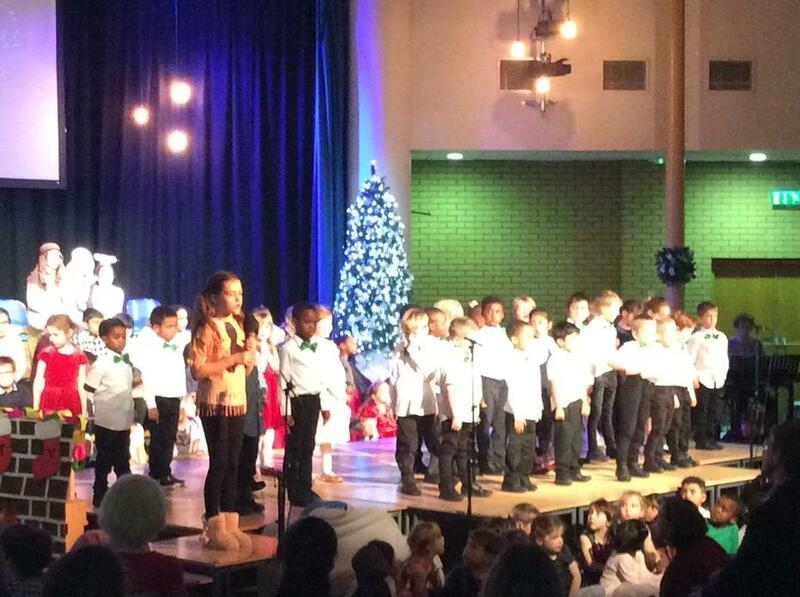 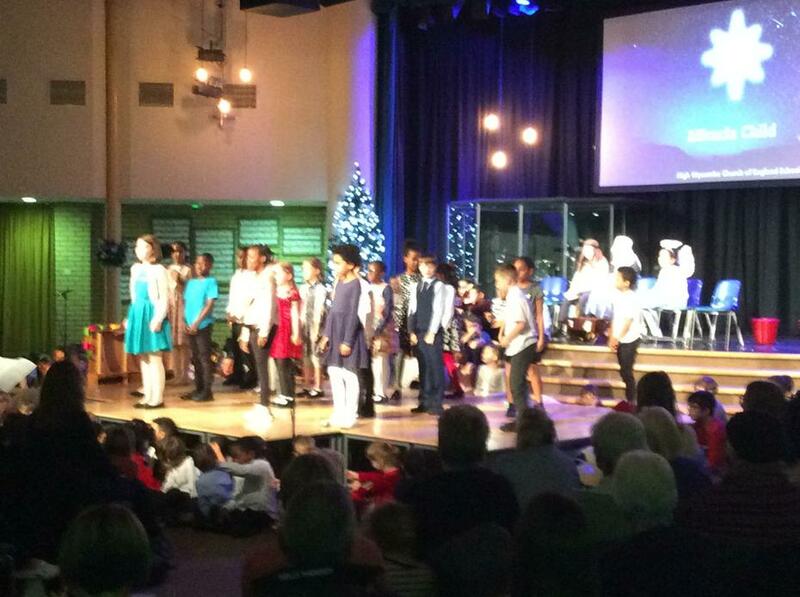 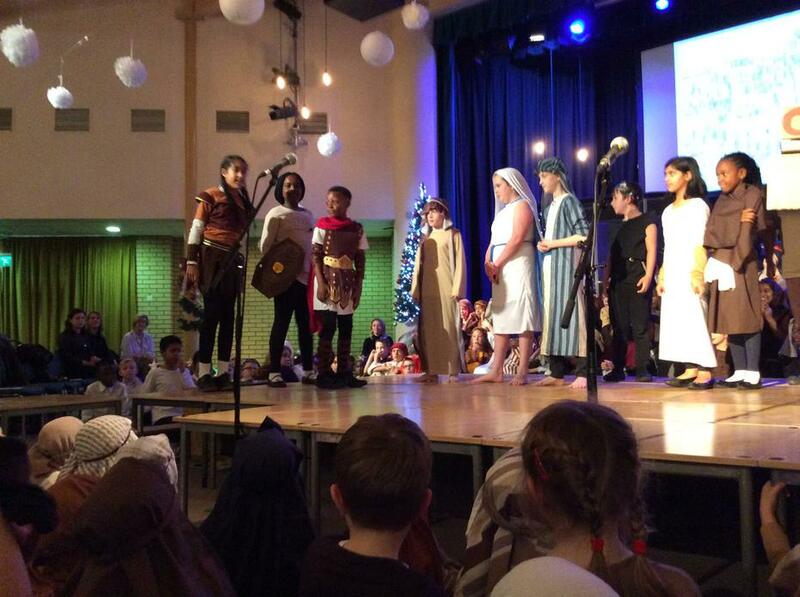 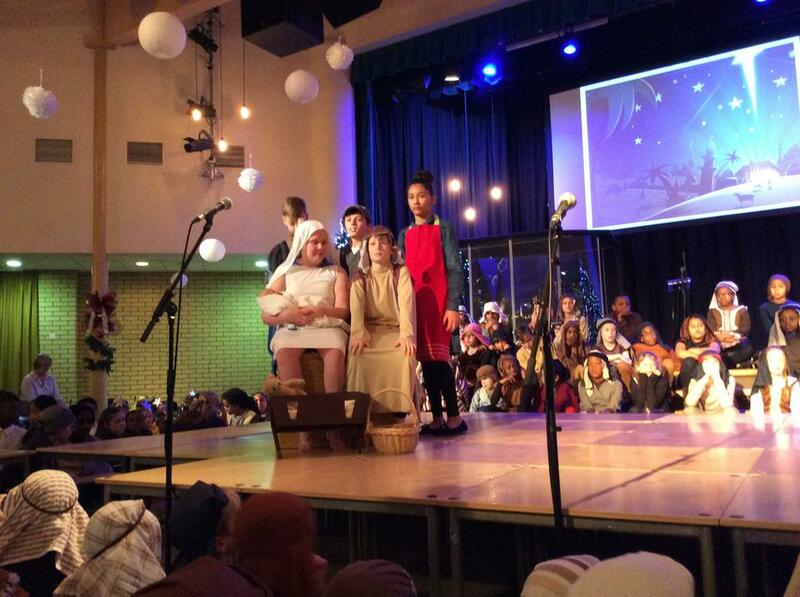 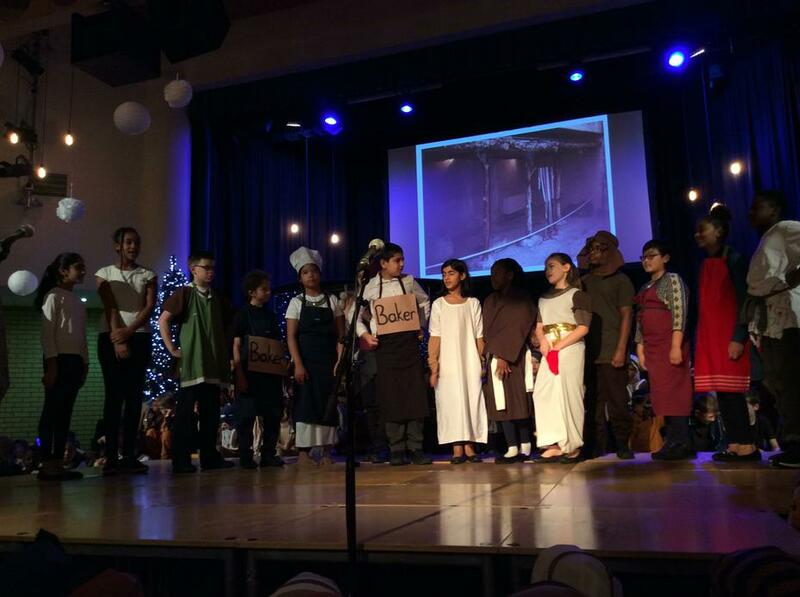 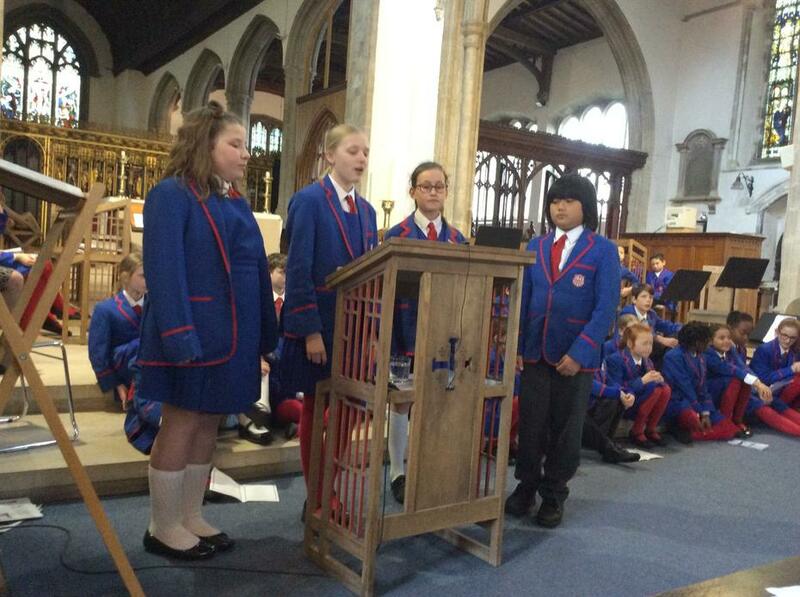 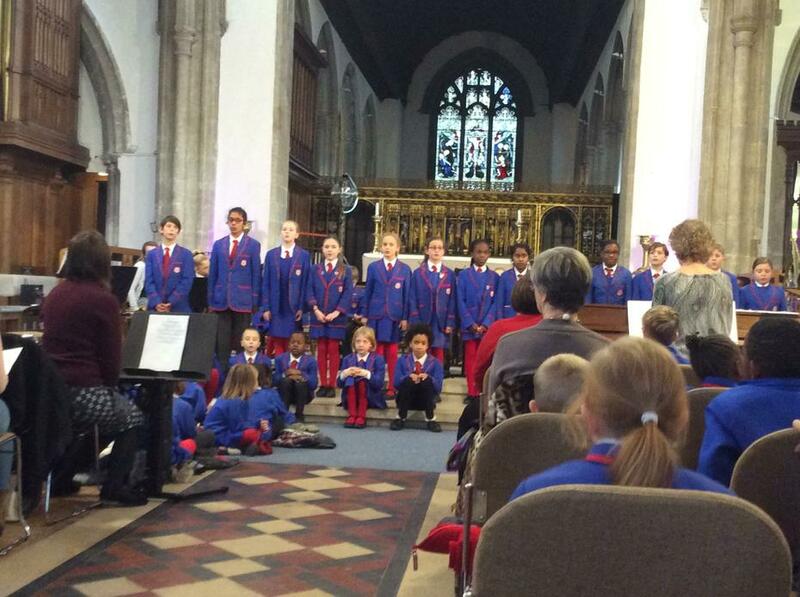 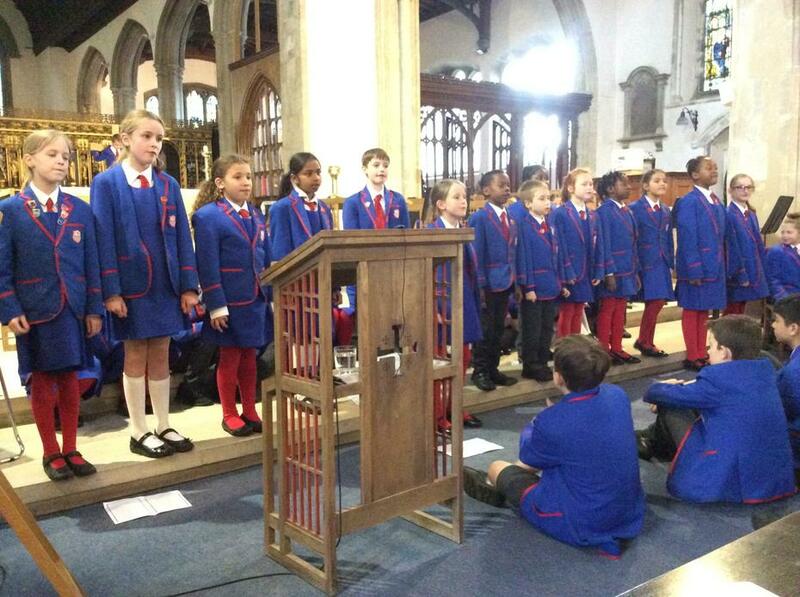 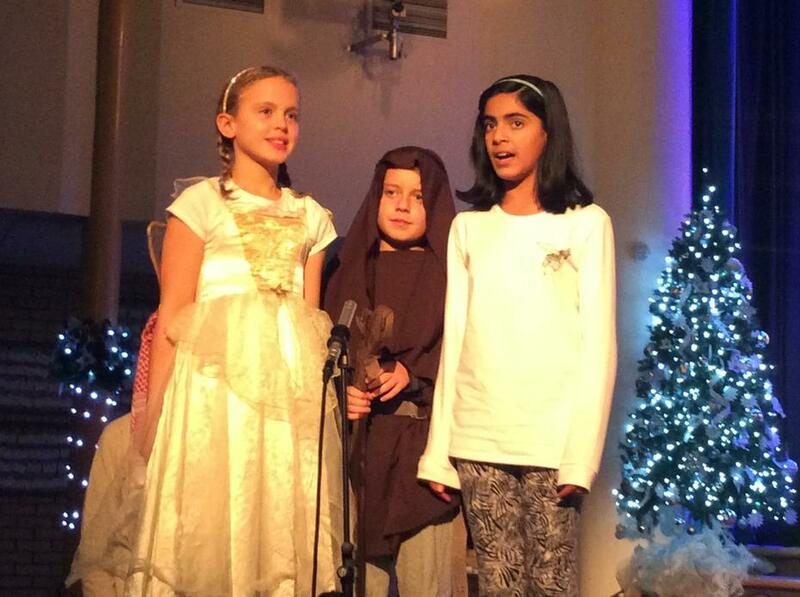 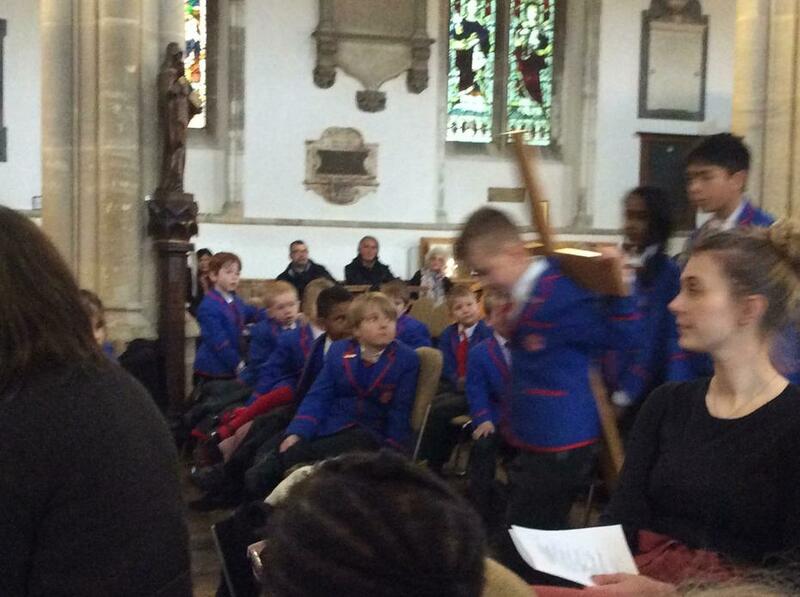 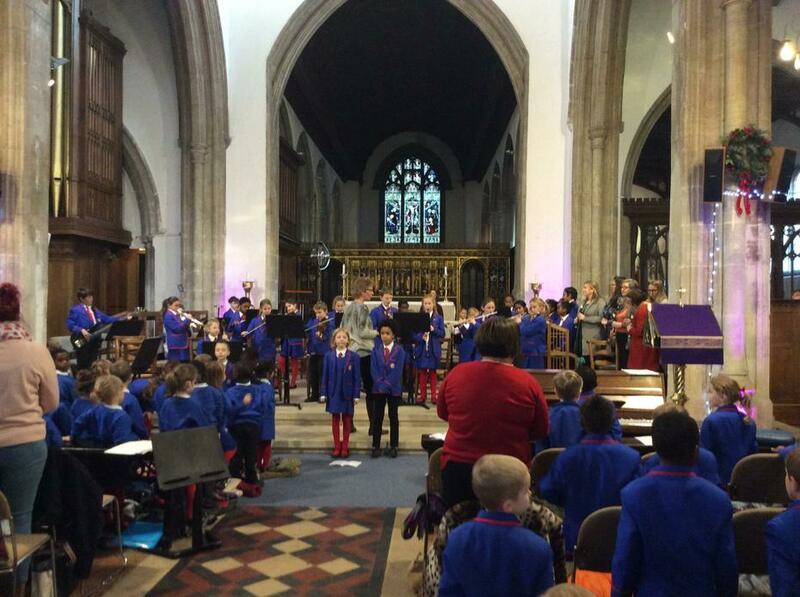 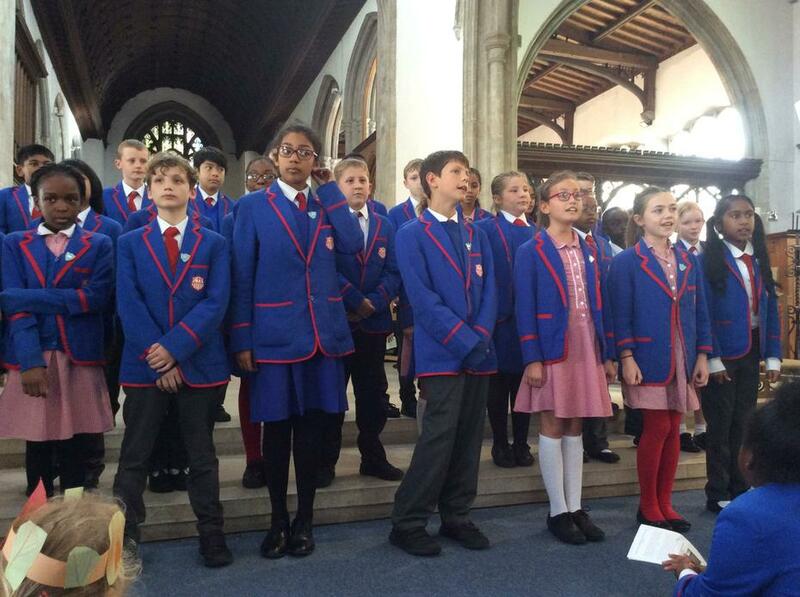 The children also participate in key Christian events in school and present assemblies and other performances to their families and the community. 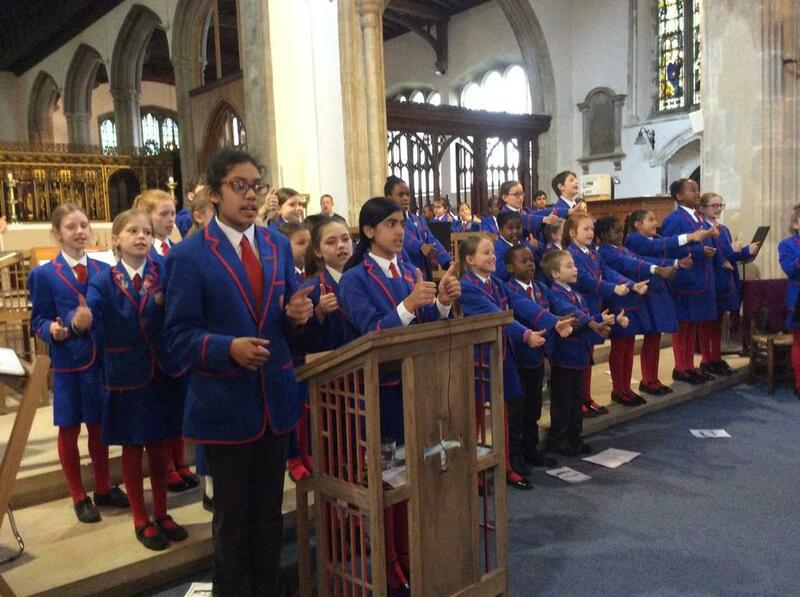 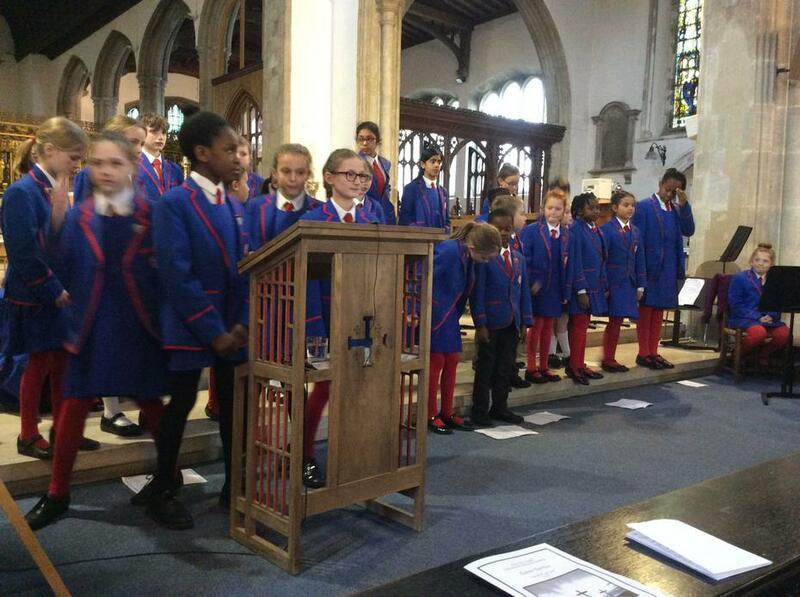 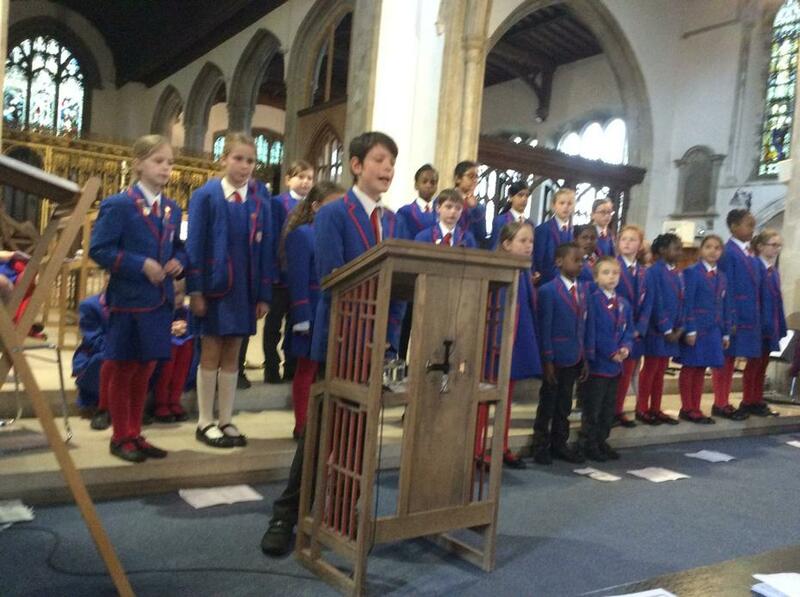 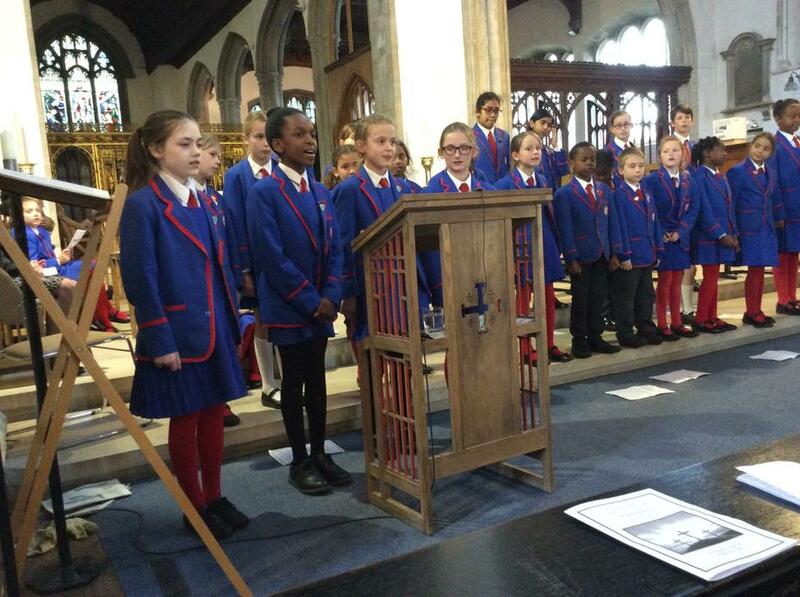 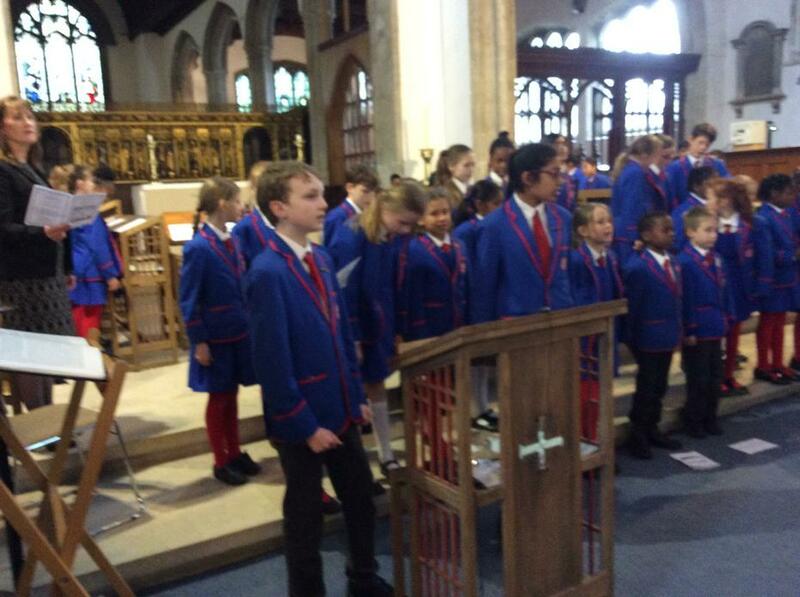 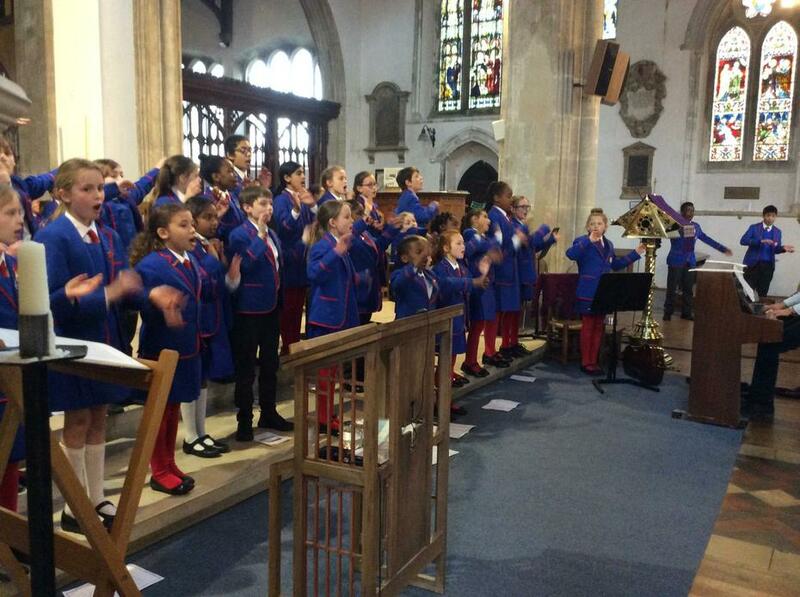 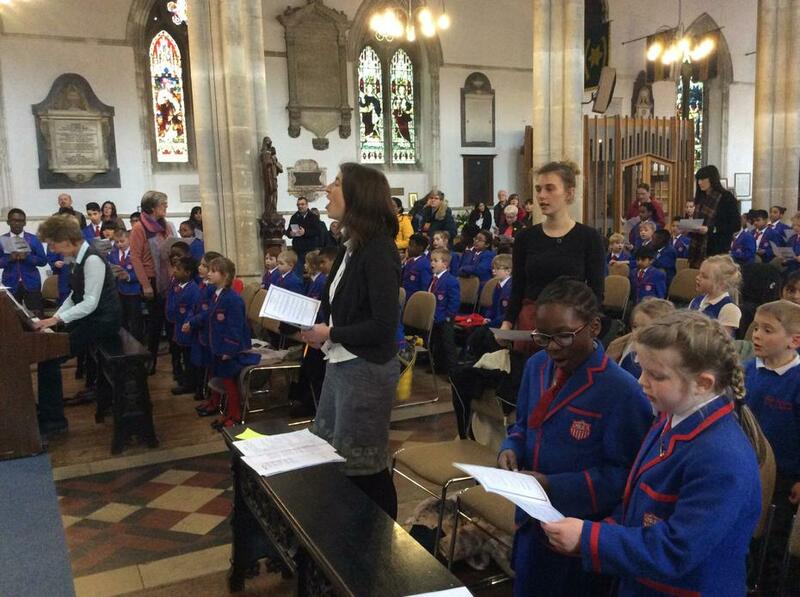 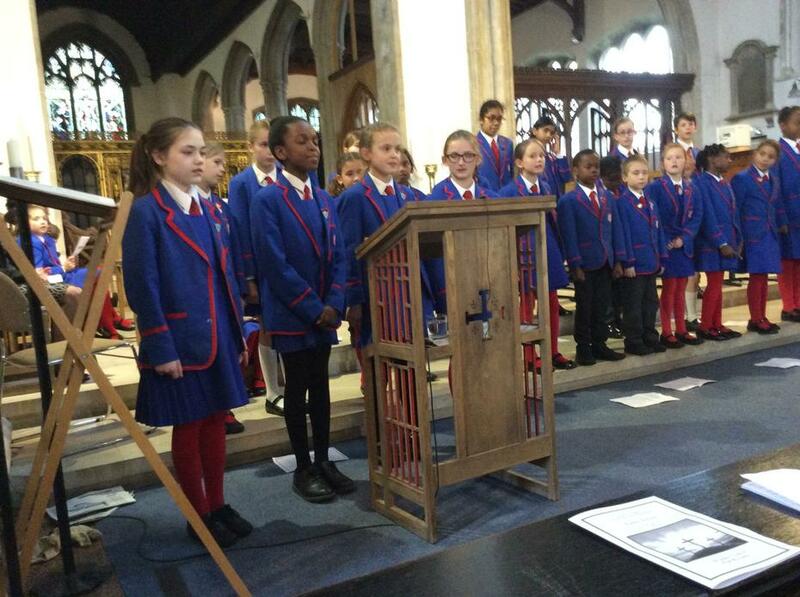 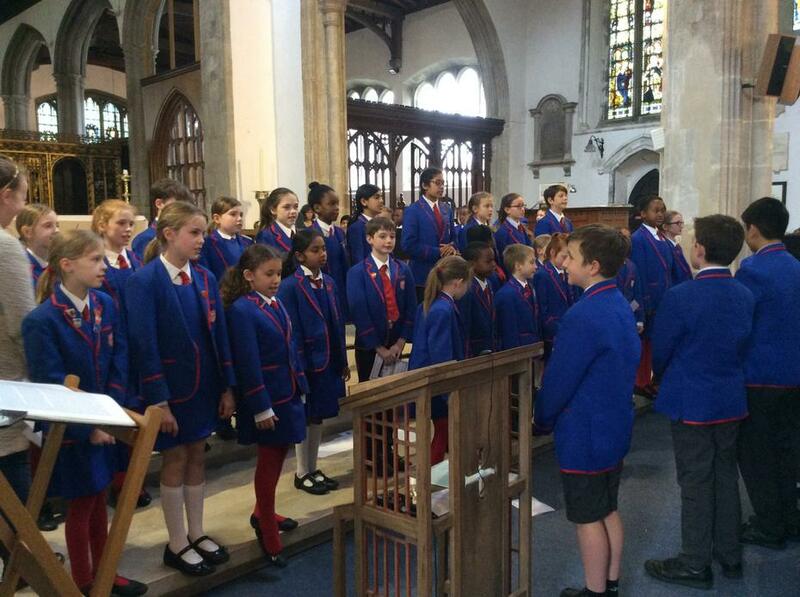 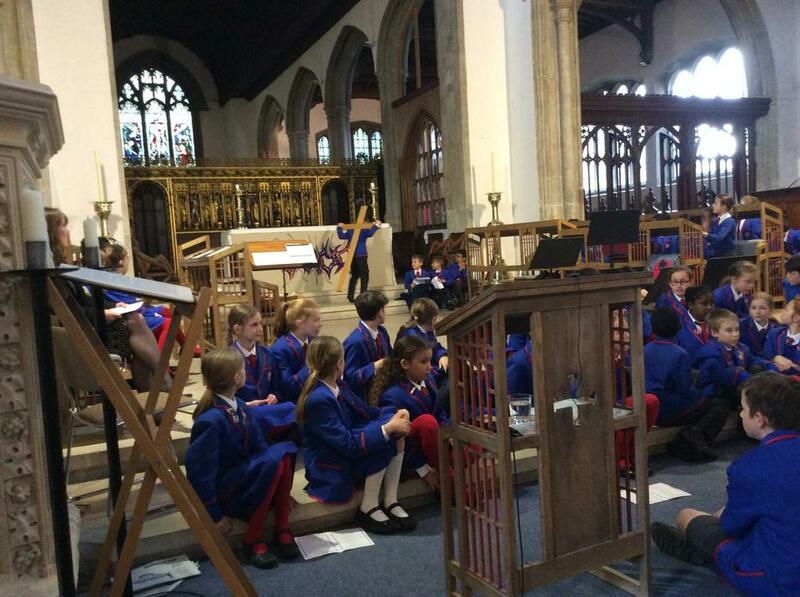 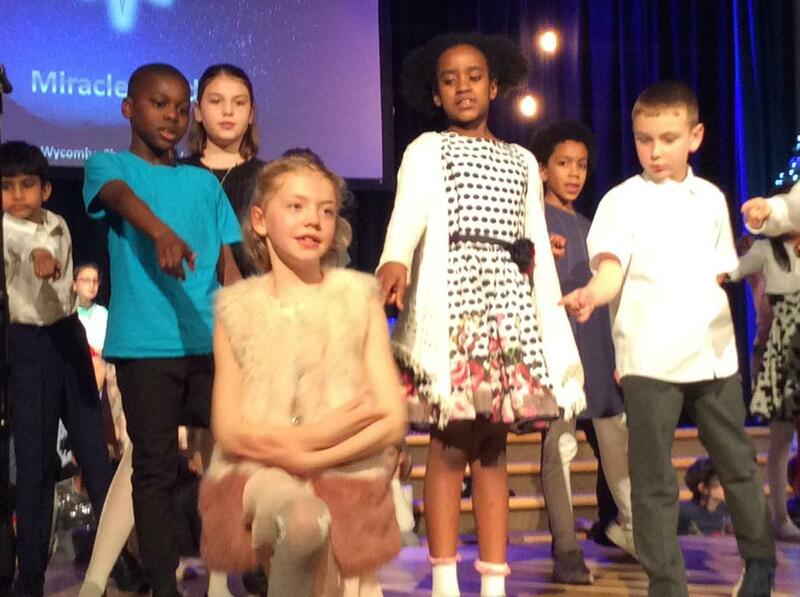 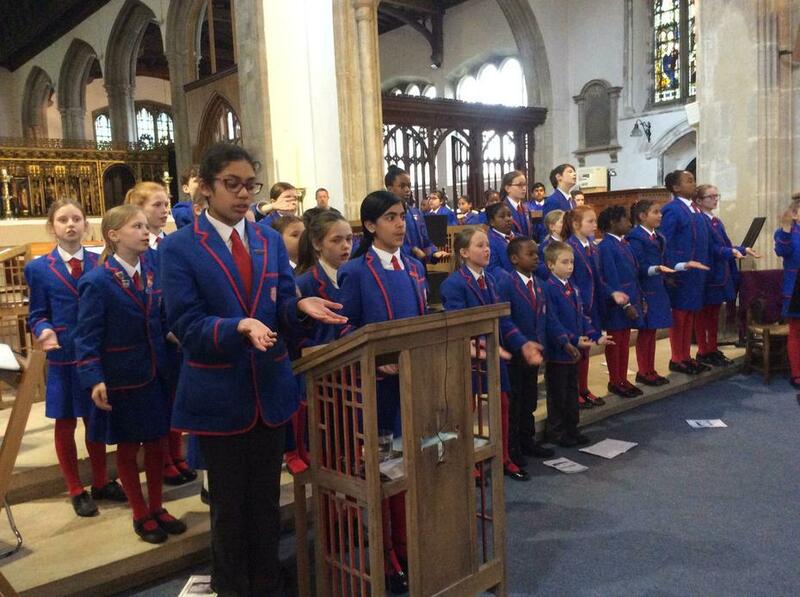 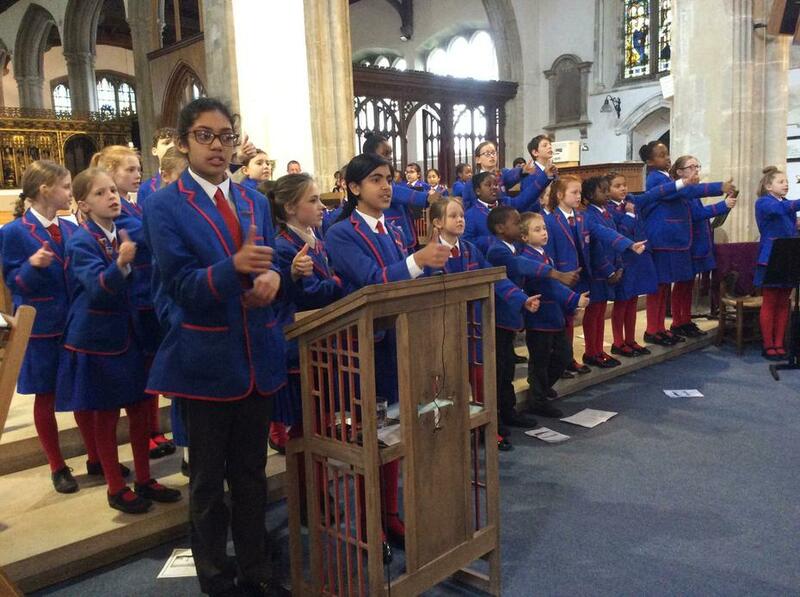 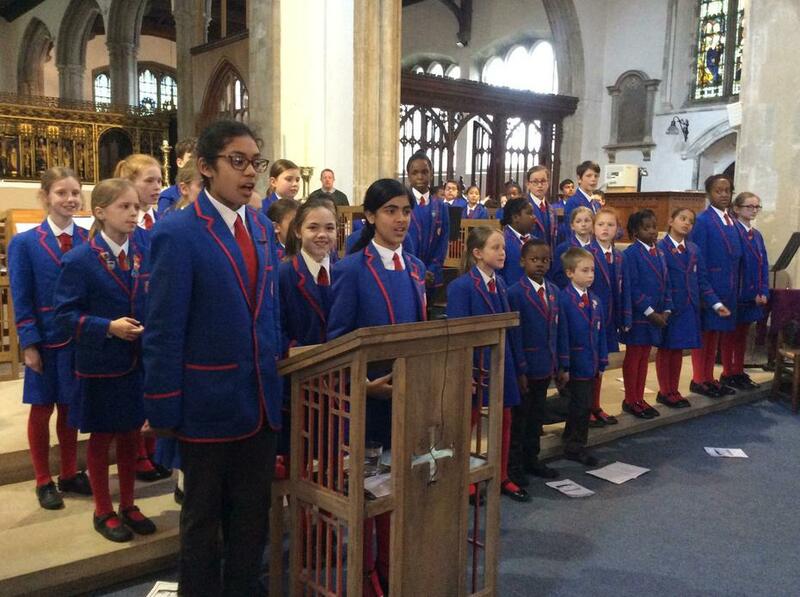 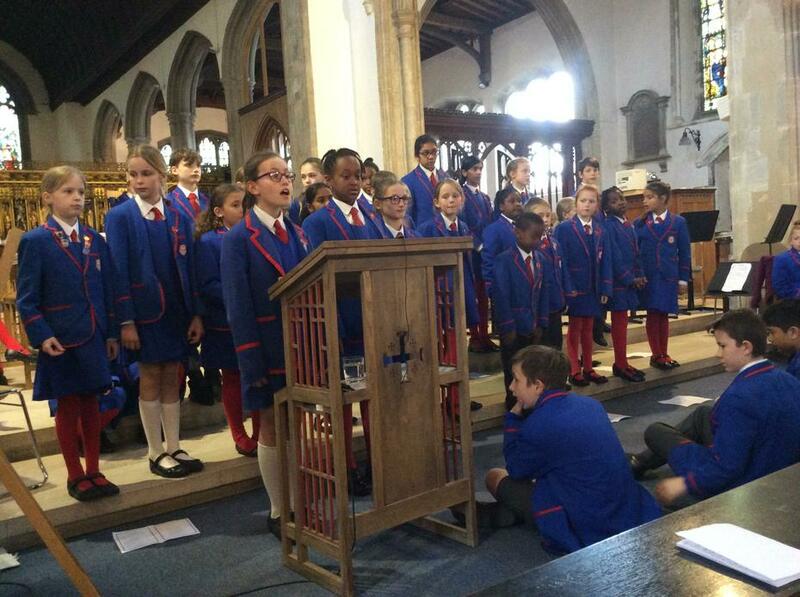 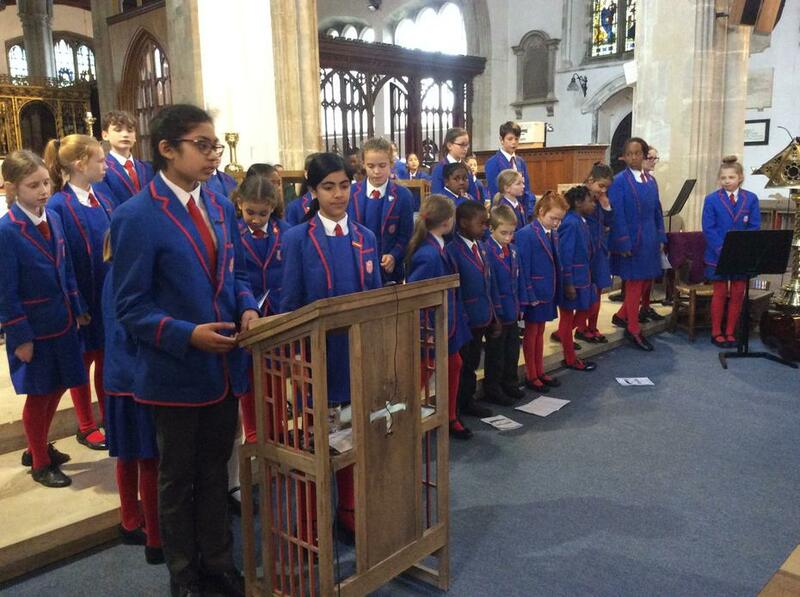 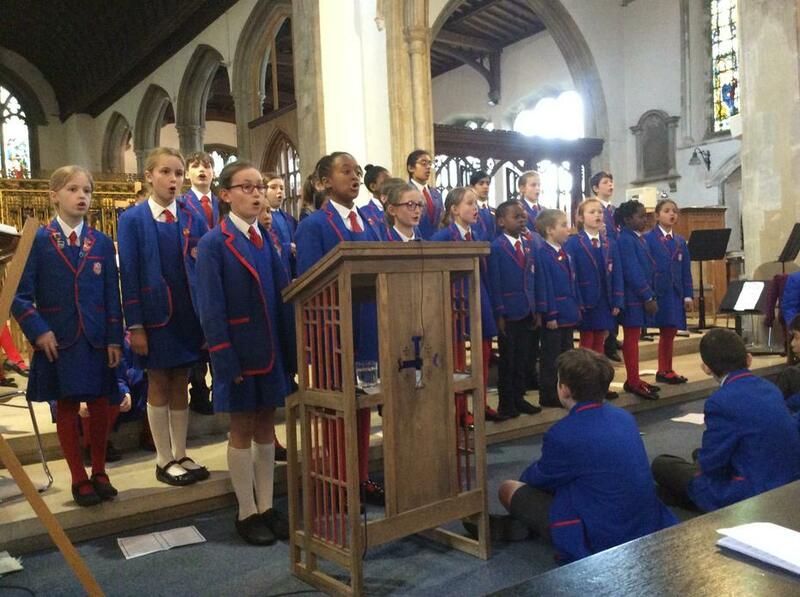 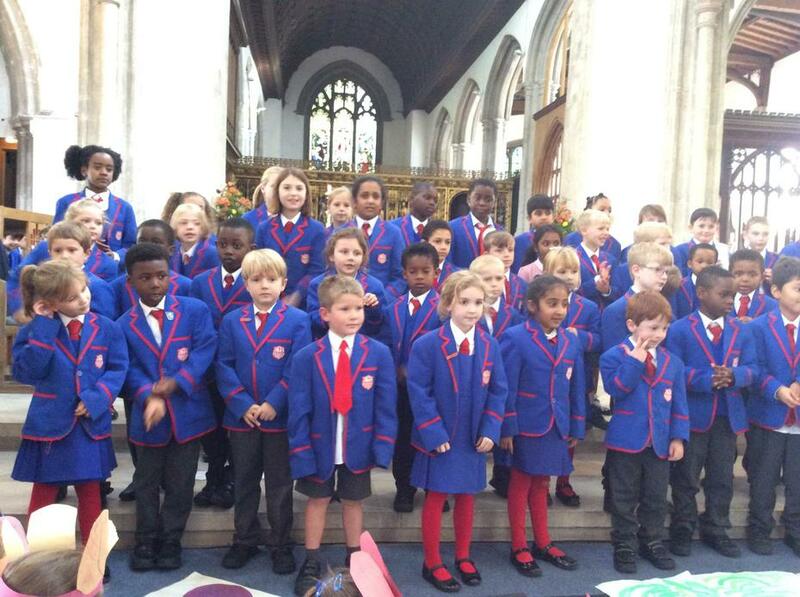 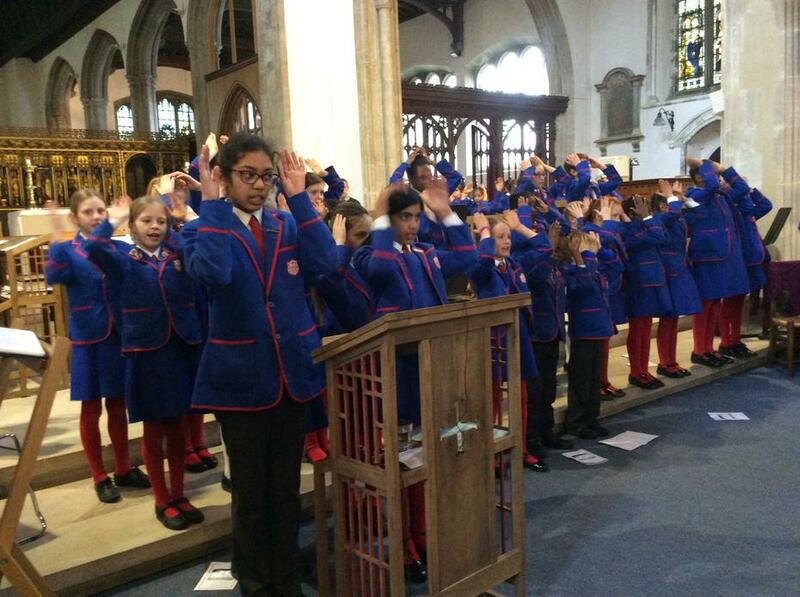 As a church school, High Wycombe Church of England School aims to develop its religious character taking into account the principles of the Church of England and promotes Christian values through the experience we offer to all our pupils. 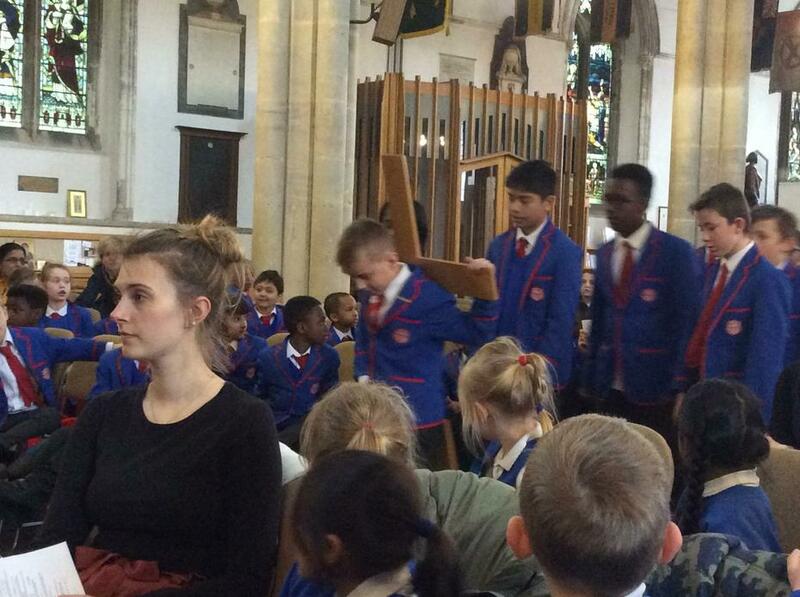 How can you tell we are a church school? 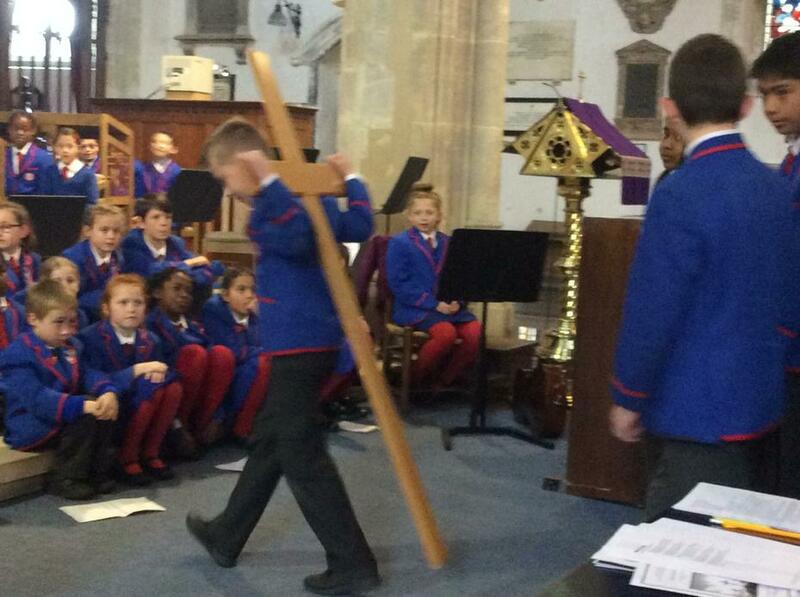 Our school entrance hall and central corridor clearly displays the Christian values that encapsulate our school as well as a large cross in our hall. 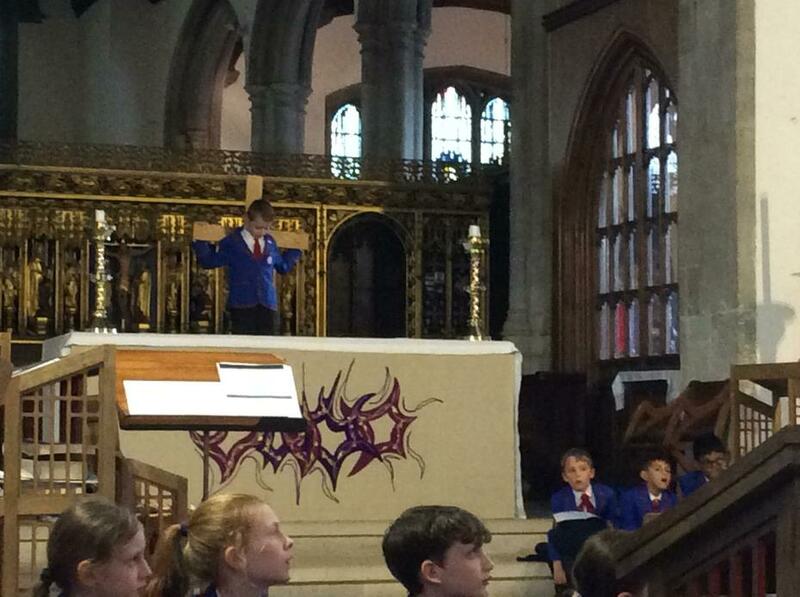 Each classroom has an area for Christian spiritual reflection and prayer with candle and a cross. 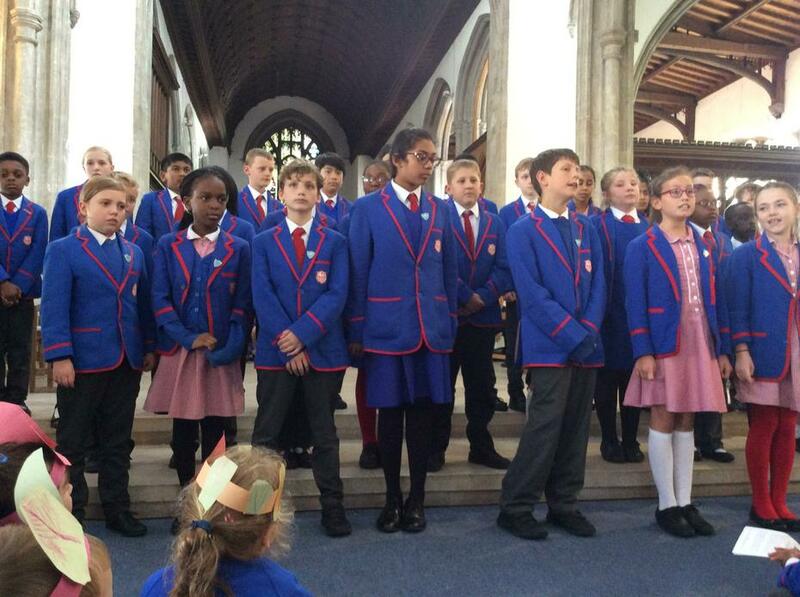 Our school uniform has a logo with a cross and the letters 'C' and 'E'. 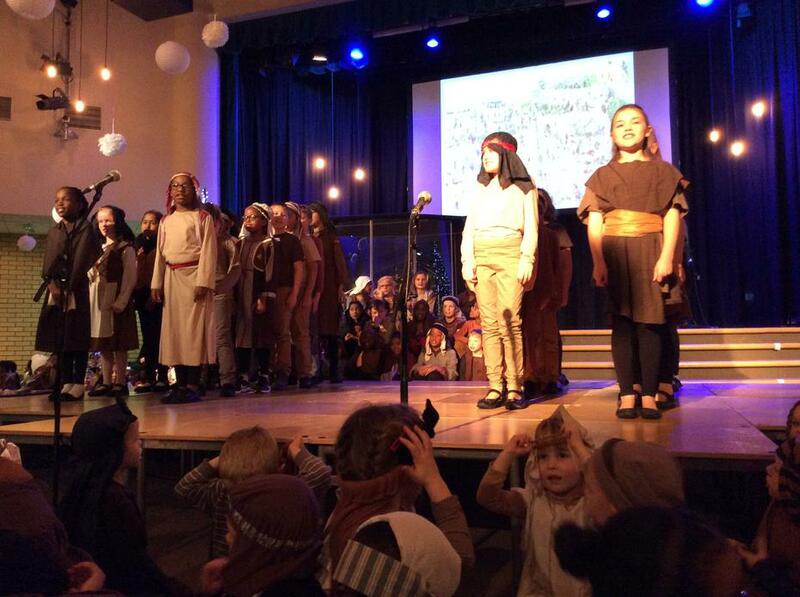 We think we still need to learn more about other religions too. 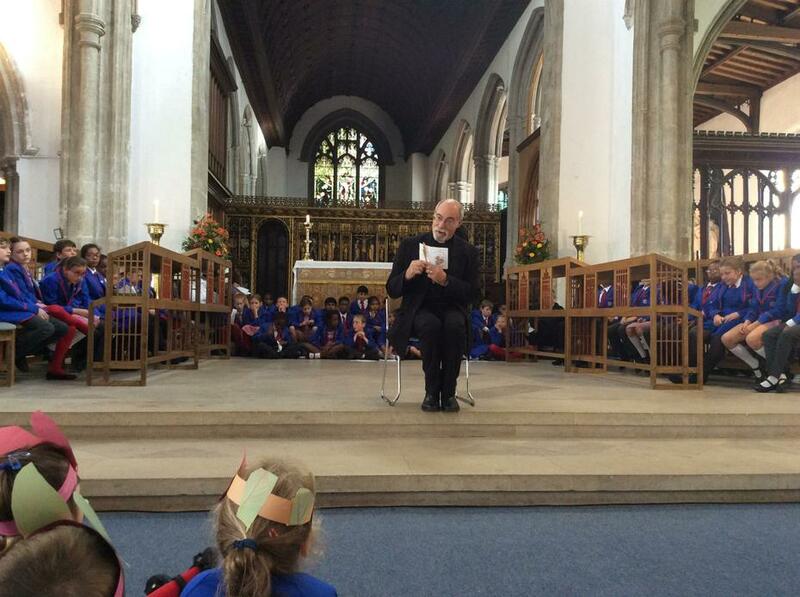 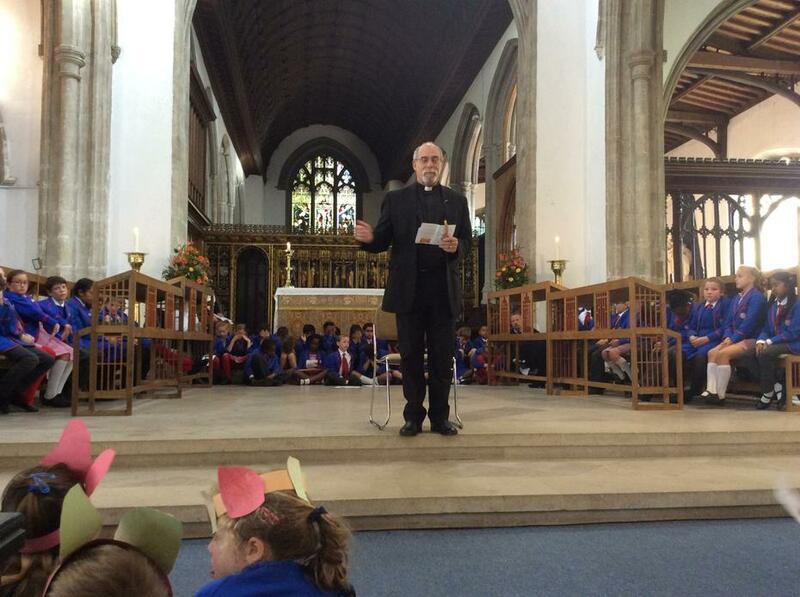 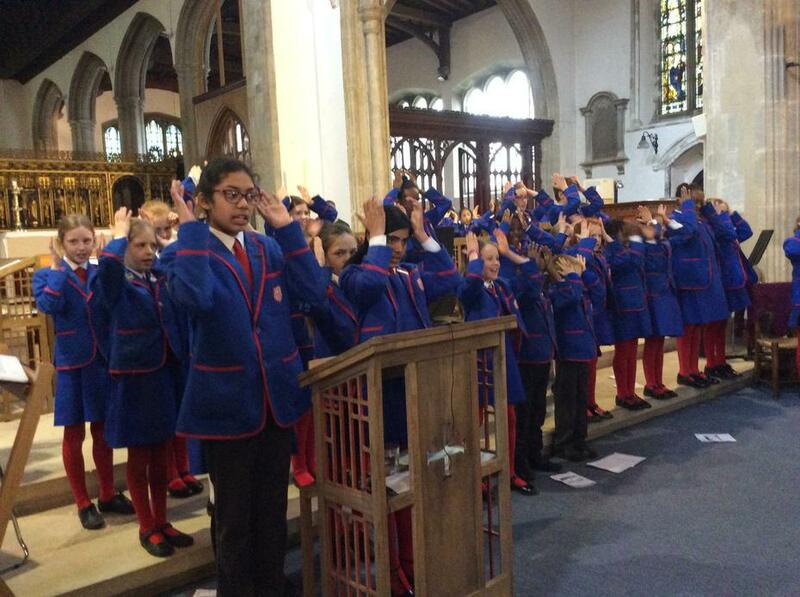 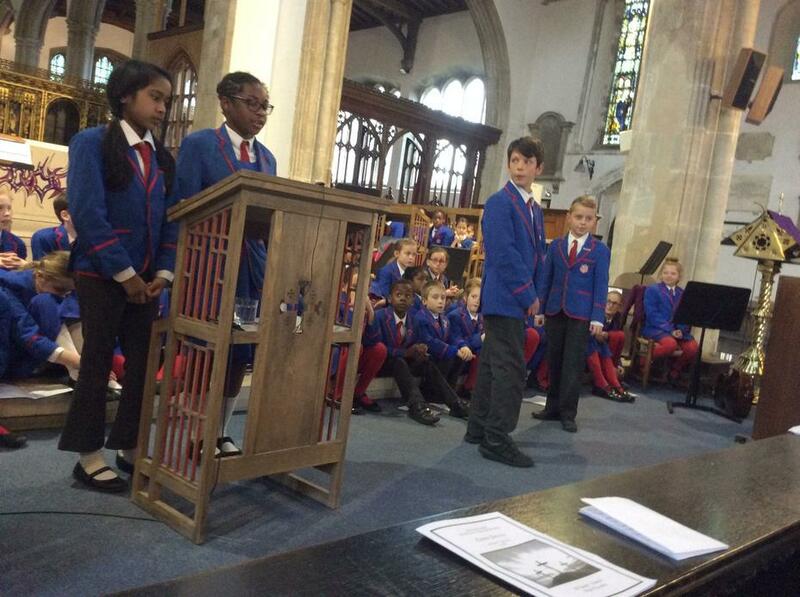 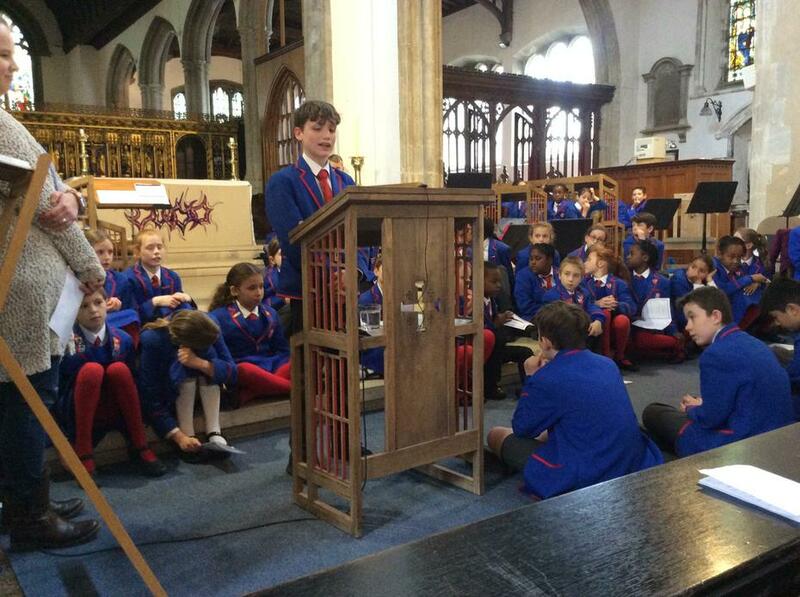 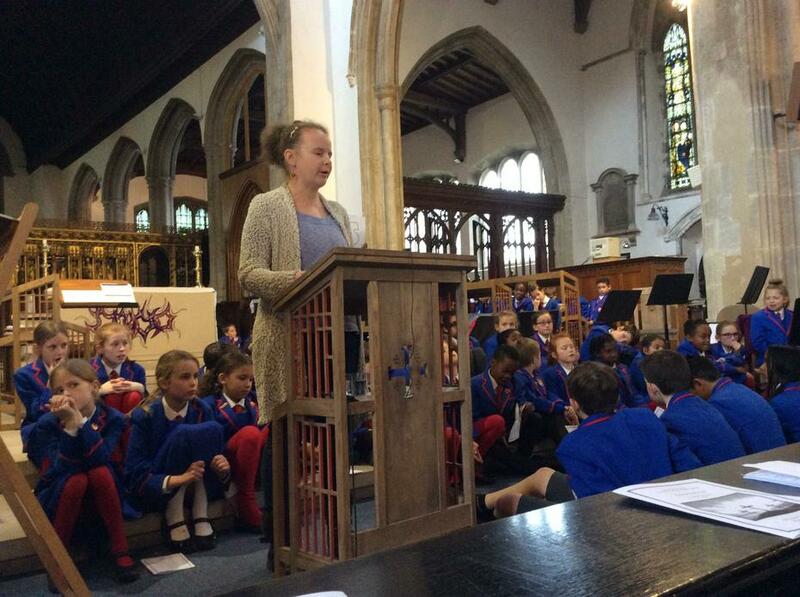 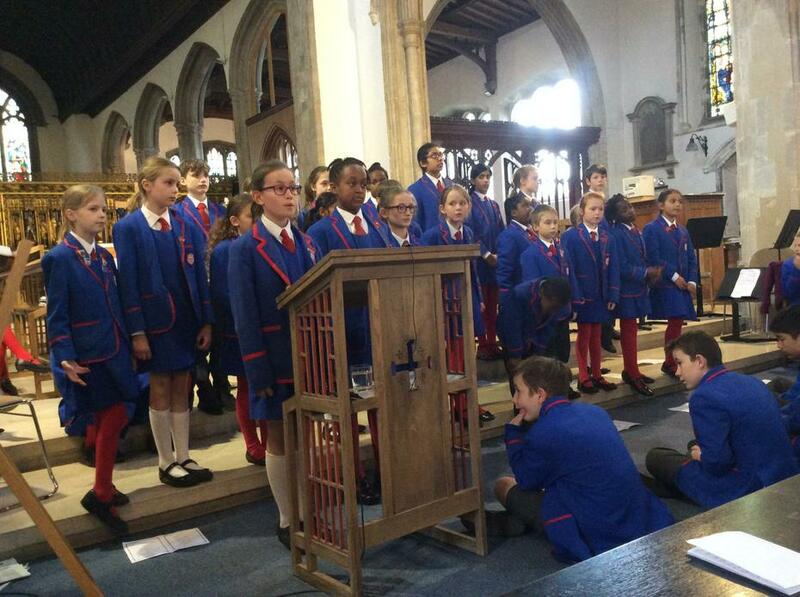 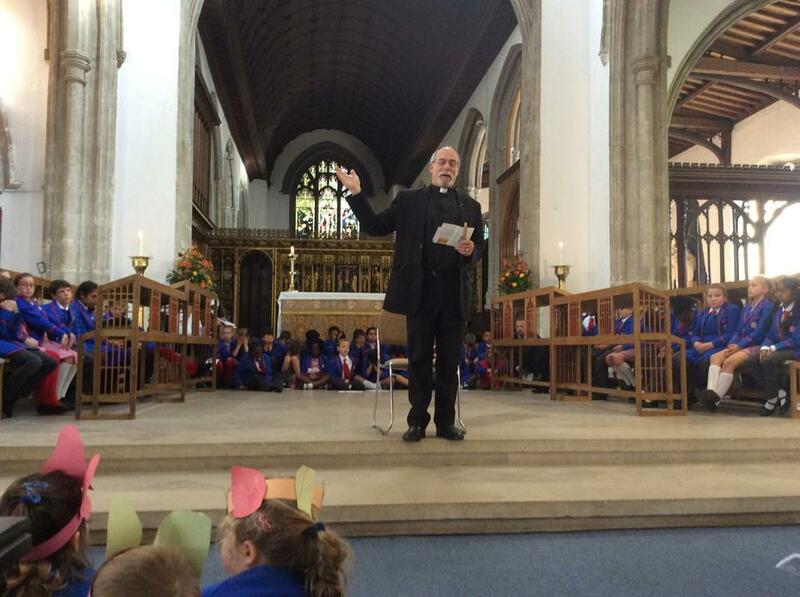 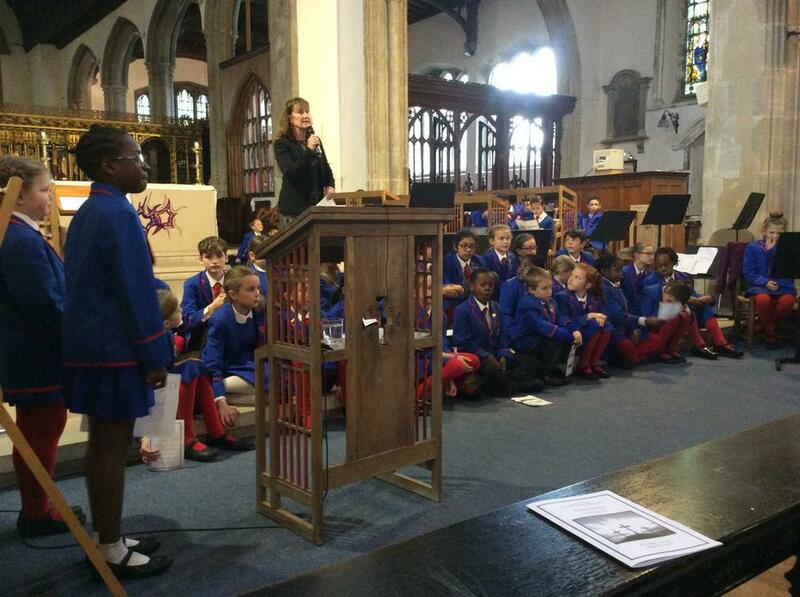 Rev Ellis led a Whole School Blessing today which was a great way to start the year. 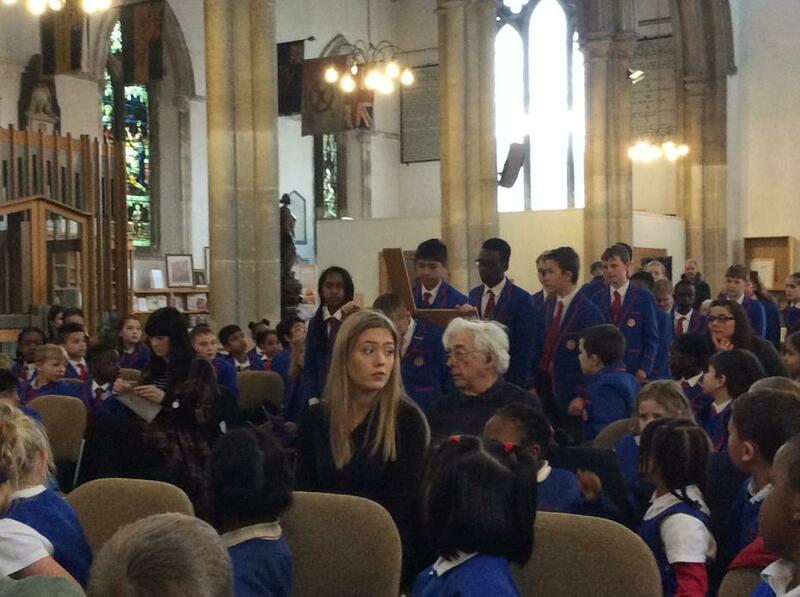 Rev Ellis, Ruth Harley, Mrs Ayres, Ms Jongu and Mrs Tersteeg visited all the classes and key areas of the school. 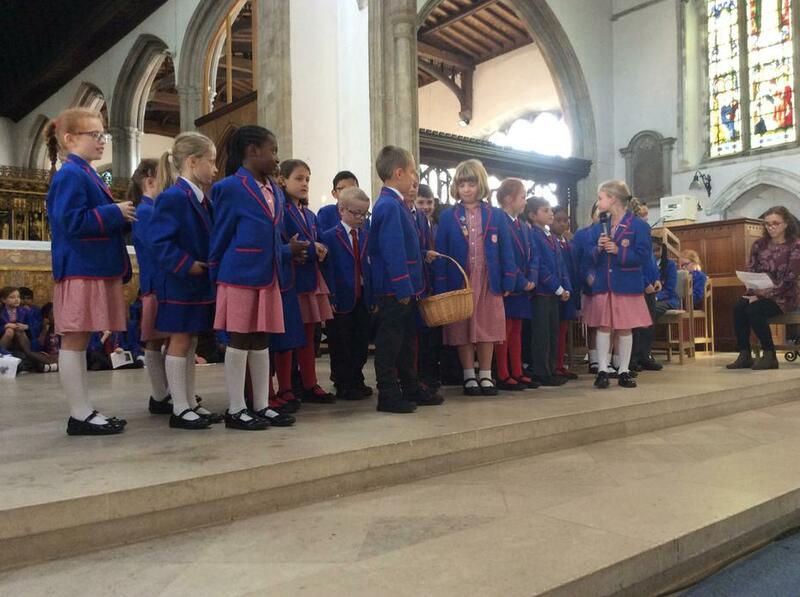 Then the whole school all gathered in the hall and received a whole school blessing and sang ‘Thank You Lord’ whole heartedly. 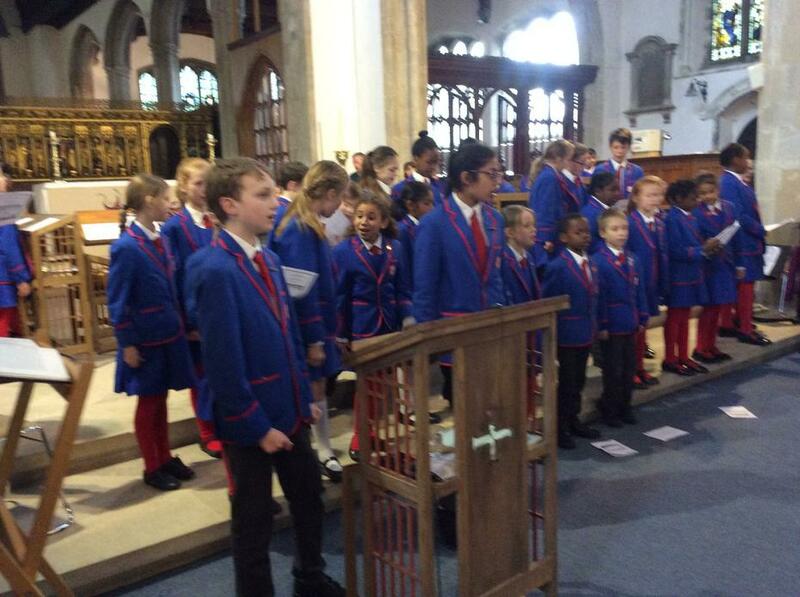 The children responded with some very thoughtful prayers for their year groups and enjoyed the experience of being sprinkled with Holy Water. 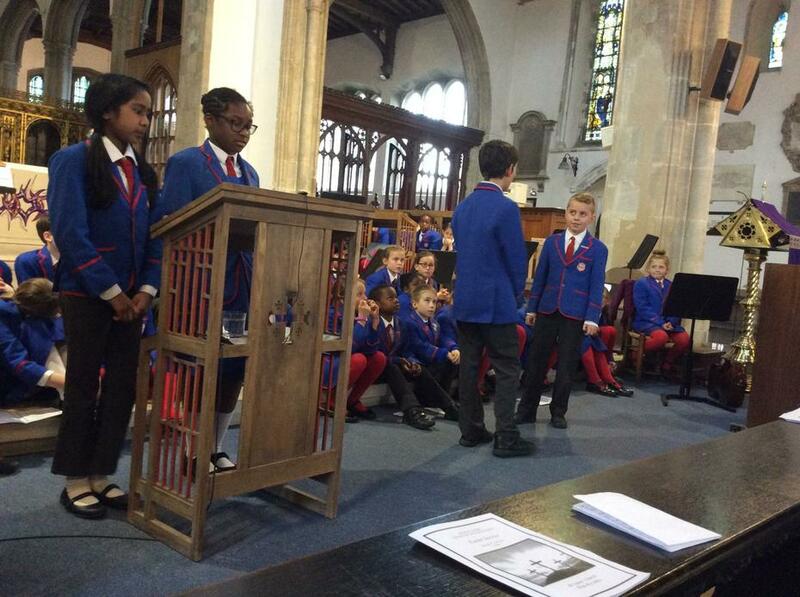 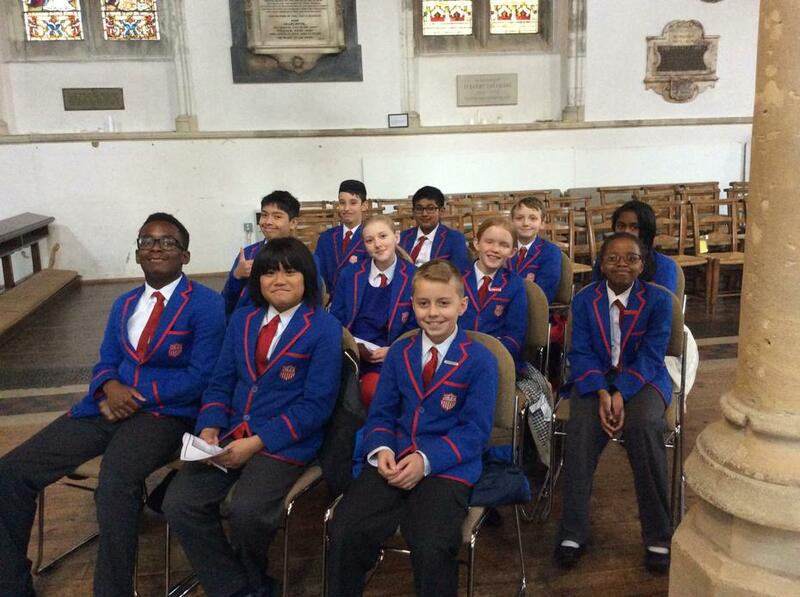 Each year group are asked to decide on a Citizenship Project that will support the local community. 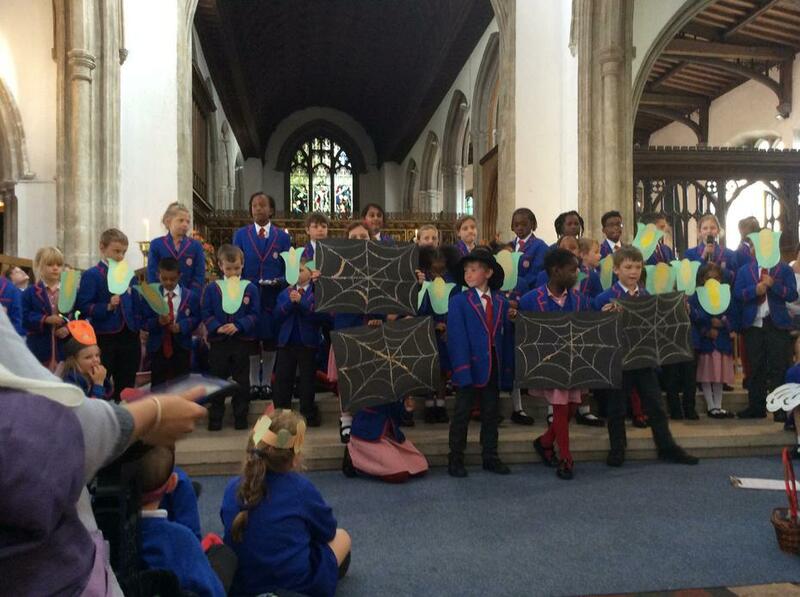 Then throughout the year the children complete activities or make visits that support their chosen project. 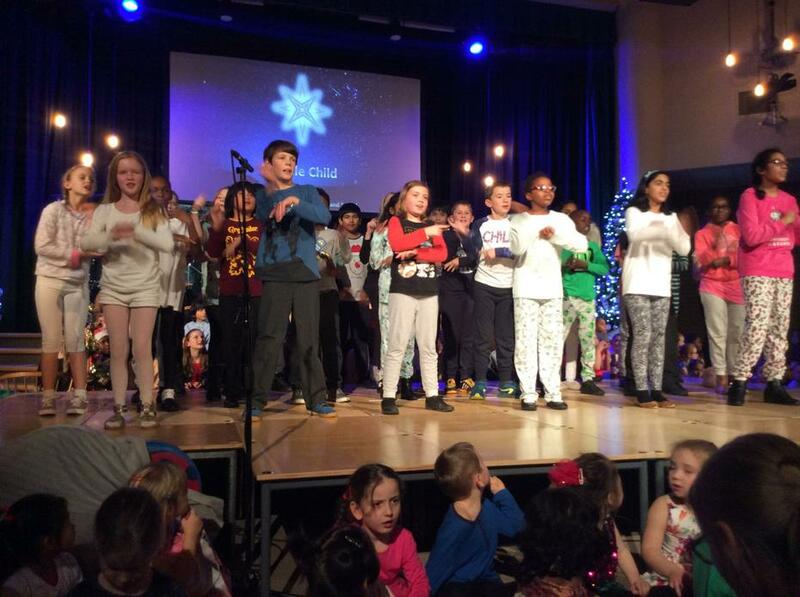 If you visit the class pages for each year group you will be able to see pictures and feedback on what has been achieved so far this year. 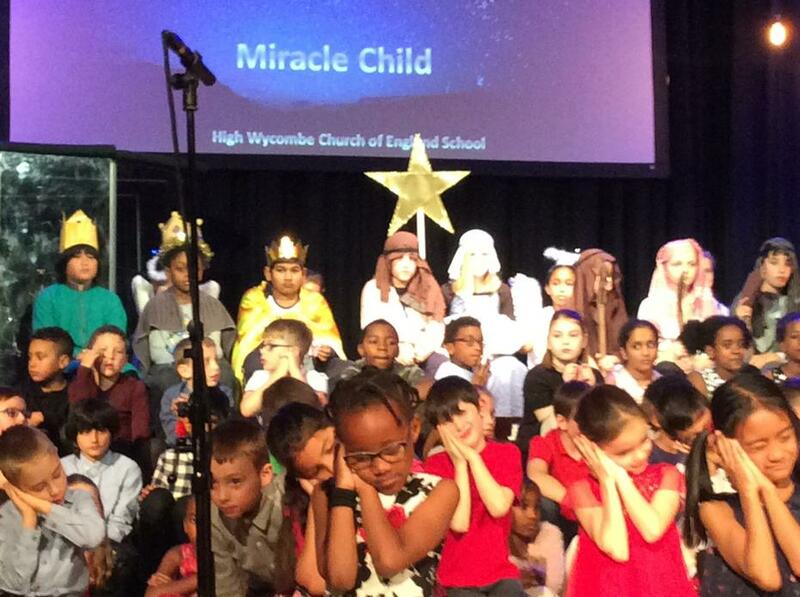 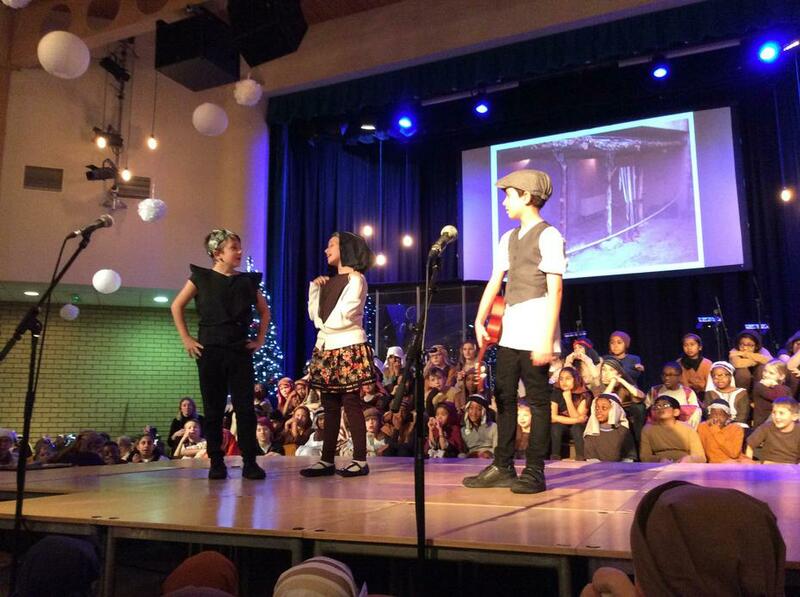 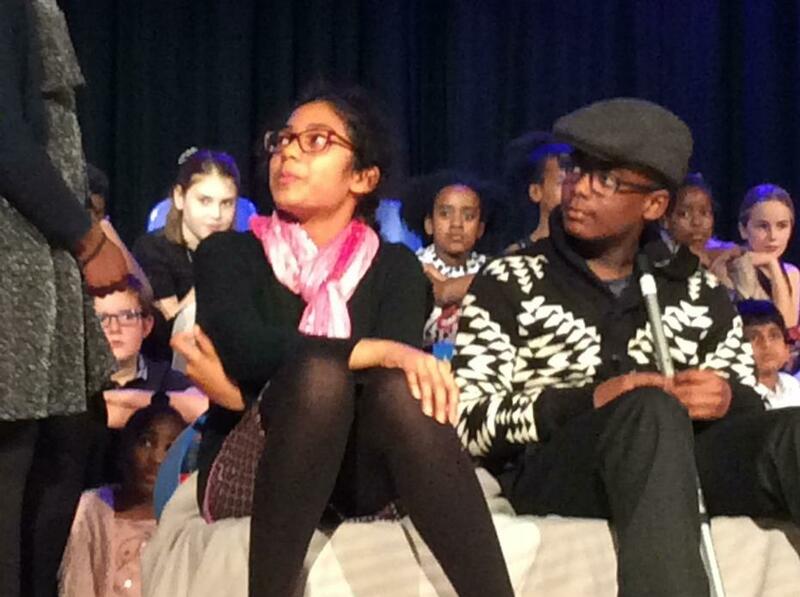 Godly Play is a child centred, “wondering” approach to RE teaching. 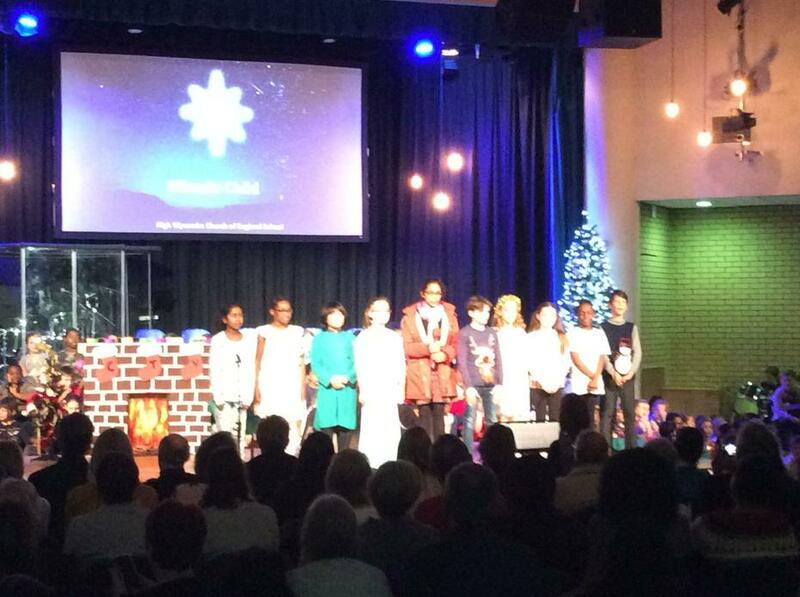 It encourages, challenges and nourishes their spiritual quest as well as enriching their biblical knowledge. 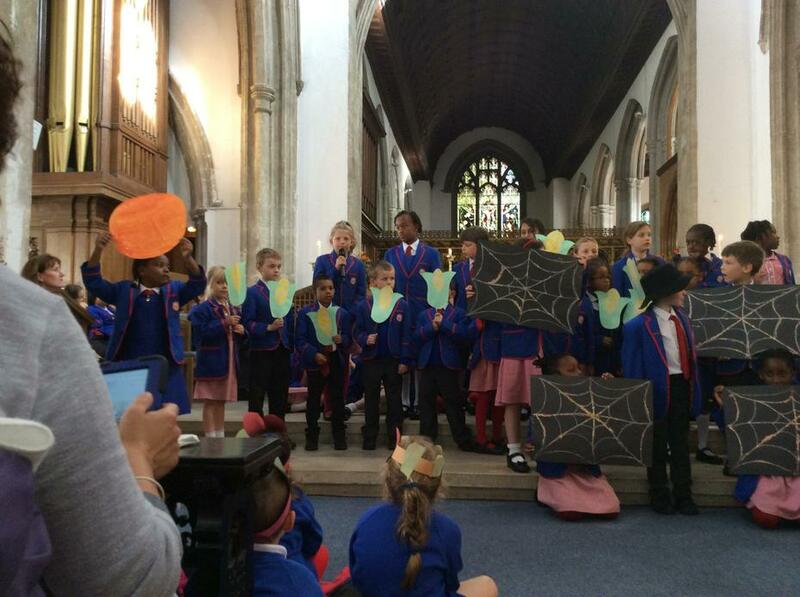 The stories are told by the storyteller, using beautiful resources which are kept on display on the shelves. 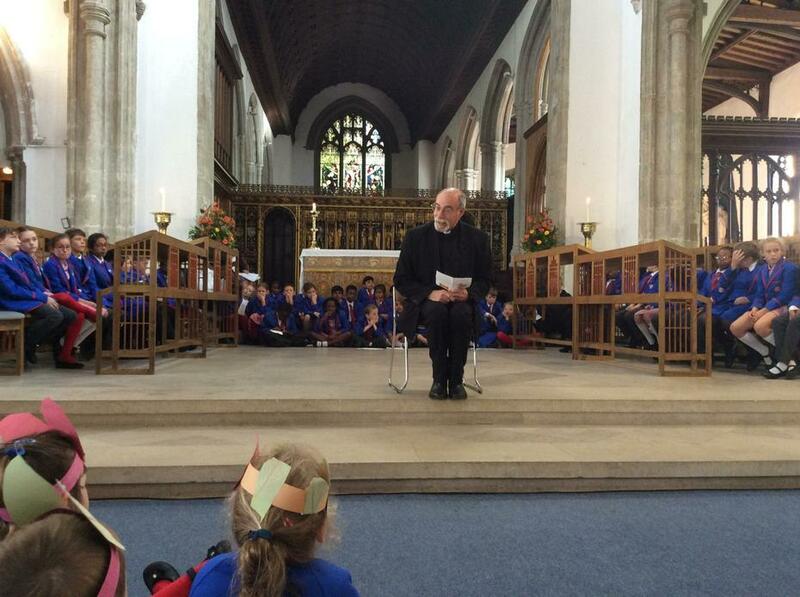 The children are invited to respond, often by adding their own thoughts to the prompt 'I wonder....'. 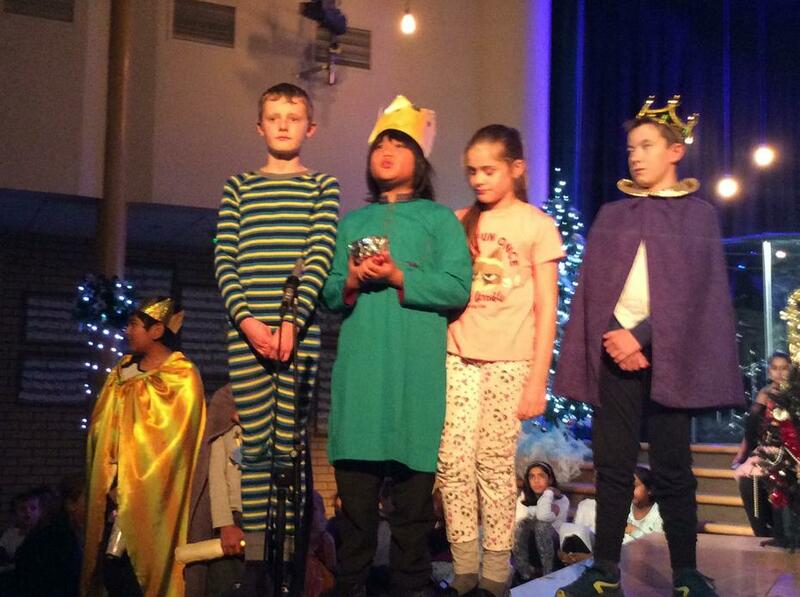 After the story session, the children respond further through various creative activities, using resources kept on dedicated shelving in the room. 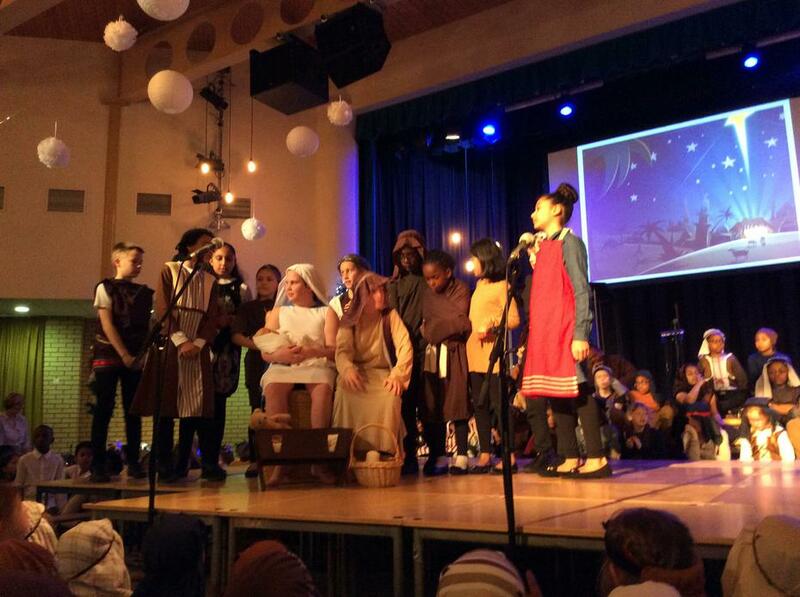 The stories told are separated into three areas - the Old Testament stories of the people of God, the parables of Jesus, and the liturgical area, which is based on the Church Year, and includes the story of the Holy Family. 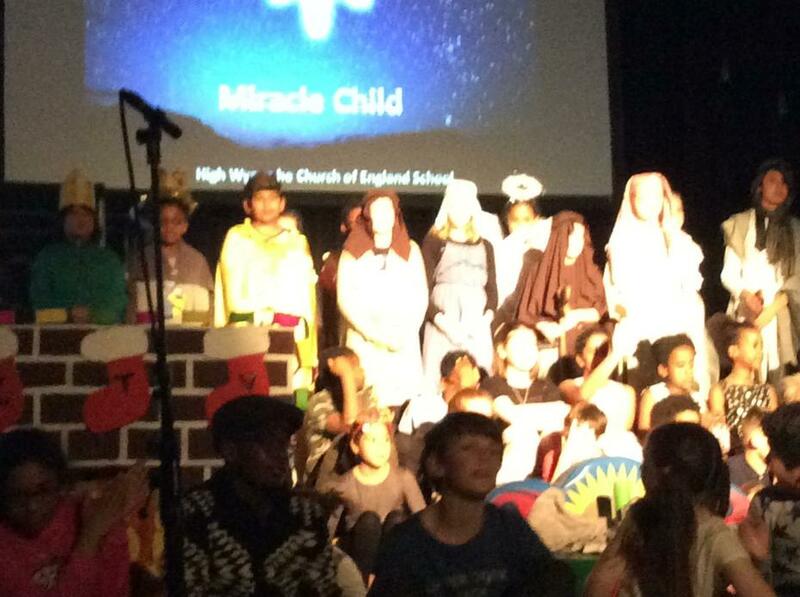 The nativity scene figures are on display as a focal point for the Godly Play room, set on a cloth of the liturgical colour for the time of year, with the figure of the Risen Christ behind. 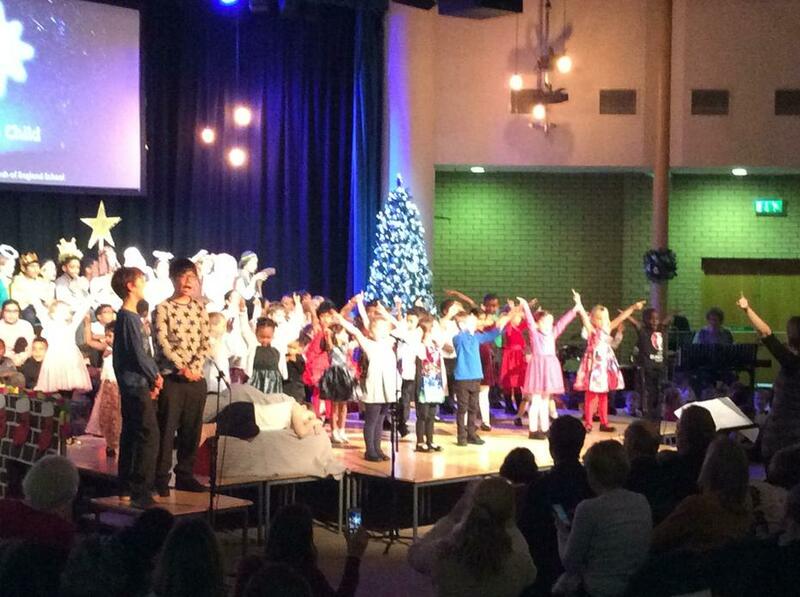 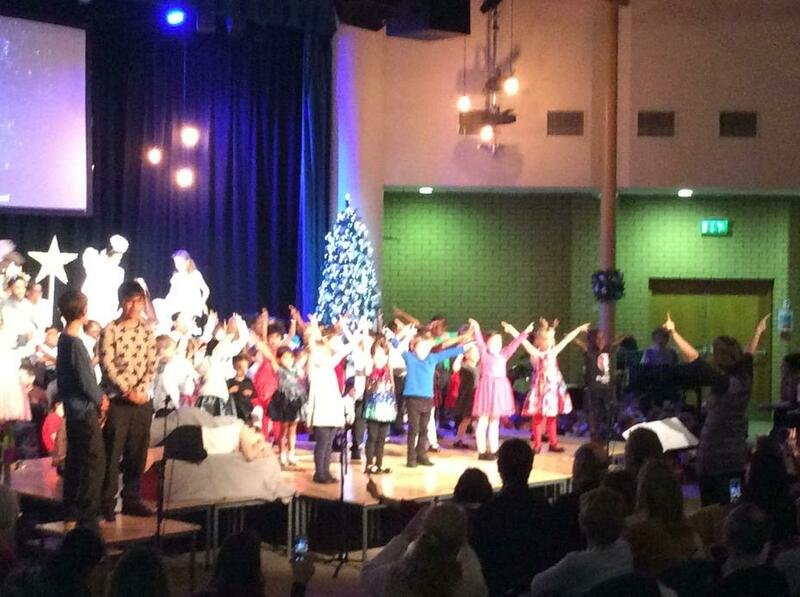 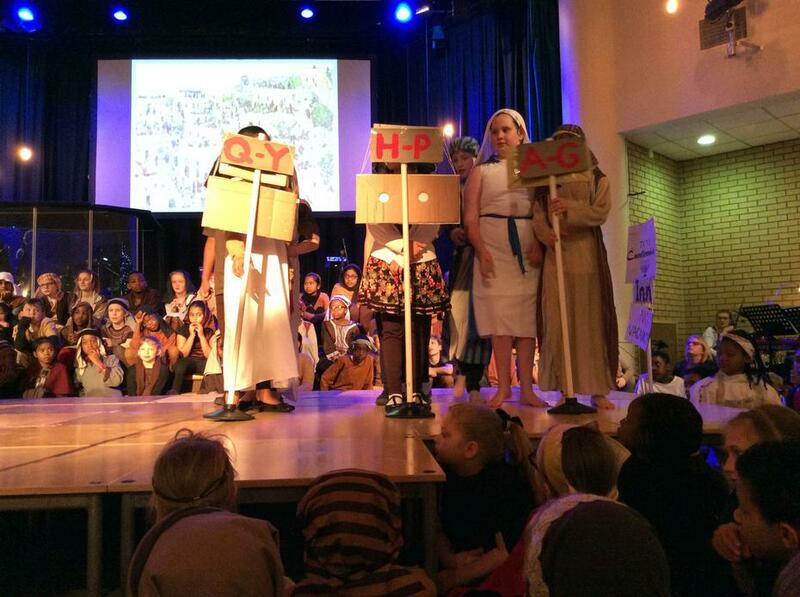 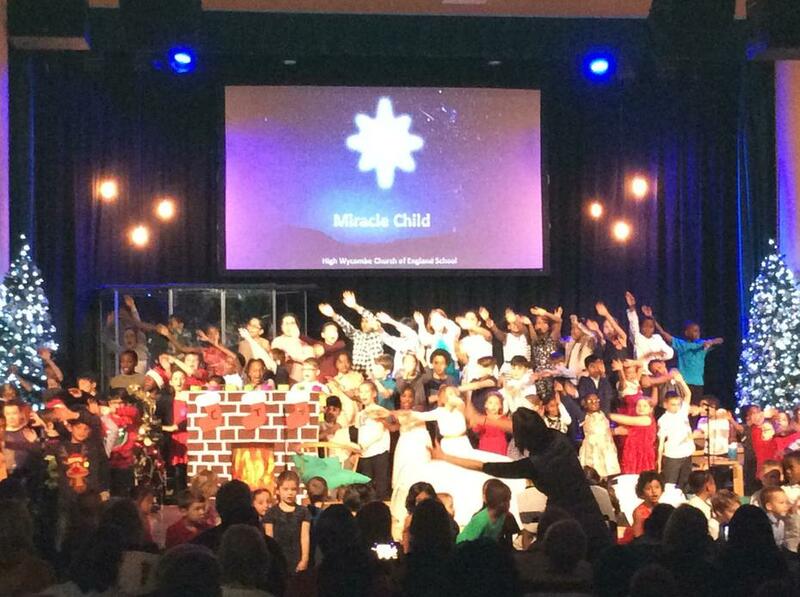 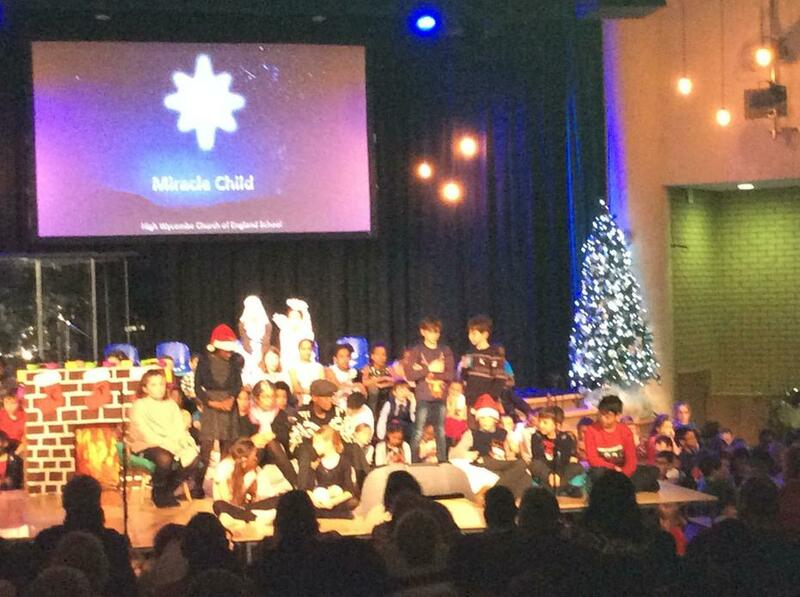 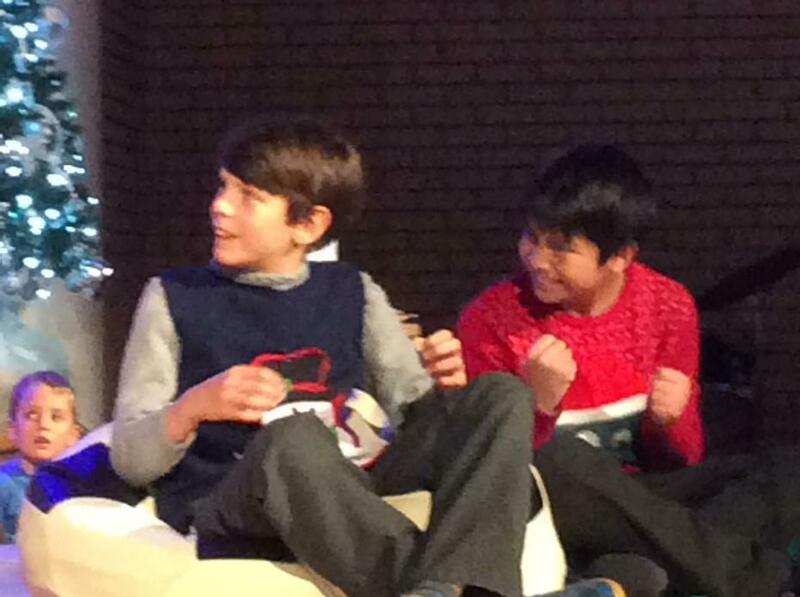 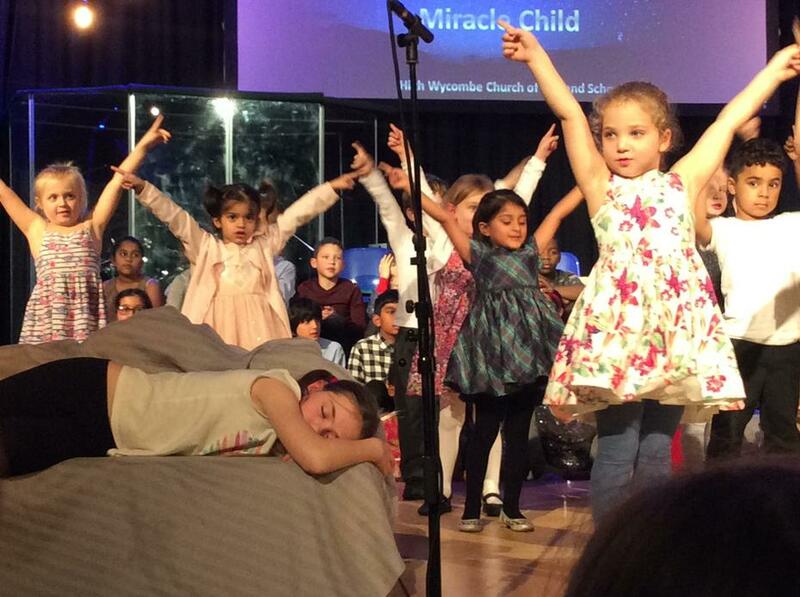 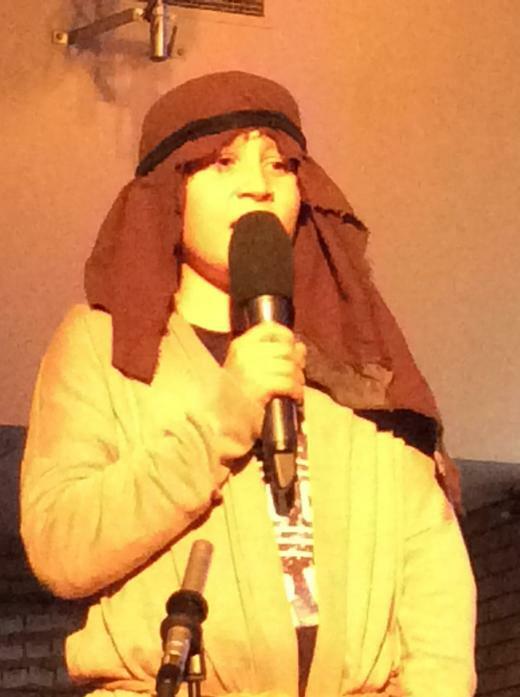 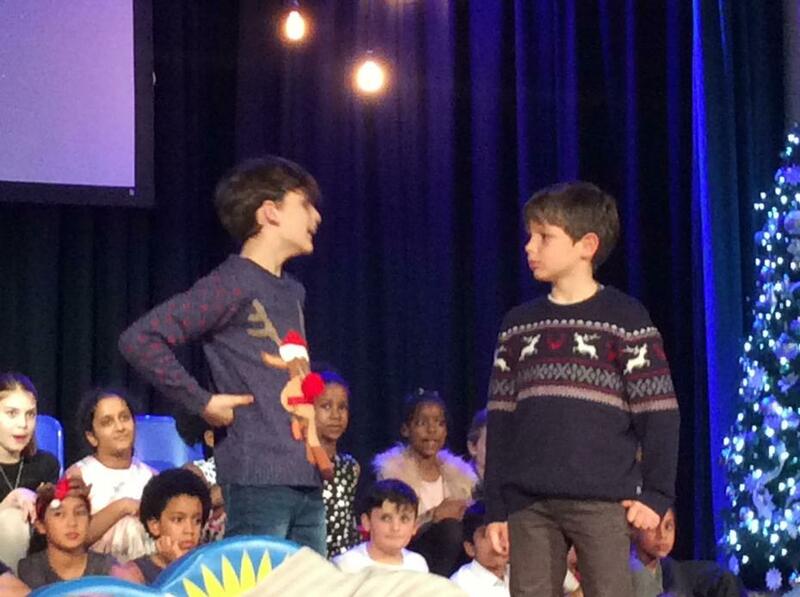 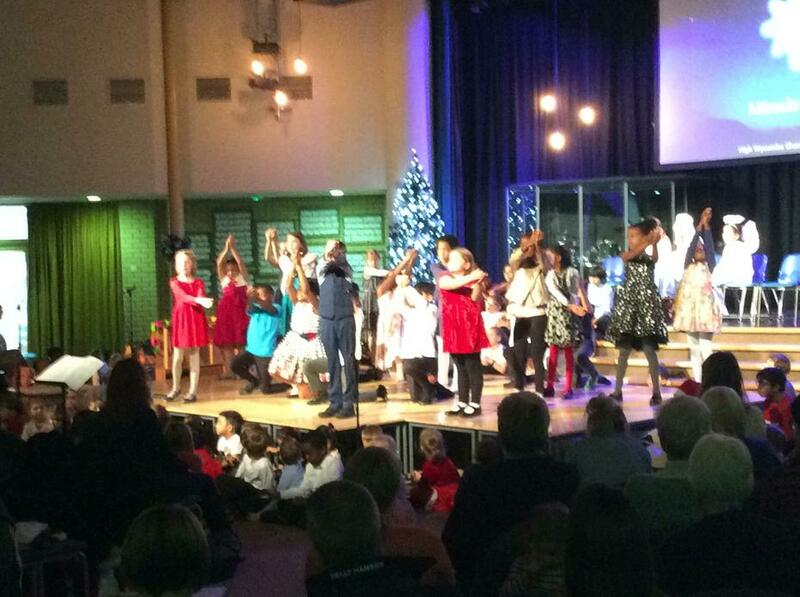 The children at HWCE School have one session of Godly Play each term. 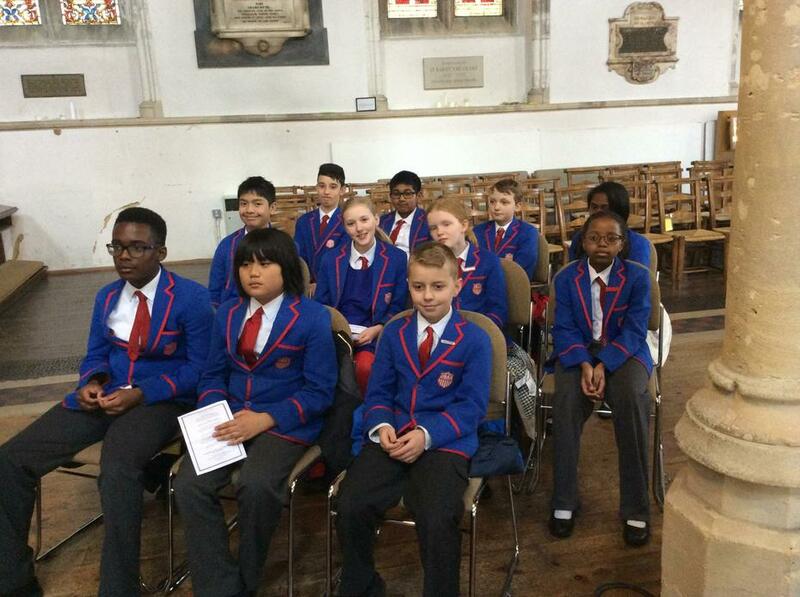 For the spring and summer term this year we will be looking at “Knowing God”. 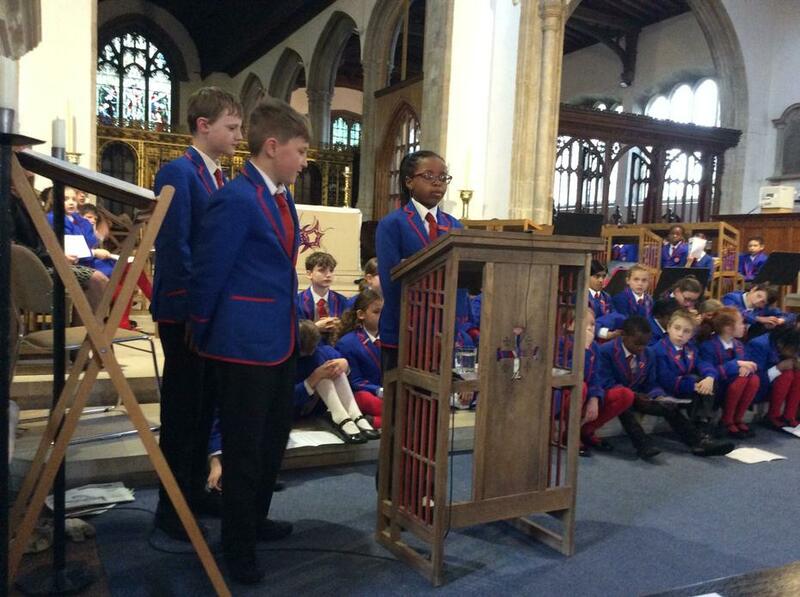 We will talk about the Trinity, how God is a trinitarian God, at each person of the Trinity in turn, how God is “one person in three”, why God made us, what the “Fatherheart of God” means, Jesus as our friend and Saviour, why Jesus said he would send the Holy Spirit when He left the earth and His role in our lives. 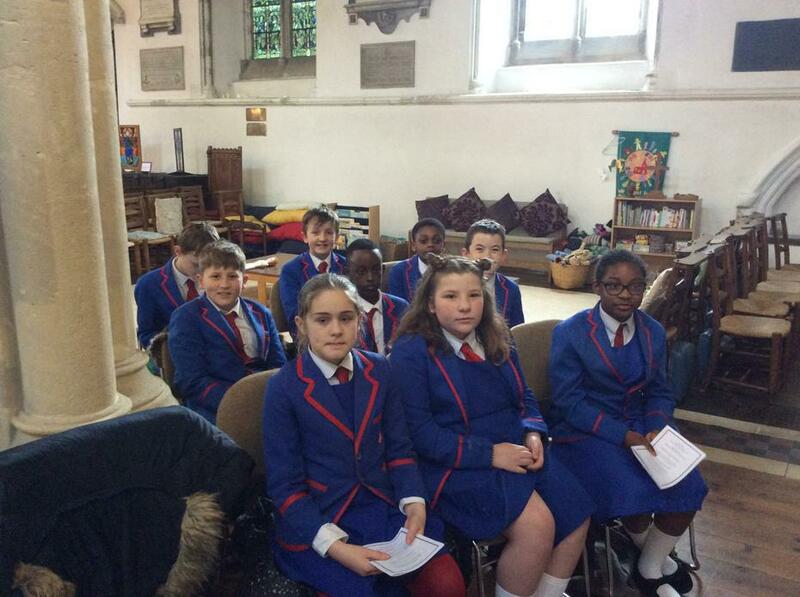 Then we will talk of what it means to be a follower of Jesus for us personally and then look at the children's individual questions: what they find difficult to understand. 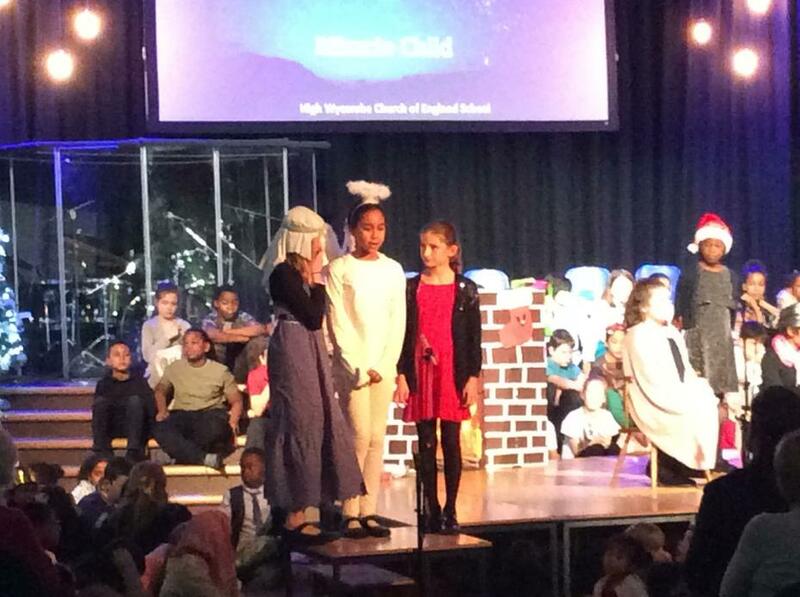 Our goal: To deepen the children’s understanding of God and His continual forgiveness of and love for man, what Grace is within the context of Justice, Mercy and Grace and for the children to grow a personal understanding and to reflect on how it will impact on them as individuals. 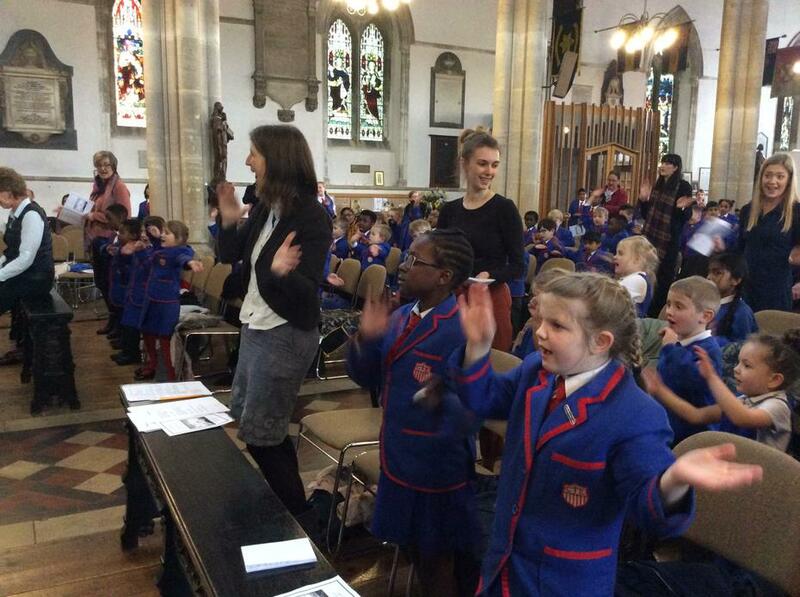 Prayer and Praise Lunchtime Club - worship through quiet reflection, expressive dance and songs. 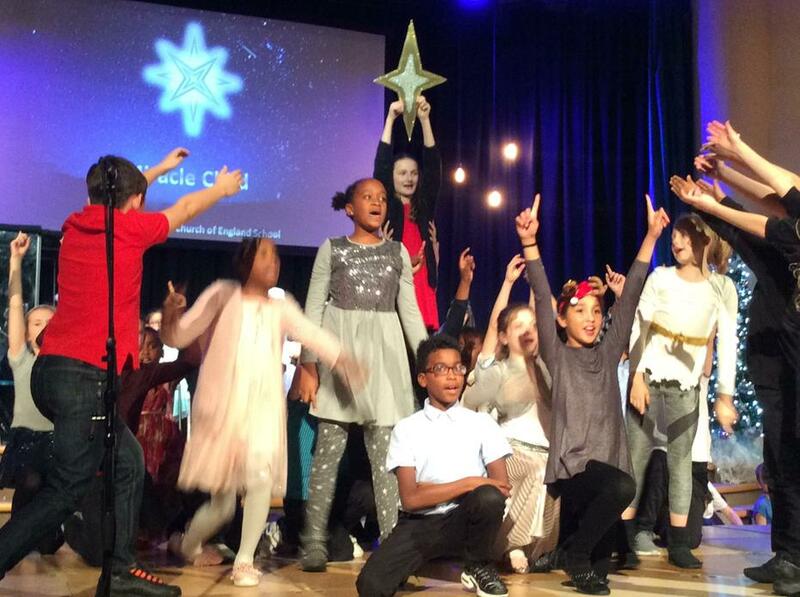 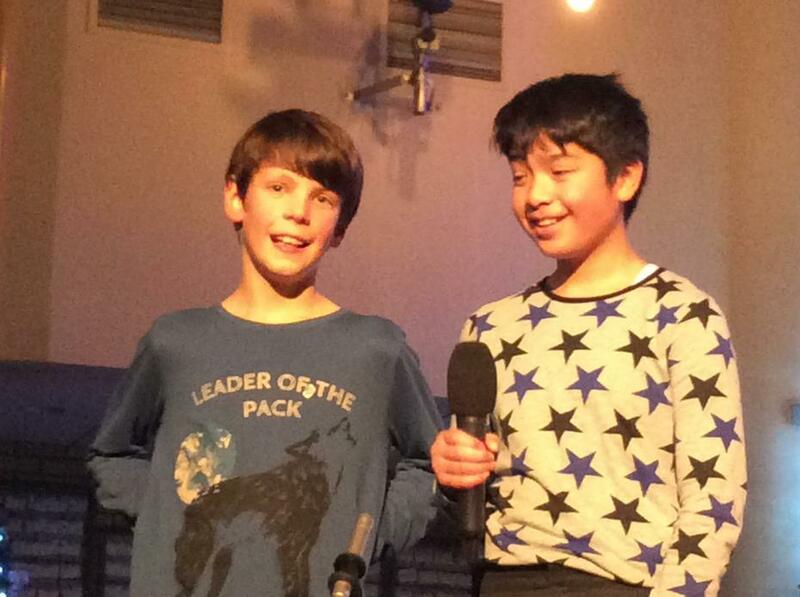 After sending in an audition tape to be part of the PP4S Massed Choir and join the All Souls Orchestra Year 5 had an amazing evening of song and worship at The Royal Albert Hall. 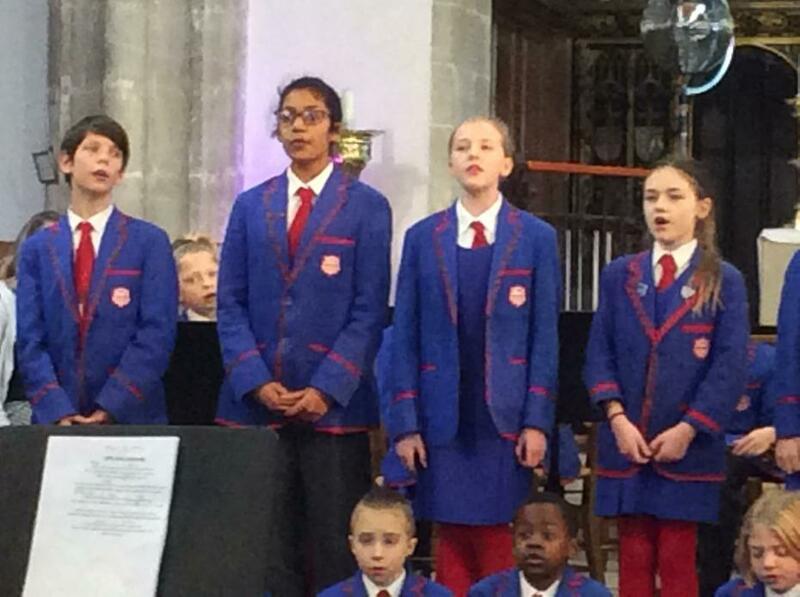 It was a delightful blend of sacred and concert music, a unique and joyful fusion of performance with worship, combining the spirit of Songs of Praise with the enthusiasm of the world-famous Last Night of the Proms. 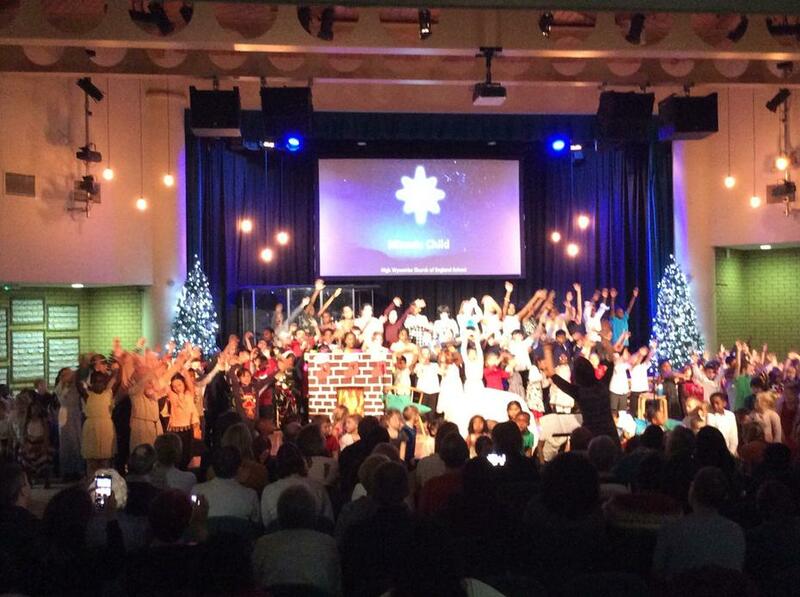 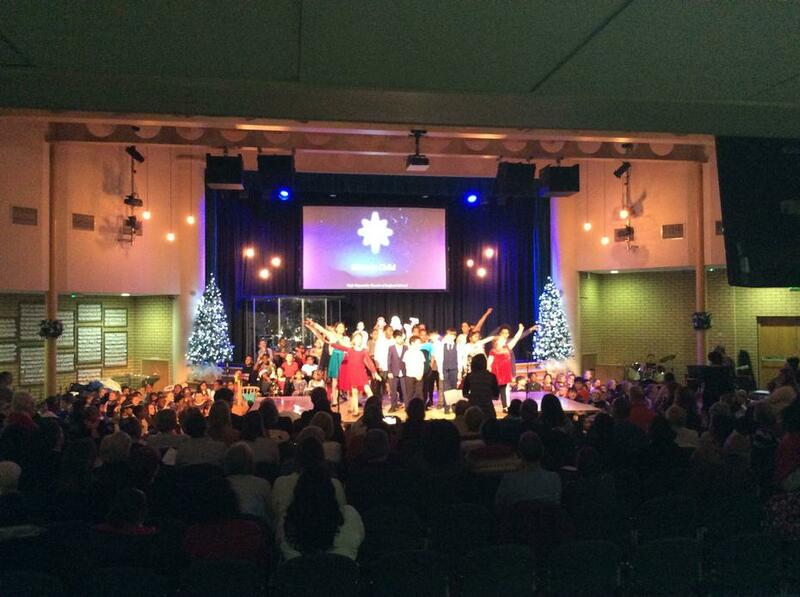 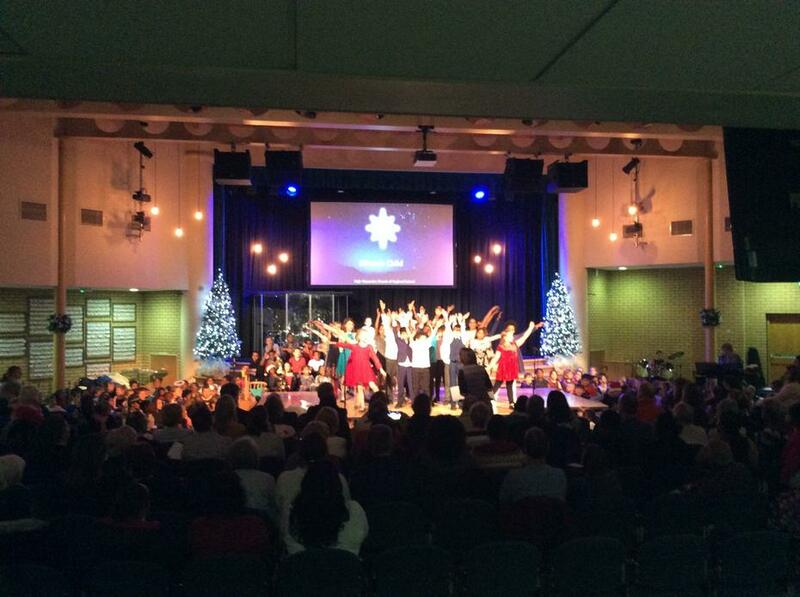 A celebration of the Christian Faith on a grand scale! 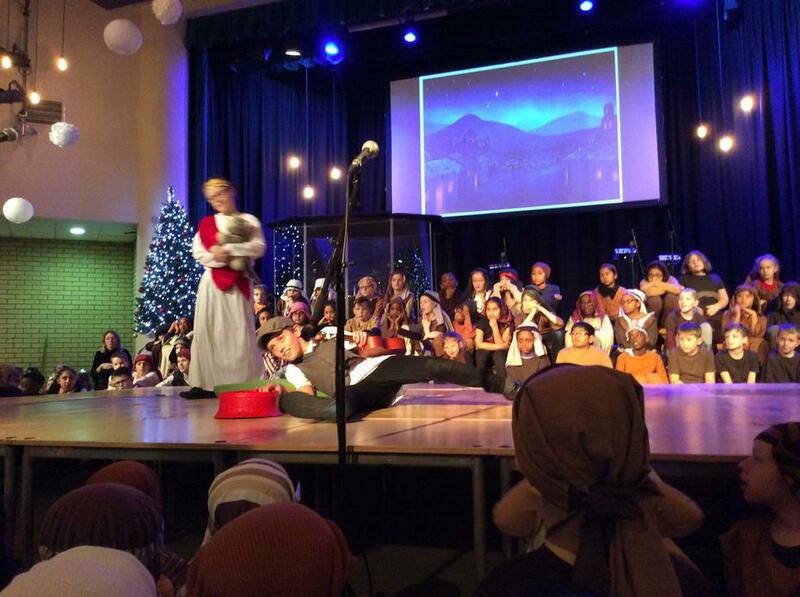 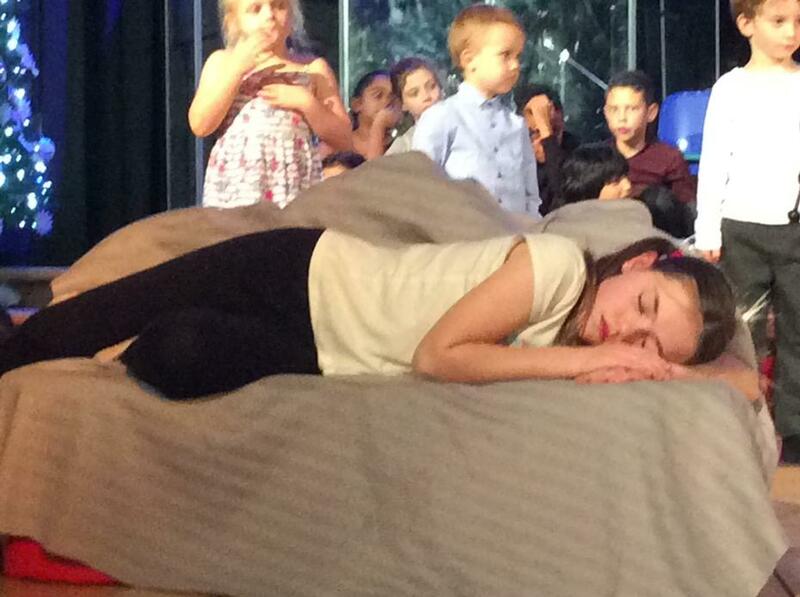 The worship retold the story of the Prodigal Son in his search for freedom. 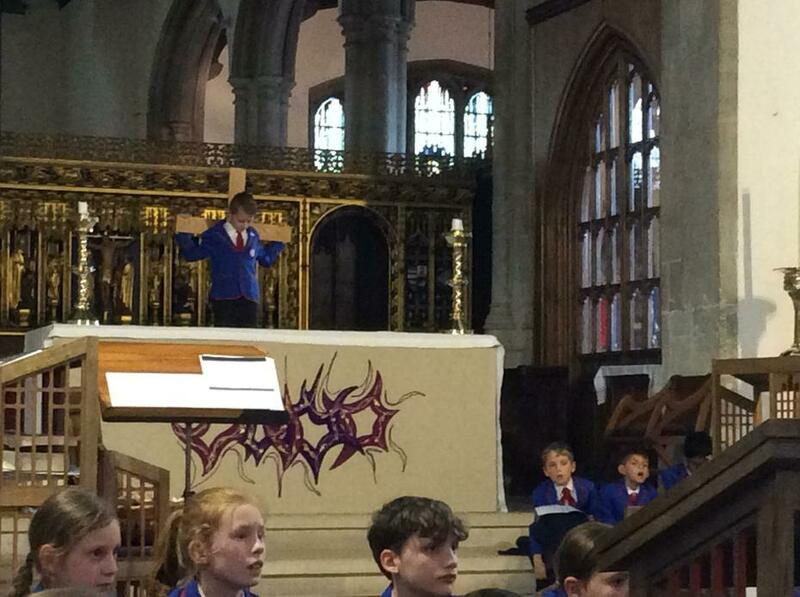 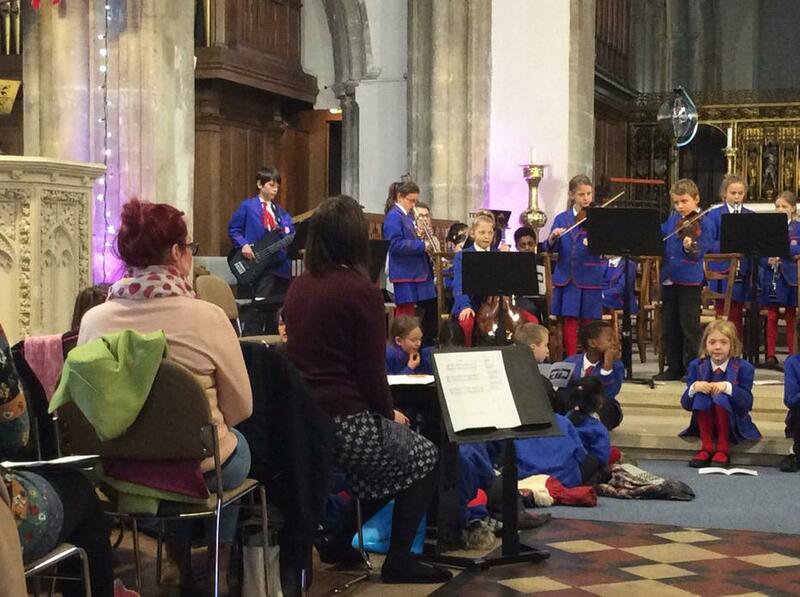 VOL activities are a set of pupil activities devised by the Diocese of Worcester. 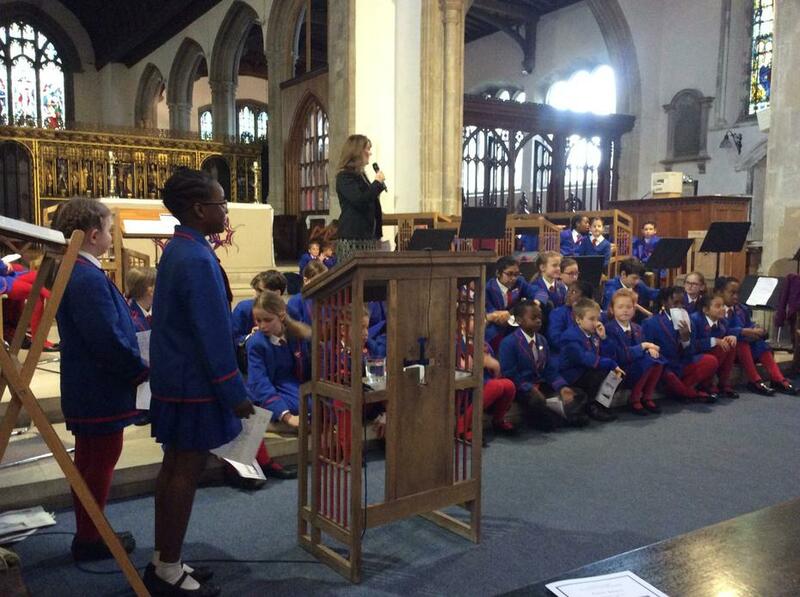 They are activities for Church schools which enable our pupils to contribute to the SIAMS process - the Statutory Inspection of Anglican and Methodist Schools. 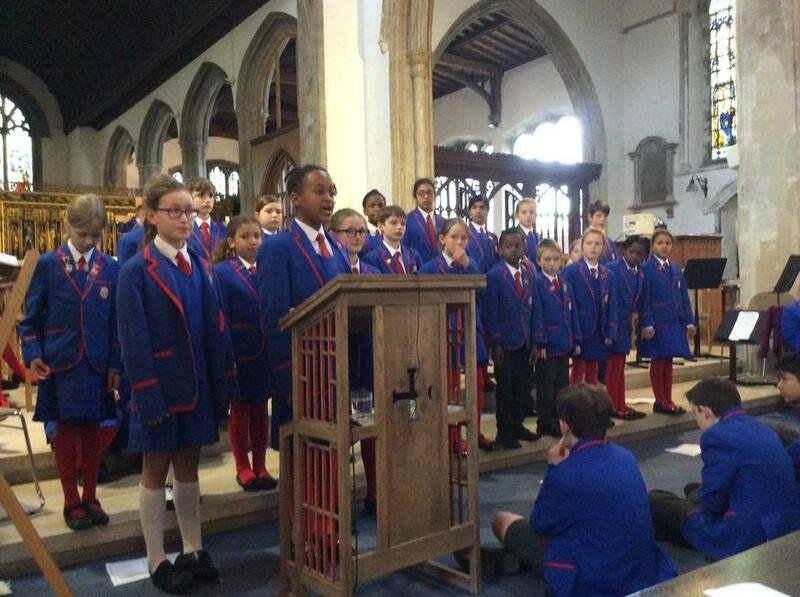 'LISTENING TO THE VOICE OF THE LEARNER' has been developed to assist schools in the task of enabling pupils to contribute effectively to this self evaluation process and to allow the voice of the learner to be heard. 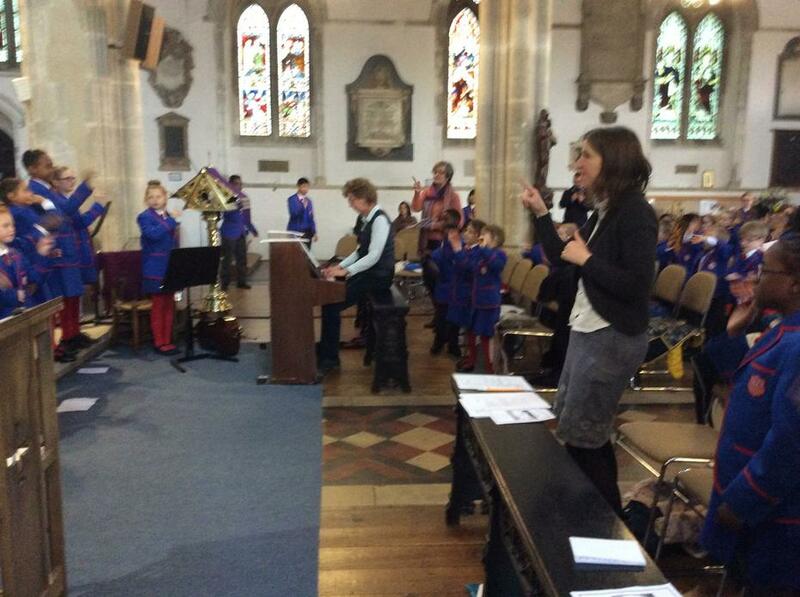 The children take part in a VOL session every half term. 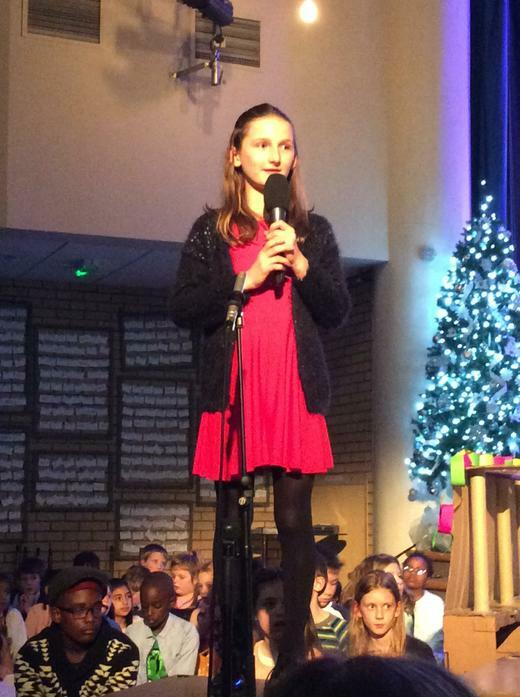 "The spirit at school makes me feel special"
"The teachers smiling at me when I hold the door"
"My friends make me feel special"
"Moving my peg up the Rainbow Chart"
"Everyone makes me feel valued"
"Nice friends and teachers make me feel special"
"Not everyone has a school like this"
"I learn new things every day"